Letters and Papers, Foreign and Domestic, Henry VIII, Volume 19 Part 2, August-December 1544. Originally published by His Majesty's Stationery Office, London, 1905. I have received your Lordships' letters of the 25th inst. marveling that complaint was made there of the excess of prices of victuals here without the lack being first declared to us. Although things come not in such plenty as they did before the countries hereabouts were destroyed and the King had no army on this side, victuals are at present as cheap as ever they were since I came hither. The report made of me is utterly untrue. I remember how one came to me for the transporting of certain horses, to whose request I agreed and told him that for the price he must agree with the master of the ship. He said the master demanded 3s., which was unreasonable: and thereupon I and Mr. Treasurer awarded that but 2s. should be paid for every horse. I have already written to the mayor of Dover to send hoys and ships for the transportation of the King's horses, and if any men of war come to this coast they shall be warned to attend upon the wafting. Callais, 26 Sept. 1544. 302. The Council with the King to the Council with the Queen. The King has received your letters to him and seen those to us with the rest out of the North, as well those brought this morning by Sir Wm. Herbert as the others by Sir Peter Mewtes and Thomas Bisshoppe. You shall despatch this bearer, Thomas Bisshoppe, to his late master, (fn. n1) with gentle letters of revocation from you and my lady his wife, advertising him that whereas (through the earl of Glenkerne and that false traitor, his son) his good will to serve has not taken effect, the King, upon consultation with him, will take order to revenge the treasons of Glenkerne and his son, to the comfort of the said earl of Lynowx and "terror of all his Majesty's and his enemies in Scotland." You shall also signify to Sir Rice Mauncell, Thomas Audeley and Winter, that the two former, each with his 200, shall repair to their homes, and Winter, after safe conducting them, "spend out his victuals in attending the return of the French ships from the New Lande and otherwise annoy his Majesty's enemies." The offers of Fernehurst and others are not to be accepted unless they will bind themselves to serve the King against all his enemies, "as well in those matters they offer as in all others"; as you shall advertise my lord Warden. The Egyptians you wrote for are to be pardoned and the rest banished; also the other Frenchmen, not in the West, shall remain until the King's further pleasure. "From the Kinges Highnes of Bolloign," 26 Sept. 1544. Signed by Suffolk, Hertford, Lisle, Winchester, Browne and Paget. In Mason's hand, pp. 2. Add. : attendant upon the Queen. 2. Draft of the above in Paget's hand. Pp. 2. Endd. by Mason: M. to my lordes of the Counsell. 303. The Council with the King to Norfolk and Others. Received their letters by the earl of Essex, advertising their opinion to be conformable to the King's for the way of their return, and desiring to know his pleasure upon certain points in a schedule sent apart. Order is already taken for all mentioned in the schedule. The battery pieces should be conveyed with the army, which seems a more honorable way than sending them apart; and indeed, for want of forage, the King has sent all his horsemen to Calais, so that they could not meet the ordnance beyond Hardelot. The King would be loth to have the bridges, boats and brewhouses burnt if they may be brought away. 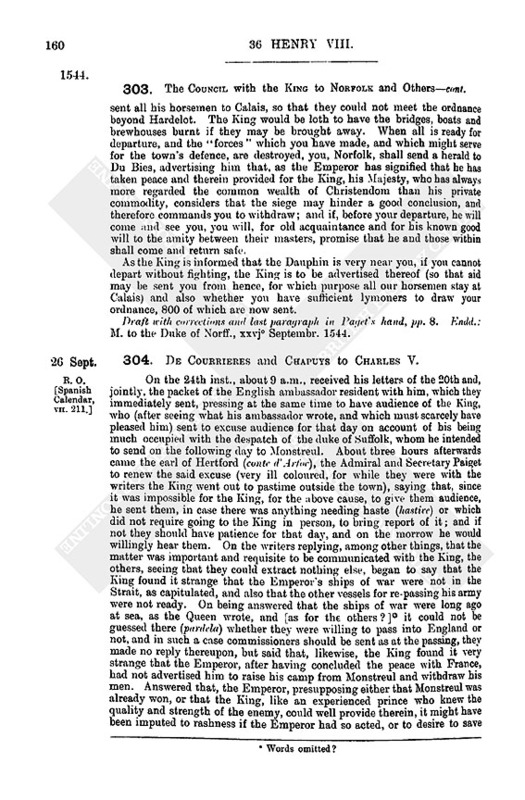 When all is ready for departure, and the "forces" which you have made, and which might serve for the town's defence, are destroyed, you, Norfolk, shall send a herald to Du Bies, advertising him that, as the Emperor has signified that he has taken peace and therein provided for the King, his Majesty, who has always more regarded the common wealth of Christendom than his private commodity, considers that the siege may hinder a good conclusion, and therefore commands you to withdraw; and if, before your departure, he will come and see you, you will, for old acquaintance and for his known good will to the amity between their masters, promise that he and those within shall come and return safe. As the King is informed that the Dauphin is very near you, if you cannot depart without fighting, the King is to be advertised thereof (so that aid may be sent you from hence, for which purpose all our horsemen stay at Calais) and also whether you have sufficient lymoners to draw your ordnance, 800 of which are now sent. Draft with corrections and last paragraph in Pallet's hand, pp. 8. Endd. : M. to the Duke of Norff., xxvjo Septembr. 1544. 304. De Courrieres and Chapuys to Charles V.
On the 24th inst., about 9 a.m., received his letters of the 20th and, jointly, the packet of the English ambassador resident with him, which they immediately sent, pressing at the same time to have audience of the King, who (after seeing what his ambassador wrote, and which must scarcely have pleased him) sent to excuse audience for that day on account of his being much occupied with the despatch of the duke of Suffolk, whom he intended to send on the following day to Monstreul. About three hours afterwards came the earl of Hertford (contc d'Arfoc), the Admiral and Secretary Paiget to renew the said excuse (very ill coloured, for while they were with the writers the King went out to pastime outside the town), saying that, since it was impossible for the King, for the above cause, to give them audience, he sent them, in case there was anything needing haste (hastire) or which did not require going to the King in person, to bring report of it; and if not they should have patience for that day, and on the morrow he would willingly hear them. On the writers replying, among other things, that the matter was important and requisite to be communicated with the King, the others, seeing that they could extract nothing else, began to say that the King found it strange that the Emperor's ships of war were not in the Strait, as capitulated, and also that the other vessels for re-passing his army were not ready. On being answered that the ships of war were long ago at sea, as the Queen wrote, and [as for the others?] (fn. n2) it could not be guessed there (pardela) whether they were willing to pass into England or not, and in such a case commissioners should be sent as at the passing, they made no reply thereupon, but said that, likewise, the King found it very strange that the Emperor, after having concluded the peace with France, had not advertised him to raise his camp from Monstreul and withdraw his men. Answered that, the Emperor, presupposing either that Monstreul was already won, or that the King, like an experienced prince who knew the quality and strength of the enemy, could well provide therein, it might have been imputed to rashness if the Emperor had so acted, or to desire to save the pay of the men under Mons. de Bueren's charge; moreover, as to the conclusion of peace by the Emperor, at which they were astonished, the writers were certain that the King, like a virtuous and wise prince, having well considered the whole, would be quite satisfied. And the writers agreed to write to the Queen and Mons. de Reulx to furnish victuals on the side of St. Omer, provided that the King sent commissaries thither. After this, with which they showed themselves satisfied, they said that they would go at once to the King and thought that, if possible, he would still give audience that day. However, it was impossible, as the King was in the fields and did not return until very late. Next day, after dinner, were with the King, and explained as graciously and courteously as they could the charge contained in the Emperor's letters, beginning with the thanks therein mentioned, which he took well, not understanding, however, the last, as to his opinion about the marriage of Orleans (for, forgetting the alternative, he began to say that since the peace was concluded there was no need of other determination, but, being reminded of the alternative, he showed himself satisfied). Coming to the principal matter, he could not take it well (bien gouster), wishing somewhat to deny having given such answer to Mons. d'Arras as the writers affirmed, and he found it strange that the Emperor should have concluded peace without concluding that which concerned him, and should have had more regard to a duke of Savoy and a duke of Mantua than to him, who had ever been so useful a friend and had sustained so much expense; and, what was more, he marvelled that, at least, the Emperor had not obtained an abstinence from war between him and the French, so that he might more honorably withdraw his army, which he was determined to withdraw after offering battle to the enemy if they would have it; and that the aid proffered by the King of France against the Turk should not have moved the Emperor to the said peace, for according to his news there was no question whatsoever of the movement of the said Turk. And, likewise, the King made the same claims and complaints touching the ships of war and hoys for transport as had been made by the said Arfoc, the Admiral and Paget. 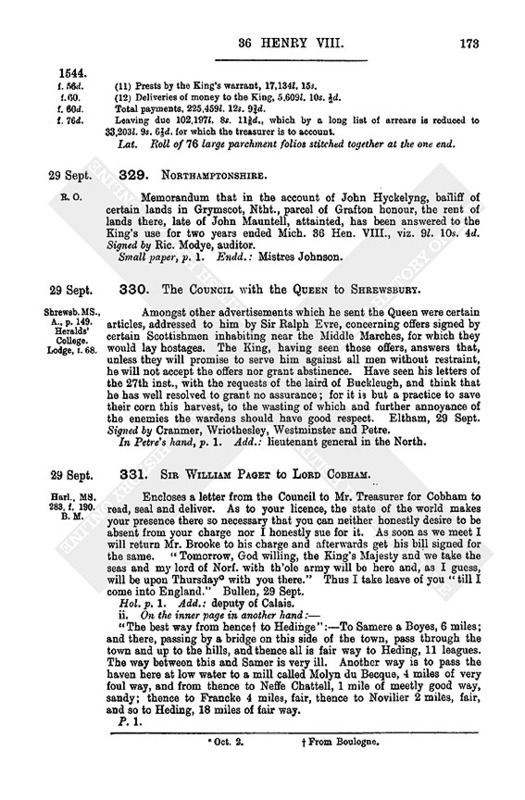 Upon all which objections (having presented the bill enclosed in the Emperor's said letters concerning the submissions therein mentioned) the writers made sufficiently pertinent answers and, in addition, the representations which they thought might serve; so that he seemed half satisfied and told them in conclusion that he would communicate the whole to his Council and afterwards let them know what to write to the Emperor and also to Mons. d'Arras. Find the King silent and pensive, with none of his usual boastful manner, but in the same mood in which he has continued since the French ambassadors began to demand congé and he had some wind of the said peace; and, from the language of the King and his people, the writers believe that the dullness and sadness chiefly proceeds from fear that there may be shame and harm at the retreat of his army. 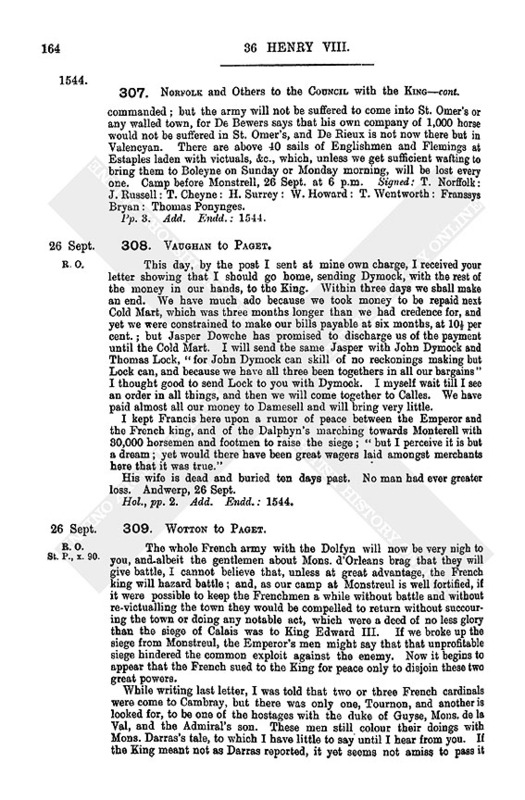 This morning the King sent Secretary Paiget to tell them that, having considered what they had said on the Emperor's behalf, especially the inconveniences which might happen in case of delay, the King took in good part what the Emperor had done touching the peace and reservation of the treaties and to obtain the said submission (ct a tenir main a lad. submission), being quite sure that, since the Emperor was in a place of safety and out of all dangers, he would not fail to do the office of a true friend and perpetual confederate. Assured him fully of this and enlarged upon the perfect, entire and incredible affection which the Emperor bore to the King. Coming to declare to the said Secretary the contents of the Emperor's letters of the 24th inst., received late last night, he gave them to understand that their ambassador wrote the same, and that the King, conformably to the Emperor's friendly advice, had determined to withdraw his army from Monstreul towards St. Omer, praying them anew to obtain provision of victuals there and write of it earnestly to the Queen and Mons. de Reulx, which they granted; and, as it seemed from what their ambassador wrote that Mons. d'Arras, after negociating with the King of France, would pass hither, the King could not for the present resolve upon his charge, especially being so occupied as he was about his departure from hence into England, who would have crossed this morning if his great ships of convoy had arrived here, and would certainly leave within two days at the latest, which the writers believe will be a great terror to the army of Monstreul and those here, considering the little order that hitherto has been kept. Think the King greatly pleased by the Emperor's advice touching the withdrawing of his army, in order honorably to cover the said retreat; but it would be a double pleasure, indeed he would hold it a great obligation, if the Emperor were to advertise the King of France that it was condescended to at his (the Emperor's) request, and ask the King of France to do the like, to avoid harm and inconvenience, and to let arms cease until means have been sought of appointment between them, either by the Emperor's arbitrament [or otherwise?] (fn. n3) Beg him to see to this and to believe that the King would feel much obliged to the Emperor and forget the scruples which he might have conceived; which cannot be small, however good countenance necessity and the surprise of the situation may have made him keep, notwithstanding which, however, the writers think he would not alienate himself from the Emperor unless blinded and suborned by the other side. If the King's great ships had been here in the morning he would have departed, as above, without, as they believe, telling them. If however he had wished in courtesy to warn them of it, (fn. n4) his departure, as above mentioned, will be within two days, within which time they could not find means of passing with him. Also there is no prospect of doing so; for I, Courrieres, current affairs being more intricate than they have been for a long time, do not feel myself able to deal with them alone, being commissioned only to accompany the King during the war, and I, Eustace Chappuis, because of my illness, and the air of England being so against me, and the season worst of all the year for gout, could do your Majesty no service there, and should put myself in extreme danger of life; and moreover it has always pleased your Majesty to signify that I could retire after the achievement of this enterprise. Have therefore both decided (advise) not to pass, and to remove hence when the King departs, so as to avoid the danger which might ensue; and they will draw towards Calais, where (if there is no plague) they will await news from the Emperor, especially in order to inform their successor of what they know of affairs. Beg him to regard the above and grant them licence to return to him. Boulogne, 26 Sept. 1544. Fr. Modern transcript of the original (mainly in cipher) at Vienna, pp. 6. 305. De Courrieres and Chapuys to the Queen of Hungary. Received her letters of the 21st inst., and were guided thereby in what the Emperor wrote by his of the 20th, therein mentioned, as she will see by their answer to his Majesty. 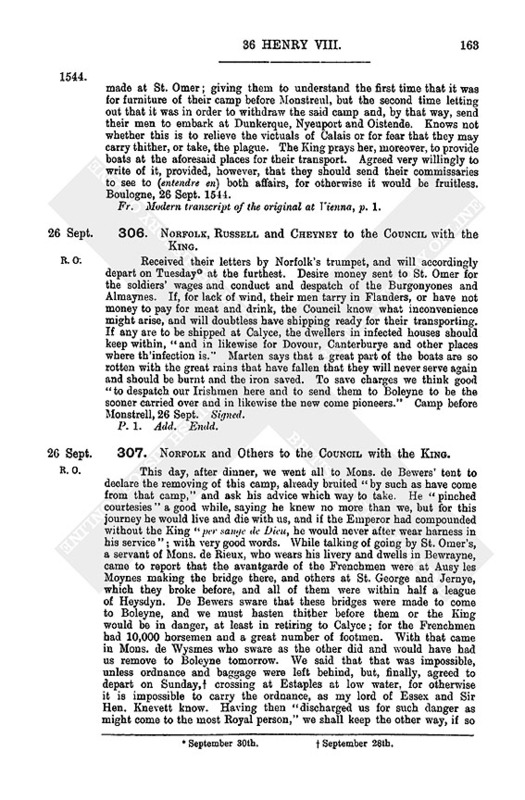 The King has twice caused instance to be made to them to write to her to order provision of victuals to be made at St. Omer; giving them to understand the first time that it was for furniture of their camp before Monstreul, but the second time letting out that it was in order to withdraw the said camp and, by that way, send their men to embark at Dunkerque, Nyeuport and Oistende. Knows not whether this is to relieve the victuals of Calais or for fear that they may carry thither, or take, the plague. The King prays her, moreover, to provide boats at the aforesaid places for their transport. Agreed very willingly to write of it, provided, however, that they should send their commissaries to see to (entendre en) both affairs, for otherwise it would be fruitless. Boulogne, 26 Sept. 1544. Fr. Modern transcript of the original at Vienna, p. 1. 306. Norfolk, Russell and Cheyney to the Council with the King. Received their letters by Norfolk's trumpet, and will accordingly depart on Tuesday (fn. n5) at the furthest. Desire money sent to St. Omer for the soldiers' wages and conduct and despatch of the Burgonyones and Almaynes. If, for lack of wind, their men tarry in Flanders, or have not money to pay for meat and drink, the Council know what inconvenience might arise, and will doubtless have shipping ready for their transporting. If any are to be shipped at Calyce, the dwellers in infected houses should keep within, "and in likewise for Dovour, Canterburye and other places where th'infection is." Marten says that a great part of the boats are so rotten with the great rains that have fallen that they will never serve again and should be burnt and the iron saved. To save charges we think good "to despatch our Irishmen here and to send them to Boleyne to be the sooner carried over and in likewise the new come pioneers." Camp before Monstrell, 26 Sept. Signed. 307. Norfolk and Others to the Council with the King. This day, after dinner, we went all to Mons. De Bewers' tent to declare the removing of this camp, already bruited "by such as have come from that camp," and ask his advice which way to take. He "pinched courtesies" a good while, saying he knew no more than we, but for this journey he would live and die with us, and if the Emperor had compounded without the King "per sange de Dieu, he would never after wear harness in his service"; with very good words. While talking of going by St. Omer's, a servant of Mons. de Rieux, who wears his livery and dwells in Bewrayne, came to report that the avantgarde of the Frenchmen were at Ausy les Moynes making the bridge there, and others at St. George and Jernye, which they broke before, and all of them were within half a league of Heysdyn. De Bewers sware that these bridges were made to come to Boleyne, and we must hasten thither before them or the King would be in danger, at least in retiring to Calyce; for the Frenchmen had 10,000 horsemen and a great number of footmen. With that came in Mons. de Wysmes who sware as the other did and would have had us remove to Boleyne tomorrow. We said that that was impossible, unless ordnance and baggage were left behind, but, finally, agreed to depart on Sunday, (fn. n6) crossing at Estaples at low water, for otherwise it is impossible to carry the ordnance, as my lord of Essex and Sir Hen. Knevett know. Having then "discharged us for such danger as might come to the most Royal person," we shall keep the other way, if so commanded; but the army will not be suffered to come into St. Omer's or any walled town, for De Bewers says that his own company of 1,000 horse would not be suffered in St. Omer's, and De Rieux is not now there but in Valencyan. There are above 40 sails of Englishmen and Flemings at Estaples laden with victuals, &c., which, unless we get sufficient wafting to bring them to Boleyne on Sunday or Monday morning, will be lost every one. Camp before Monstrell, 26 Sept. at 6 p.m. Signed: T. Norfolk: J. Russell: T. Cheyne: H. Surrey: W. Howard: T. Wentworth: Franssys Bryan: Thomas Ponynges. This day, by the post I sent at mine own charge, I received your letter showing that I should go home, sending Dymock, with the rest of the money in our hands, to the King. Within three days we shall make an end. We have much ado because we took money to be repaid next Cold Mart, which was three months longer than we had credence for, and yet we were constrained to make our bills payable at six months, at 10½ per cent. ; but Jasper Dowche has promised to discharge us of the payment until the Cold Mart. I will send the same Jasper with John Dymock and Thomas Lock, "for John Dymock can skill of no reckonings making but Lock can, and because we have all three been togethers in all our bargains" I thought good to send Lock to you with Dymock. I myself wait till I see an order in all things, and then we will come together to Calles. We have paid almost all our money to Damesell and will bring very little. I kept Francis here upon a rumor of peace between the Emperor and the French king, and of the Dalphyn's marching towards Monterell with 30,000 horsemen and footmen to raise the siege; "but I perceive it is but a dream; yet would there have been great wagers laid amongst merchants here that it was true." His wife is dead and buried ten days past. No man had ever greater loss. Andwerp, 26 Sept.
Hol, pp. 2. Add. Endd. : 1544. The whole French army with the Dolfyn will now be very nigh to you, and albeit the gentlemen about Mons. d'Orleans brag that they will give battle, I cannot believe that, unless at great advantage, the French king will hazard battle; and, as our camp at Monstreul is well fortified, if it were possible to keep the Frenchmen a while without battle and without re-victualling the town they would be compelled to return without succouring the town or doing any notable act, which were a deed of no less glory than the siege of Calais was to King Edward III. If we broke up the siege from Monstreul, the Emperor's men might say that that unprofitable siege hindered the common exploit against the enemy. Now it begins to appear that the French sued to the King for peace only to disjoin these two great powers. While writing last letter, I was told that two or three French cardinals were come to Cambray, but there was only one, Tournon, and another is looked for, to be one of the hostages with the duke of Guyse, Mons. de la Val, and the Admiral's son. These men still colour their doings with Mons. Darras's tale, to which I have little to say until I hear from you. If the King meant not as Darras reported, it yet seems not amisa to pass it over without expostulating sharply until a better occasion. Your posts have ill chance, for neither through France nor Flanders do they make requisite speed. I marvel that my letters of the 20th inst. were not with you before this bearer's departure, for Granvelle promised that they should be sent straight, with all possible diligence, to the Emperor's ambassadors. Granvelle says that the Emperor labours to pacify the matter between the King and the French king; but it were expedient to prepare for all things as though his labour should take no effect, although he will do what he can if he have any respect to his own honor, for all know that he ought not to have agreed without the King's consent. Chasteau en Cambresis, 26 Sept. 1544. 310. Wotton to Lord Cobham. Albeit neither I nor my servants have any knowledge in buying of horses, if you send your servant hither for that purpose my men will assist him. I thank you for your good news, which I cannot recompense with like. The Emperor, being pacified with the French king, has dismissed his army. The hostages given by the Frenchmen for performance of their treaty are the duke of Guyse, a cardinal (as I take it) of Orleans, Mons. de la Val and the Admiral's son. Chasteau en Cambresis, 26 Sept. 1544. 311. Mary Queen of Scots to Francis I. 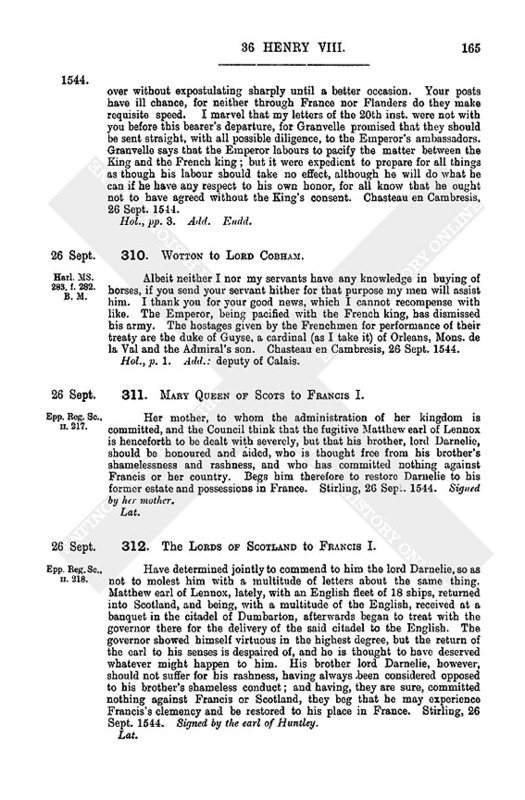 Her mother, to whom the administration of her kingdom is committed, and the Council think that the fugitive Matthew earl of Lennox is henceforth to be dealt with severely, but that his brother, lord Darnelie, should be honoured and aided, who is thought free from his brother's shamelessness and rashness, and who has committed nothing against Francis or her country. Begs him therefore to restore Darnelie to his former estate and possessions in France. Stirling, 26 Sept. 1544. Signed by her mother. 312. The Lords of Scotland to Francis I. Have determined jointly to commend to him the lord Darnelie, so as not to molest him with a multitude of letters about the same thing. Matthew earl of Lennox, lately, with an English fleet of 18 ships, returned into Scotland, and being, with a multitude of the English, received at a banquet in the citadel of Dumbarton, afterwards began to treat with the governor there for the delivery of the said citadel to the English. The governor showed himself virtuous in the highest degree, but the return of the earl to his senses is despaired of, and he is thought to have deserved whatever might happen to him. His brother lord Darnelie, however, should not suffer for his rashness, having always .been considered opposed to his brother's shameless conduct; and having, they are sure, committed nothing against Francis or Scotland, they beg that he may experience Francis's clemency and be restored to his place in France. Stirling, 26 Sept. 1544. Signed by the earl of Huntley. 313. Richard Hilles to Henry Bullinger. Received his letter of June by Falckner at this fair. Thanks him warmly for his answer to Cochlæus' book. Read it in August and it has confirmed him in the true religion. Is deeply indebted to him for his counsel so to use the world as not to lose Heaven, and not be too much immersed in money matters. Has, no doubt, too many occupations, but, except at Frankfort fairs, is seldom away from home. Has no servant and must do all his business himself, especially here at Strasburg. Yet last winter he read through the whole of the bible given him by Bullinger, and has at least learned this, that when the prophets, in Bullinger's translation, intended to describe a knave or impostor, they called him a merchant; which shows that trade is a dangerous thing. Has also received from his (H.'s) wife, since his return, the book Bullinger sent him by Froschover, which he will read when he has leisure. It is much commended by the English who favor the gospel, as our Michael (I mean Coverdale), immediately after my arrival from England, clothed it in an English dress (fn. n7); but I am more pleased with it in Latin. Thanks him, but is sorry to be always receiving presents when he has nothing worth sending to return. His wife sends thanks (as he has doubtless heard from Falckner) for that medal representing Concord. If there is any news from England, the bearer John will tell it better than he can write. He will also convey 12 Italian crowns for the poor exiles. Salute for me Pellican, Megander and other pious men. My wife salutes yours. Strasburg, 26 Sept. 1544. 314. Sir Edward North and Sir Thomas Moyle to Sir John Williams. Bearer, Henry Coke, purchased of the King a wood called Joydons in the parishes of Bexley and North Craye, for 116l. 13s. 4d. Now it appears by certificate of the surveyor of the King's woods made since the sale, that certain persons by virtue of Mr. Pope's commission have felled and carried away wood to the value of 10l. 20d., which the writers hereby require him to pay to Coke. The Rolls, 27 Sept. Signed. P. 1. Add: treasurer of Augmentations. 315. Shrewsbury and Others to the Queen and Council. Enclose letters received yesternight from lords Evers and Wharton. Wharton describes a meeting between Buckleugh and certain gentlemen of the West Borders; but Buckleugh's desire of an assurance for a month or 20 days seems to be a practice to win time for his own benefit, and the writers will not grant it unless otherwise instructed. Meanwhile he and other of the King's enemies shall be pursued and annoyed. On Tuesday last received letters from the Privy .Council with her that Bulloyn was taken; and immediately caused general processions of thanksgiving to be made here and in other places in the North. Darneton, 27 Sept. 1544. Signed by Shrewsbury, Tunstall and Sadler. 316. The Council with the King to Lord Cobham, Deputy, and the Council of Calais. The King's pleasure is that you incontinently bring into your forts all forage and victuals now abroad. As great numbers of Frenchmen are arrived about Hesdin, and the vanguard of them already past the river, you shall send word hereof to Mr. Bray; that, if his espials, which he must send forth, find it true, he may remove the forage and other things at Liques into the strength of Guisnes, and himself retire as he shall see reason; which order you shall signify to Mr. Walloppe. Boulloyn, 27 Sept. 1544. Signed by Suffolk, Hertford, Essex, Winchester and Browne. P.1. Add. Endd. : Rec. 28 Septembr. 1544. 317. John Mason to Lord Cobham. I thank you for your gentle present. "My lord of Suffolke hath clean forgotten that ever he promised you any wine; and therefore trust upon some other furniture. The Frenchmen are come nigh unto Hesdin with a great power, and on Monday will pass the water hitherward to see whether they can recover their losses. My lord of Norff. with his army cometh hither with diligence." Sends a man to Callais with his geldings and begs expedition of his business. Boulloyn, 27 Sept. 1544. 318. De Courrieres and Chapuys to Charles V.
After the letters herewith were closed, which were kept back at the request of those here, Secretary Paiget came to tell them on the King's behalf that the vanguard of the French had already passed the river "dhostier" (Authie? ); and, therefore, instead of marching his army from before Monstreul towards Saint Omer, the King had resolved to make it come hither and camp near, in order to wait and see if the French would taste battle, and that for this cause the King was deciding to delay his departure for England, against the wish of all his Council. And Paiget requested that when they came to speak with the King they would mention it, and persuade him that he might with honour withdraw, seeing that he had achieved this enterprise of Boulogne and that the King of France was not coming in person. Paiget also gave them to understand that the vanguard of the French contained a number of lansknechts of those whom the Emperor had dismissed, which would seem very strange, and the King prays the Emperor to see to it as the perfect amity requires, and as the Emperor has been pleased to say to his (the King's) ambassador, and moreover to act in such a way that the world may perceive the sincere and perfect good will which the Emperor bears him. 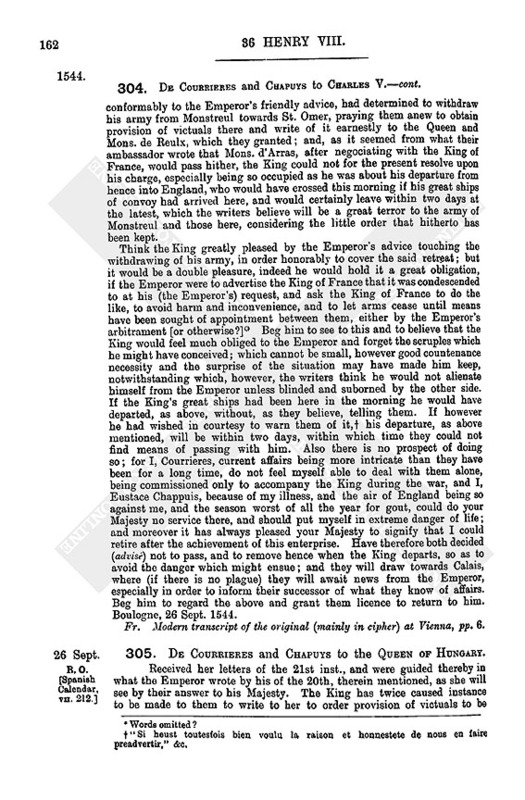 Because the writers both excuse themselves (for the causes shown in their last) from passing into England, the said secretary declared, on the King's behalf, that it would sound very ill, as well among the French as principally among all the people of England, if, after the Emperor had appointed with the French, who should remain in hostility with him, he returned without being accompanied by an ambassador of the Emperor; wherefore he prayed them with speed to advertise the Emperor and beg him to provide therein immediately. Three hours ago arrived here three of the Emperor's ships of war, which could not have come more opportunely for the King's satisfaction, who showed great joy thereat in presence of all his Council. There was another in their company, being the admiral, which has gone off (s'est esquartee) we know not whether to carry home booty or by chance. Boulogne, 27 Sept. 1544. Fr. Modern transcript of the original at Vienna, pp. 2. 319. Norfolk, Russell and Gage to the Council with the King. We have just received, at 10 o'clock, your letter of yesterday, but cannot answer as to going by Saynt Omers until we have answer to ours sent yesterday by Richemount. Without a far greater number of lymoners the great ordnance cannot be conveyed by Saynt Omers for, where you wrote that we should have 800 lymoners, Mr. Comptroller says that only 400 came with him, and these too ill to reckon upon. It is more than necessary to have a good number sent; "and as for the bridges, boats, milnes and brewhouses there is no remedy but they must be brent." Concerning the speaking with Mons. de Bees Norfolk will accomplish it. Know no more than yesterday as to the coming of the Doulphyn. Unless more lymoners come the great ordnance must be shipped at Estaples, and good wafting provided, or else all sent that way is like to be lost. Camp before Monstrell, 27 Sept. at 11 o'clock. 320. Pierre Boisot and Sebastien Bourgeois to the Imperial Ambassadors. Learn that the English have been much moved by some news which has lately reached them, insomuch that at Monstreul they will not pay the wagonners, but hang and beat them and take their mares (jumens); and those who receive money are robbed of it and their beasts by the way. Beg them to show this to the King, which is written in accordance with the Queen's letters of the 20th inst. It is to be feared that the mares and horses will only be got from the English by force, and if it is not done before the departure of Mons. de Bueren, and they are not guarded by his men, there will be great disorder. Victuallers are said to be very ill treated in both camps, and robbed and killed by the way. Have ordered the conductors to take bills for their payment since the English proceed thus. Gravelinghes, 27 Sept. 1544. Signed. French, p. 1. Add. : "Mess'rs les arnbassadeurs de l'Empereur vers le Roy d'Angleterre, noz treshonnorez seigneurs." Endd. : The commissaries for [vi]ctuals [to the am]bassadors. 321. Shrewsbury and Others to the Queen and Council. Enclose letters presently received from the Wardens of the East and Middle Marches, of their exploits and of intelligence of the sickness of the young Queen of Scots. Have also letters from the Warden of the East Marches, complaining of lack of his wages and those of many of the soldiers of Berwyke. Ask her pleasure therein. By a letter from Sir Ric. Cholmeley, it appears that the Scottish ships still hover upon this coast. Send all the above letters herewith. Darneton, 28 Sept. at night. Signed by Shrewsbury, Tunstall and Sadler. 322. [The Council of Calais] to the Council with the King. The soldiers of the camps as well horsemen as footmen, still repair hither (100 footmen of Mr. Welden's came this morning), requiring passage into England, whom, accordingto your Lordships' letters, we will stay pending the King's further pleasure. Thus the town is greatly pestered both with horses and men; which may increase the infection here, "already somewhat assuaged." Divers of the horsemen declare that their wages ended on Friday last, and make moan for money. If any great number of the army should be transported from hence, great provision of ships must be made; and we can hear of no ships of war meet to waft this company. Draft, p. 1. Headed: The copie to the lords of the Council, xviij Septembris 1544.
ii. [The Council of Calais] to Sir Edward Bray. The King learning that a great number of Frenchmen had arrived about Heddyng, and their vanguard already past the river, has (by letters of his Council, received since dinner) willed us to signify to you that you should send abroad espials, remove the forage and other things at Liques into the strength of Guysnes, and retire as you see reason. By the said letters (which we would send you but have sent to Hampnes and Guysnes) it seems that the King thinks you are at Liques. Whether any English garrison is there we know not. Doubtless you will keep good watch in the East pale. Draft, p. 1. Headed: Copie to Sir Edward Braye, xxviij Septembris 1544. This day an English merchant came to tell him that another English merchant spoke today with a Frenchman who came hither yesternight out of France, and who said that the Dalphyn, with a great army of Italians, Gascons and Frenchmen, drew towards Montrell to raise the siege. Writes this because it agrees with the former rumor here, although it may be untrue. Paid all the money they had to Mr. Damesell; and have very little remaining, which Dymock and Thomas Lock will bring. We have much ado for our bills for the money "credited us." Andwerp, 28 Sept.
Hol.,p 1. Add. Endd. : 1544. 324. The Council with the Queen to the Council with the King. 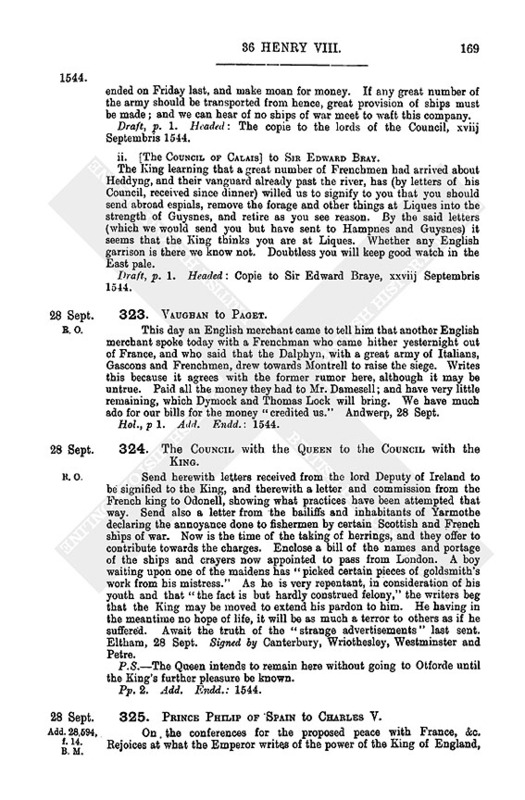 Send herewith letters received from the lord Deputy of Ireland to be signified to the King, and therewith a letter and commission from the French king to Odonell, showing what practices have been attempted that way. Send also a letter from the bailiffs and inhabitants of Yarmothe declaring the annoyance done to fishermen by certain Scottish and French ships of war. Now is the time of the taking of herrings, and they offer to contribute towards the charges. 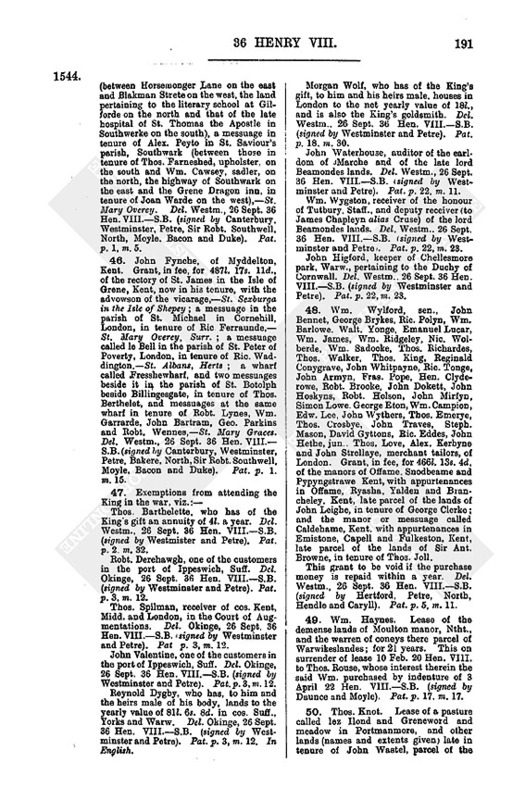 Enclose a bill of the names and portage of the ships and crayers now appointed to pass from London. A boy waiting upon one of the maidens has "picked certain pieces of goldsmith's work from his mistress." As he is very repentant, in consideration of his youth and that "the fact is but hardly construed felony," the writers beg that the King may be moved to extend his pardon to him. He having in the meantime no hope of life, it will be as much a terror to others as if he suffered. Await the truth of the "strange advertisements" last sent. Eltham, 28 Sept. Signed by Canterbury, Wriothesley, Westminster and Petre. P.S:—The Queen intends to remain here without going to Otforde until the King's further pleasure be known. 325. 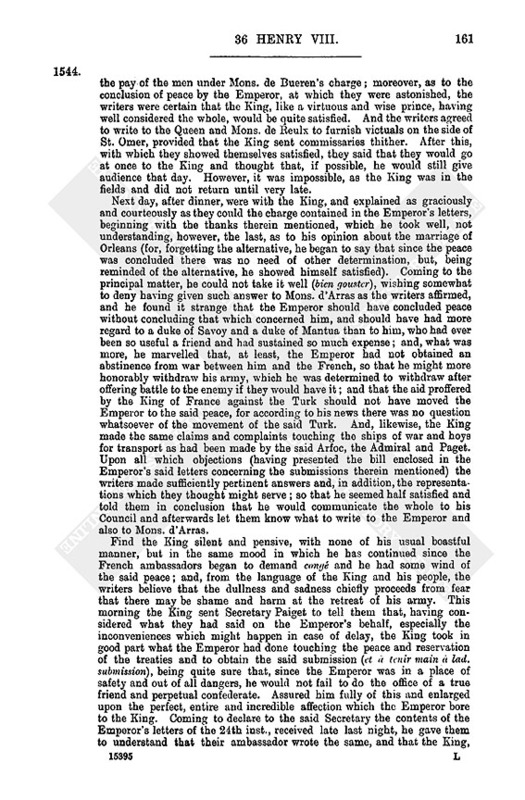 Prince Philip of Spain to Charles V.
On, the conferences for the proposed peace with France, &c. Rejoices at what the Emperor writes of the power of the King of England, but fears that, as the Emperor says, proceeding so slowly in his affairs, he will not be able to do anything of moment. * * * * Valladolid, 28 Sept. 1544. Spanish, pp. 9. Modern copy from Simancas, headed: Copia del descifrado de la carta original en cifra del Principe al Emperador, fecha en Valladolid a 28 de Setiembre de 1544. Full abstract in Spanish Calendar, Vol. VII, No. 214. 326. Edmond Harvel to Henry VIII. Wrote on the 15th inst. by the Venetian secretary sent by this Signory. While daily expecting Henry's obtaining of Bolaine and Mounstrel, reduced to the last extremity, sudden news came of the peace concluded between Henry, the Emperor and the French king, which he hopes will be to the common wealth of Chistendom and confusion of the Turk. Letters from Constantinople report that the Turk makes great preparations of war against next year, but this peace and union will constrain him to think upon his own defence. Polin, the French ambassador, required the Turk's galleys to serve the French king again next summer, but the Turk refused, saying that he would occupy them for presidy of his countries. Barbarossa was lately at Lepanto in Peloponeso with 60 galleys and foists "newly redressed." Venice, 28 Sept. 1544. P.S.— Hears that Henry has overcome Bolaine by battle, which was esteemed "the chief hope and propugnacle of all France," and thanks God, who has granted "so fortunable success this same year as well in Scotland as in France." The Frenchmen here divulge "that if your Majesty recuse to rendre Bolaine they will use their might against the same with th' Emperor's favour and consent, which to me seemeth too much incredible of th'Emperor's part." The Bishop is in great fear of the Emperor, who has written in choler "for th'ofensions recayvid of the Bushop moche grevous." Hol., pp. 2. Add. Scaled. Endd. Payments out of the attainted lands in Yorkshire for the year ended Mich. 36 Hen. VIII, for which the receiver seeks allowance. Account of Sir John Williams, treasurer of Augmentations, appointed 31 March 35 Hen. VIII., for the year ended Mich. 36 Hen. VIII., before which time Sir Edw. Northe, late treasurer, accounted (The initial scroll bears the words "Vivat Rex Edwardus Sextus, amen"). i. Arrears (items explained) 74.365l. 0s. 15/16d. (1) Receipts from Geoff. 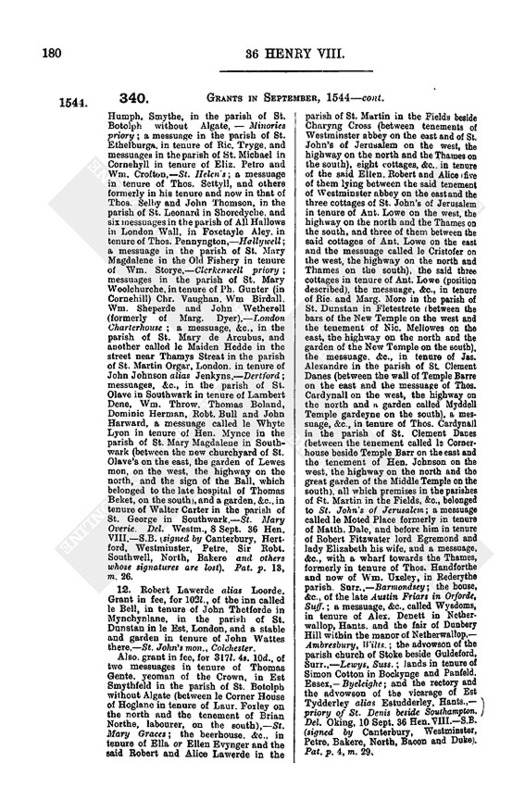 Chamber, late receiver, and George Wright, now receiver, of purchased lands, and from the particular receivers of the issues of the lands of the late monasteries, from Maurice Denys, receiver of the lands of St. John's of Jerusalem, and Walter Farre, receiver of woods. Total 44,945l. 2s.11½d. (2) Grati oneris from rents reserved upon certain grants of lands and from the enhancement of the coinage, 212l. 14s. 8d. (3) Receipts from sale of goods, chattels and jewels (names of accountants and dates of indentures given), viz. :—Goods and chattels of the late Ric. Leyton, D.C.L., dean of York, 231l. 6s. Price of the sepulchre called le shryne of St. David in Wales, 66l. 13s. 4d. A debt of Wm. Knyghte, bp. of Bath and Wells, 333l. 6s. 8d. Lead and bells of Wherwell mon. sold to lord Lawarre, 100l. From Leonard Beckewith for goods of Yorkshire monasteries sold at the time of their dissolution, 315l. Total 1,046l. 6s. (4) Received from Wm. Honnynges clerk of the King's Council, in repayment of a loan of 100l. made by warrant of 29 April 35 Hen. VIII., with increment thereon by the enhancement of the coinage, 75l. 9s. 8d. (5) Fines for leases (particulars briefly indicated), 1,196l. 6s. 7½d. (6) Proceeds of sale of lands by commissioners. The lands briefly indicated with (in most cases) the names of the former owners and the price. Total 164,495l. 17d. 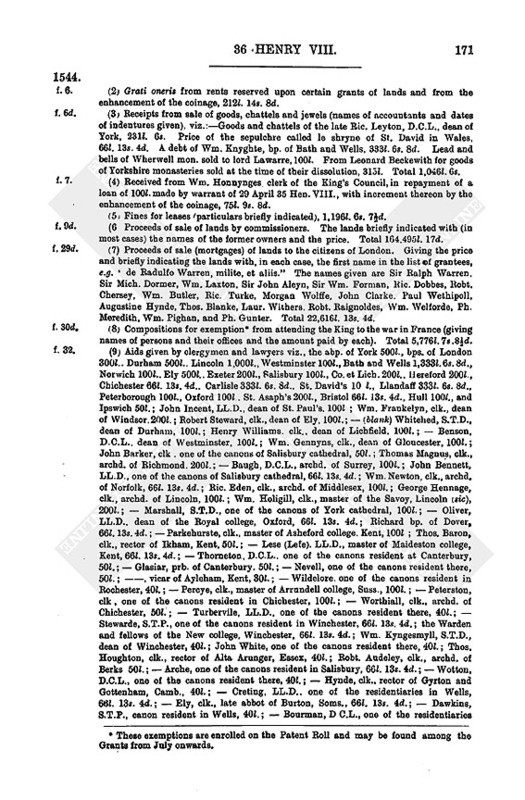 (7) Proceeds of sale (mortgages) of lands to the citizens of London. Giving the price and briefly indicating the lands with, in each case, the first name in the list of grantees, e.g. "de Radulfo Warren, milite, et aliis." The names given are Sir Ralph Warren, Sir Mich. Dormer, Wm. Laxton, Sir John Aleyn, Sir Wm. Forman, Hie. Dobbes, Hobt. Chersey, Wm. Butler, Ric. Turke, Morgan Wolffe, John Clarke. Paul Wethipoll, Augustine Hynde, Thos. Blanke, Laur. Withers. Robt. Raignoldes, Wm. Welforde, Ph. Meredith, Wm. Pighan, and Ph. Gunter. Total 22,616l. 13s. 4d. (8) Compositions for exemption (fn. n8) from attending the King to the war in France (giving names of persons and their offices and the amount paid by each). Total 5,776l.7s .8½d. (9) Aids given by clergymen and lawyers viz., the abp. of York 500l., bps. of London 300l.. Durham 500l.. Lincoln 1,000l., Westminster 100l., Bath and Wells 1,333l.6s. 8d., Norwich 100l., Ely 500l.. Exeter 200l., Salisbury 100l., Co. et Lich. 200l.. Hereford 200l., Chichester 66l. 13s. 4d.. Carlisle 333l. 6s. 8d., St. David's 10 l., Llandaff 333l. 6s. 8d., Peterborough 100l., Oxford 100l, St. Asaph's200l., Bristol 66l. 13s. 4d., Hull 100l., and Ipswich 50l. ; John Incent, LL.D., dean of St. Paul's. 100l; Wm. Frankelyn, clk., dean of Windsor.200l. ; Robert Steward, clk., dean of Ely, 100l. ; — (blank) Whitened, S.T.D., dean of Durham, 100l. ; Henry Williams, clk., dean of Lichfield. 100l. ; — Benson, D.C.L.. dean of Westminster, 100l. ; Wm. Gennyns, clk., dean of Gloucester, 100l. ; John Barker, clk . one of the canons of Salisbury cathedral, 50l. ; Thomas Magnus, clk., archd. of Richmond. 200l. ; — Baugh, D.C.L., archd. of Surrey, 100l. ; John Bennett, LL.D., one of the canons of Salisbury cathedral, 66l. 13s. 4d. ; Wm. Newton, clk., archd. of Norfolk, 66l. 13s. 4d. ; Ric. Eden, clk., archd. of Middlesex, 100l. ; George Hennage, clk., archd. of Lincoln, 100l. ; Wm. Holigill, clk., master of the Savoy, Lincoln (sic), 200l. ; — Marshall, S.T.D., one of the canons of York cathedral, 100l. ; — Oliver, LL.D.. dean of the Royal college, Oxford, 66l. 13s. 4d. ; Richard bp. of Dover, 66l.13s. 4d. ; — Parkehurste, clk., master of Asheford college. Kent, 100l; Thos. Baron, clk., rector of Ikham, Kent, 50l. ; — Lese (Lefe). LL.D., master of Maideston college, Kent, 66l. 13s. 4l. ; —Thorneton, D.C.L.. one of the canons resident at Canterbury, 50l. ; — Glasiar, prb. of Canterbury. 50l. ; — Nevell, one of the canons resident there, 50l. ;–––, vicar of Ayleham, Kent, 30l. ; — Wildelore. one of the canons resident in Rochester, 40l. ; — Percye, clk., master of Arrondell college, Suss., 100l. ; — Peterston, clk , one of the canons resident in Chichester, 100l. ; — Worthiall, clk., archd. of Chichester, 50l. ; — Turbervile, LL.D., one of the canons resident there, 40l. ; — Stewarde, S.T.P., one of the canons resident in Winchester, 66l. 13s. 4d. ; the Warden and fellows of the New college, Winchester, 66l. 13s. 4d. ; Wm. Kyngesmyll, S.T.D., dean of Winchester, 40l. ; John White, one of the canons resident there, 40l. ; Thos. Houghton, clk., rector of Alta Arunger, Essex, 40l. ; Robt. Audeley, clk., archd. of Berks 50l. ; — Arche, one of the canons resident in Salisbury, 66l. 13s. 4d. ; — Wotton, D.C.L., one of the canons resident there, 40l. ; — Hynde, clk., rector of Gyrton and Gottenham, Camb., 40l. ; — Creting, LL.D.. one of the residentiaries in Wells, 66l. 13s. 4d. ; — Ely, clk., late abbot of Burton, Soms., 66l. 13s. 4d. ; — Dawkins, S.T.P., canon resident in Wells, 40l. ; — Bourman, D C.L., one of the residentiaries there, 50l. ; — Tresseham. LL.D., 20l. ; — Stephens, clk., one of the canons in Exeter cathedral, 40l. ; — Southerne clk., treasurer of Exeter cathedral. 66l. 13s. 4d. ; — Pollard, clk., archd. of Berstable, 50l. ; — Carowe, clk., archd. of-––(blank), 50l. ; — Howell, clk., one of the residentiaries in Exeter, 50l. ; — Luce, clk., another residentiary there, 30l. 10l. ; Reignoldes, LL.D., another residentiary there, 50l. ; — Lloide, clk., precentor of St. David's, 100l. ; — Pole, D.C.L., one of the canons in Lichfield cathedral, 50l. ; — Taylor. S.T D., dean of Lincoln, 40l. ; — Draycote, S.T.D., prb. there, 66l. 13i. 4d. ; — Prymme, clk., a canon resident there, 50l. ; — Thomworth clk., a canon resident there, 50l. ; — Cliffe, LL.D., a canon resident in York cathedral, 50l. ; — Dente, clk., late abbot of St. Mary's, York, 100l. : — Hynmer, LL.D., chancellor to the bp. of Durham, 40l. ; — Bransby, S.T.P., a canon resident in York cathedral, 40l. ; — Downes, LL.D., canon resident there, 40l. ; — Moyng. rector of Lytton, Dorsi, 20l. ; Philip Herford, clk., late abbot of Evesham, 66l.13s. 4d; John (sic) Segar, clk., late abbot of Hayles, 66l. 13s. 4d. ; — Kotchyn, S.T.D., quondam abbot of Evesham (sic, for Ensham), 40l. ; —Bowreman, clk., late abbot of St. Alban's. 66l. 13s. 4d. — Carleton. clk., dean of Peterborough, 40l. ; — Haynes. S.T.D., dean of Exeter, 60l. ; — Bretan S.T.P., prb. of Westminster, 40l. ; — Cockes, S.T.D., chancellor to the abp. of Canterbury, 40l. ; John Crayford, S.T.D., canon resident in St. Paul's Cathedral, London, 40l. ; — Restone, S.T.P., canon resident there, 40l. ; Gabriel Dune, canon resident there, 40l. ; —Armestede, clk., canon resident there, 30l. ; — Barker, clk., canon resident in Windsor, 50l; —Vaughan. LL.D., a canon of St. Stephen's, Westminster 50l. ; — Cannor, clk., prb. There, 40l. ; — Wade, clk., prb. there, 40l. ; —Barloo, clk., dean of Worcester, 40l. ; — Wilson, S.T.D., prb. of St Paul's Cathedral, London, 40l; — Sakefelde, clk., dean of Carlisle, 40l. ;––––(blank), dean of Hereford, 43l. ; — Wilbram, clk., canon there, 30l. ; — Maye, clk., canon there. 24l. ; — Walker, clk., canon there, 20l. ; — Mason, clk., canon there, 30l. ; William Whorewodd, Attorney General, 100l. ; Walter Hendley, attorney of Augmentations. 100l. ; John Pakington, 100l. ; Sir Nich. Hare, one of the Council in the Marches of Wales, 66l. 13s. 4d. ; Wm. Cowper, 133l. 6s. 8d. ; Sir Wm. Shelley, one of the justices of the Common Pleas, 100l. ; Sir John Baldwin, chief justice of Common Pleas, 100l. ; Sir John Smythe, one of the barons of the Exchequer, 100l. ; Henry Bradshawe, Solicitor General, 50l. ; JohnCarell, attorney of the Duchy of Lancaster, 50l. ; John Sewster, attorney of the Court of Wards and Liveries, 40l. ; Wm. Stamforde, attorney in the Court of General Surveyors, 40l. ; Robert Chideley, attorney in the Court of Tenths and First Fruits, 40l. ; Ric. Duke, clerk in the Court of Augmentations, 40l. ; Sir Humph. Browne, one of the justices of Common Pleas, 40l. ; and Sir Thomas Willoughby, another justice in the same court, 50l. Total 12.970l. 16s. 8d. Total receipts and arrears 327,657l. 213/8d. 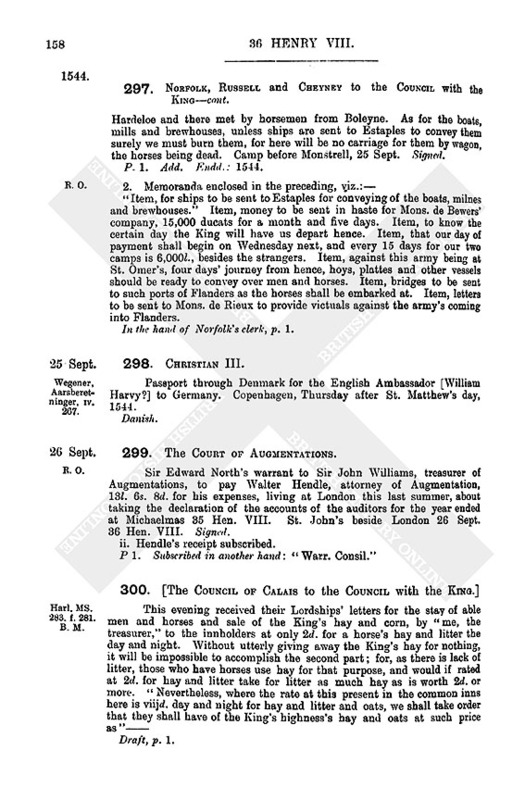 (1) Fees of officers of the Court of Augmentations, detailed, 1.567l. 3s. 7½d. (2) Annuities, detailed, first those granted by the King, and then those paid out of the late religious houses, 1 954l. 18s. 6½d. (3) Pensions (giving name and description of pensioners and terms for which they are paid), 4.147l. 16s. 6d. (4) Annual and perpetual pensions (to colleges, cathedrals, &c., and the like, detailed), 114l. 10s. 4½d. (5) Necessary costs, 352l. 13s. 4d. (6) Costs of messengers, 53l. 18s. 7d. (7) Payments by warrant for lands purchased and exchanged, 7.169l. 19s. 5d. (8) Necessary payments by warrant of the Chancellor and Council of Augmentations, 910l. 9s. 9d. (9) Payments by decrees, 1,012l. 17s. 7¼d. 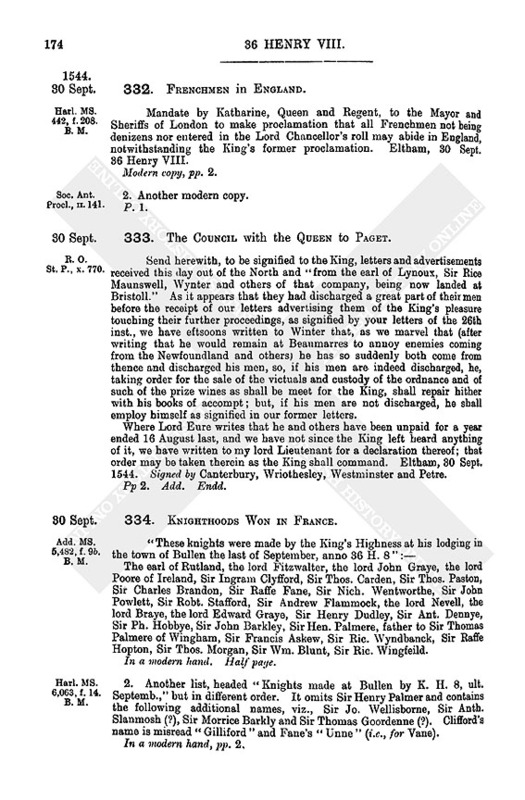 (10) Payments by the King's warrant, 32.431l. 0s. 0½d. 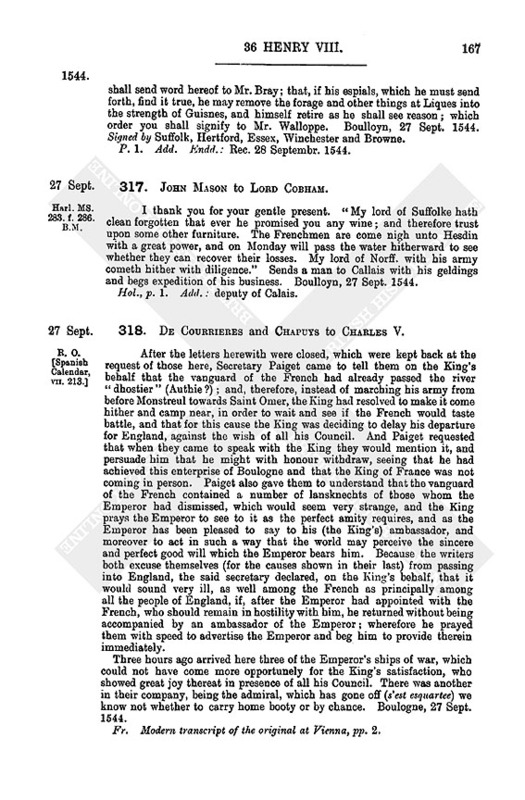 (11) Prests by the King's warrant, 17,134l. 15s. (12) Deliveries of money to the King, 5.609l. 10s. ½d. Total payments, 225.459l. 12s. 9¾d. Leaving due 102.197l. 8s. 115/8d., which by a long list of arrears is reduced to 33.203l. 9s. 67/8d. for which the treasurer is to account. Lat. Roll of 76 large parchment folios stitched together at the one end. 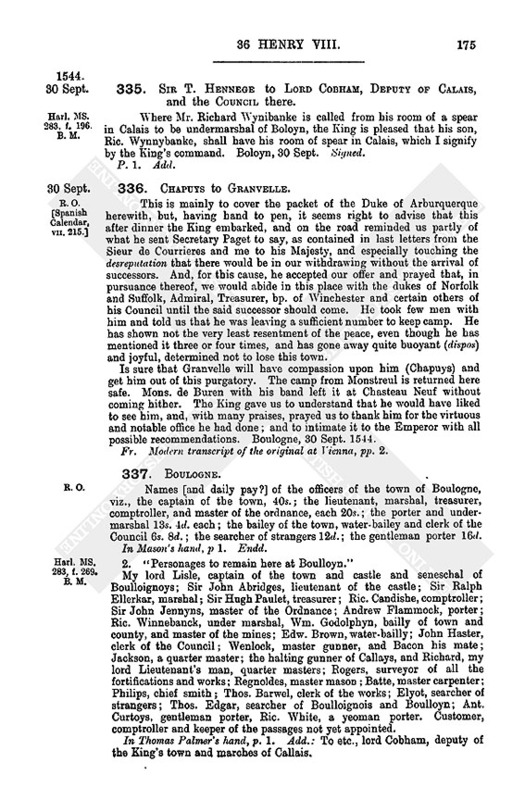 Memorandum that in the account of John Hyckelyng, bailiff of certain lands in Grymscot, Ntht., parcel of Grafton honour, the rent of lands there, late of John Mauntell, attainted, has been answered to the King's use for two years ended Mich. 36 Hen. VIII., viz. 9l. 10s. 4d. Signed by Ric. Modye, auditor. Small paper, p. 1. Endd. : Mistres Johnson. 330. The Council with the Queen to Shrewsbury. Amongst other advertisements which he sent the Queen were certain articles, addressed to him by Sir Ralph Evre, concerning offers signed by certain Scottishmen inhabiting near the Middle Marches, for which they would lay hostages. The King, having seen those offers, answers that, unless they will promise to serve him against all men without restraint, he will not accept the offers nor grant abstinence. Have seen his letters of the 27th inst., with the requests of the laird of Buckleugh, and think that he has well resolved to grant no assurance; for it is but a practice to save their corn this harvest, to the wasting of which and further annoyance of the enemies the wardens should have good respect. Eltham, 29 Sept. Signed by Cranmer, Wriothesley, Westminster and Petre. In Petre s hand, p. 1. Add. : lieutenant general in the North. 331. Sir William Paget to Lord Cobham. Encloses a letter from the Council to Mr. Treasurer for Cobham to read, seal and deliver. As to your licence, the state of the world makes your presence there so necessary that you can neither honestly desire to be absent from your charge nor I honestly sue for it. As soon as we meet I will return Mr. Brooke to his charge and afterwards get his bill signed for the same. "Tomorrow, God willing, the King's Majesty and we take the seas and my lord of Norf. with th'ole army will be here and, as I guess, will be upon Thursday (fn. n10) with you there." Thus I take leave of you "till I come into England." Bullen, 29 Sept.
Hol. p. 1. Add. : deputy of Calais. "The best way from hence (fn. n11) to Hedihge":—To Samere a Boyes, 6 miles; and there, passing by a bridge on this side of the town, pass through the town and up to the hills, and thence all is fair way to Heding, 11 leagues. The way between this and Samer is very ill. Another way is to pass the haven here at low water to a mill called Molyn du Becque, 4 miles of very foul way, and from thence to Neffe Chattell, 1 mile of meetly good way, sandy; thence to Francke 4 miles, fair, thence to Novilier 2 miles, fair, and so to Heding, 18 miles of fair way. Mandate by Katharine, Queen and Regent, to the Mayor and Sheriffs of London to make proclamation that all Frenchmen not being denizens nor entered in the Lord Chancellor's roll may abide in England, notwithstanding the King's former proclamation. Eltham, 30 Sept. 36 Henry VIII. 333. The Council with the Queen to Paget. Send herewith, to be signified to the King, letters and advertisements received this day out of the North and "from the earl of Lynoux, Sir Rice Maunswell, Wynter and others of that company, being now landed at Bristoll." As it appears that they had discharged a great part of their men before the receipt of our letters advertising them of the King's pleasure touching their further proceedings, as signified by your letters of the 26th inst., we have eftsoons written to Winter that, as we marvel that (after writing that he would remain at Beaumarres to annoy enemies coming from the Newfoundland and others) he has so suddenly both come from thence and discharged his men, so, if his men are indeed discharged, he, taking order for the sale of the victuals and custody of the ordnance and of such of the prize wines as shall be meet for the King, shall repair hither with his books of accompt; but, if his men are not discharged, he shall employ himself as signified in our former letters. Where Lord Eure writes that he and others have been unpaid for a year ended 16 August last, and we have not since the King left heard anything of it, we have written to my lord Lieutenant for a declaration thereof; that order may be taken therein as the King shall command. Eltham, 30 Sept. 1544. Signed by Canterbury, Wriothesley, Westminster and Petre. 334. Knighthoods Won in France. The earl of Rutland, the lord Fitzwalter, the lord John Graye, the lord Poore of Ireland, Sir Ingram Clyfford, Sir Thos. Carden, Sir Thos. Paston, Sir Charles Brandon, Sir Raffe Fane, Sir Nich. Wentworthe, Sir John Powlett, Sir Robt. Stafford, Sir Andrew Flammock, the lord Nevell, the lord Braye, the lord Edward Graye, Sir Henry Dudley, Sir Ant. Dennye, Sir Ph. Hobbye, Sir John Barkley, Sir Hen. Palmere, father to Sir Thomas Palmere of Wingham, Sir Francis Askew, Sir Ric. Wyndbanck, Sir Raffe Hopton, Sir Thos. Morgan, Sir Wm. Blunt, Sir Ric. Wingfeild. In a modern hand. Half page. 2. Another list, headed "Knights made at Bullen by K. H. 8, ult. Septemb.," but in different order. 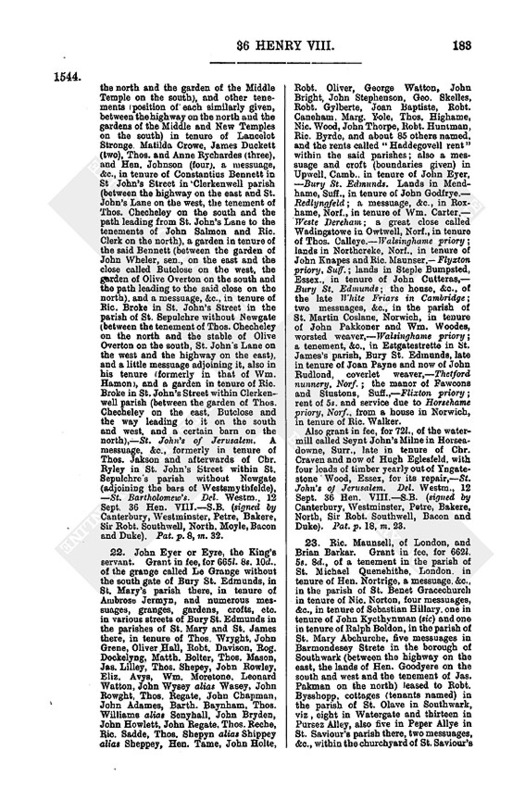 It omits Sir Henry Palmer and contains the following additional names, viz., Sir Jo. Wellisborne, Sir Anth. Slanmosh (? ), Sir Morrice Barkly and Sir Thomas Goordenne (?). Clifford's name is misread "Gilliford" and Fane's "Unne" (i.e., for Vane). 335. Sir T. Hennege to Lor d Cobham, Deputy of Calais, and the Council there. Where Mr. Richard Wynibanke is called from his room of a spear in Calais to be undermarshal of Boloyn, the King is pleased that his son, Ric. Wynnybanke, shall have his room of spear in Calais, which I signify by the King's command. Boloyn, 30 Sept. Signed. This is mainly to cover the packet of the Duke of Arburquerque herewith, but, having hand to pen, it seems right to advise that this after dinner the King embarked, and on the road reminded us partly of what he sent Secretary Paget to say, as contained in last letters from the Sieur de Courrieres and me to his Majesty, and especially touching the desreputation that there would be in our withdrawing without the arrival of successors. And, for this cause, he accepted our offer and prayed that, in pursuance thereof, we would abide in this place with the dukes of Norfolk and Suffolk, Admiral, Treasurer, bp. of Winchester and certain others of his Council until the said successor should come. He took few men with him and told us that he was leaving a sufficient number to keep camp. He has shown not the very least resentment of the peace, even though he has mentioned it three or four times, and has gone away quite buoyant (dispos) and joyful, determined not to lose this town. Is sure that Granvelle will have compassion upon him (Chapuys) and get him out of this purgatory. The camp from Monstreul is returned here safe. Mons. de Buren with his band left it at Chasteau Neuf without coming hither. The King gave us to understand that he would have liked to see him, and, with many praises, prayed us to thank him for the virtuous and notable office he had done; and to intimate it to the Emperor with all possible recommendations. Boulogne, 30 Sept. 1544. Names [and daily pay?] of the officers of the town of Boulogne, viz., the captain of tbe town, 40s. ; the lieutenant, marshal, treasurer, comptroller, and master of the ordnance, each 20s. ; the porter and undermarshal 13s. -4d. each; the bailey of the town, water-bailey and clerk of the Council 6s. 8d. ; the searcher of strangers 12d. ; the gentleman porter 16d. In Mason's hand, p 1. Endd. 2. "Personages to remain here at Boulloyn." My Lord Lisle captain of the town and castle and seneschal of Boulloignoys; Sir John Abridges, lieutenant of the castle; Sir Ralph Ellerkar, marshal; Sir Hugh Paulet, treasurer; Ric. Candishe, comptroller; Sir John Jennyns, master of the Ordnance; Andrew Flammock, porter; Ric. Winnebanck, under marshal, Wm. Godolphyn, bailly of town and county, and master of the mines; Edw. Brown, water-bailly; John Haster, clerk of the Council; Wenlock, master gunner, and Bacon his mate; Jackson, a quarter master; the halting gunner of Callays, and Richard, my lord Lieutenant's man, quarter masters; Rogers, surveyor of all the fortifications and works; Regnoldes, master mason; Batte, master carpenter; Philips, chief smith; Thos. Barwel, clerk of the works; Elyot, searcher of strangers; Thos. Edgar, searcher of Boulloignois and Boulloyn; Ant. Curtoys, gentleman porter, Ric. White, a yeoman porter. Customer, comptroller and keeper of the passages not yet appointed. In Thomas Palmer's hand, p. 1. Add. : To etc., lord Cobham, deputy of the King's town and marches of Callais. 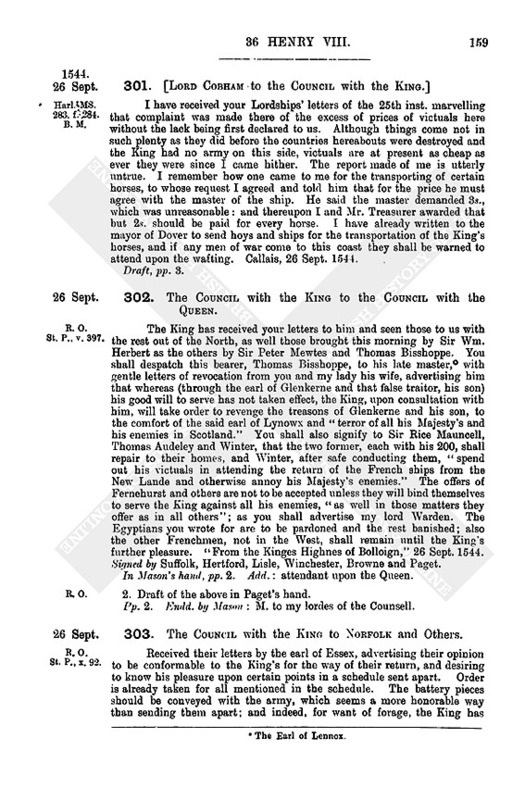 "My trust is that I shall have the King's Majesty's favor t'enjoy th'office of High Admyralltye of England, for it is an office of honor, of estimation and profit, and within the realm; and, having his Gracious favor thereunto I may occupy it with a deputy and serve in this notwithstanding, which I beseech your Lordships consider." As to household servants, I suppose I can have in this town no less than 50 horsemen and 50 footmen: and have besides in crew 400 footmen under my own servants. Item, to have some arable land, pasture, mead and woods for provision of my house at reasonable rent. "Item, to have the choice of the gentlemen's sporting houses or pyles in the country, with the demesnes, to lie in for a recreation in the time of peace." To be steward and master of the game in the King's forests in these parts. To have "admiral jurisdiction" in all these countries. To have provisions of my house shipped here or at Calys, custom free. In Lisle's hand, p. 1. Endd. : My 1. Admyralles requestes. * * * * (f. 13.) The King of England took Boulogne and was besieging (estava sobre) Montrull. The Emperor gave him notice of the peace which was being treated with the King of France twelve days before it was concluded, as had been capitulated between them. The army of the King of France has gone towards that of England to give it battle. There is news that the Englishman has withdrawn and that he left Boulogne well fortified. However, it is believed that there will be peace between them also and that the Emperor will take it in hand. Spanish,pp.8 Modern copy from Madrid. Original headed: Capitulos de nuevas de la paz. 340. Grants in September 1544. 1. Sir Thomas Arundel and Henry Saunders. Grant, in fee to the said Sir Thomas, for 2,609l. 13d. paid by him. of the lordship and manor of Donhed alias Donhed Mary and Donhed Andrewe, Wilts., the lordships and manors of Compton and Melbury, Dors., and the advowsons of the prebend of Fountmell and of the rectories of Fountmell, Melbury alias Melbury Abbatisse and Compton alias Compton Abbatisse, Dors., and of Donhed St. Mary's alias Donhed Mary and Donhed St. Andrews alias Donhed Andrewe, Wilts —Shaftesbury; the lordship and manor of Leighton, Soms., and the rectory and the advowson of the vicarage of Clofforde.Soms.,—Keynsham; the advowson of the rectory of Clapham, Surr.,—Merton. Woods named Madde Grove (7 ac.) and le Fry the (25 ac.) in Donhed Mary, Donhed Andrewe, Charleton and Combe and in Fernelande Common, Wilts.,—Shaftesbury; and a wood called Leighton Coppice (1½ ac.) in Leighton, Soms.,—Keynsham. A. messuage. &c., late in tenure of Geo. Roll and now of Sir Wm. Pounder, in the parish of St. Dunstan in Fletestrete. and a messuage, &c., called le Flowredeluce in the same parish in tenure of Jas. Harwarde, —St Mary Overey's mon., Surr. Del. Okyng, 1 Sept. 36 Hen. VIII.—S.B. (signed by Canterbury, Westminster, Petre, North, Sir Robt. Southwell, Moyle, Bacon and Duke). Pat. p. 8, m. 29. 2. Ciriac Petytte of Canterbury. Grant, for 476l., of a messuage and wharf. &c., in the parish of St. Michael at Quenehithe, London, leased to Ric. Townesende,—London Charterhouse; a tenement, &c., there in tenure of Thos. Bakyn,—free chapel of St. Martin le Graunt; messuages, &c., in the parish of St. Mary Aldermanburie, tenants Andrew Prees. Jas. Fynyall (? cujusdam Jacoby Fynyall). Eliz. Downe and eight others (named), in the parish of St. Andrew in Cornehull, tenant John Studde, and in the parish of St. Giles without Creplegate, tenants John Helde ("le Reed Lyon") and Alex. Harryngton,—Hallywell priory; a tenement wit.hin the site of the late Austin Friars, in tenure of Wm. Bodye and tenements in the parish of St. Benedict, London, in tenure of Robt. Molton and John Freman,—Austin Friars; tenements, &c., in the parish of St. Olave near the Tower, tenants John Shepested and three others (named), and in the parish of St. Stephen in Colmanstreate, tenants Jas. Scotte and Hugh Dyer,—St. Helen's priory; a tenement, &c., in the parish of St. Botolph without Algate, tenant Ric. Scott,—Minories priory; a tenement, &c., called Isborowes in Frynsbury alias Frendesbury and Cowlynge, Kent, in tenure of Wm. Sedley.—Dartforde priory; tithes in Cowsted and Borden, Kent,—St. Augustine's abbey near Canterbury; a tenement and garden in the street of St John, Midd. (between those in tenure of the relict of Thos. Kydde on the north and of Ric. Browne on the south, the highway on the west and the stone wall of the late Charterhouse on the east) in tenure of Ric. Browne, and two other tenements there (situations similarly described) in tenure of Ric. Browne and Margery Smythe,—St. John's of Jerusalem; two gardens in the parish of St. James in Clerkenwell, Midd. (one lying opposite the fountain in Tornmylstrete beside Clerkenwell, in tenure of Robt. Hornedall and the other in Saint Johnstreate near London, beside le Whyte Wyllowe there in tenure of John Faunte. in tenure of the said Ric. Browne).—Clerkenwell priory; the reversion, and rent reserved on a 21 years' Crown lease of 8 May 32 Hen. VIII., to John Alexander and Wm. Hewett, of two tenements in the parish of St. Mary of Aldermanbury. London, also messuages, &c., there in tenure of Wm. Reynolde, grocer, Chr. Washeford and Thos. Bardsetwor.—Elsyngspyttell. Del. Oking, 1 Sept. 36 Hen. VIII.—S.B. (injured, signed by Canterbury, Hertford, Westminster, Petre, Bakere, North and others whose signatures are lost). Pat. 36 Hen, VIII., p. 16, m. 1. Richard Eyton, keeper of the records in the Tower of London. Del. Okyng, 2 Sept. 36 Hen. VII.—S.B. (signed by Westminster and Petre). Pat. p. 8, m. 21. Hugh Fuller, one of the auditors of the Court of Augmentations and also of Bukkynghamslandes. Del. Okyng, 2 Sept. 36 Hen. VEIL—S.B. (signed by Westminster and Petre). Pat. p. 8, m. 48. 4. Jaques du Prier, merchant of Andwerpe. Licence to export 500 wey of Essex cheese and 2,000 qr. of malt or barley. Del. Oking, 3 Sept. 36 Hen. VIII. —S.B. (countersigned by Paget with memorandxim that "this warrant is divided into three several patents, one for the cheese alone, the other twain equally divided the grain": endd. as "at the suit of th'Ambassadour.") French roll, 36 Hen. VIII., m. 1. In English. 5. William Brown, the King's servant. Grant in fee, for 240l., of the reversion of the farm or marsh called Barnemersshe, Essex, which belonged to Edw. duke of Buckingham, attainted, and was granted, 3 April 15 Hen. VIII., to Sir Francis Brian and the heirs male of his body. Also grant of the premises. Del. Oking, 4 Sept. 36 Hen. VIII.—S.B. (signed by Westminster, Petre, Bakere, Moyle, North, Chydley and Caryll). Pat. p. 4, m. 20. 6. John Elyot, James Horswell and William Hawkyn [s]. Commission (upon their suit to the Council for leave to prepare themselves to the sea to annoy the King's enemies and defend the realm "at our proper costs and charges with four, six and eight barks of your company or retinue") to take up in cos. Cornw., Devon, Soms. and Dors, ship-masters, pilots, mariners, gunners and soldiers, and also victuals and artillery. Okyng, 6 Sept. 36 Hen. VIII. Pat. p. 8, m. 1d. In English. 7. Thomas Wallessey, clk., King's chaplain. Presentation to the parish church of Aston Clynton, Linc.dioc, void by the death of Thos. Jakeman. Del. Okyng, 6 Sept. 36 Hen. VIII. S.B. (endd. as at the suit of Mr. Peckham, cofferer). Pat. p. 8, m. 49. 8. Oliver Leader, of London, and Frances his wife. Grant in fee, for 239l. 17s. 2d., of the site, &c., of Stoneley priory, Hunts, and 60 ac. called Cowepasture there, 139 ac. of land, 1 ac. at Bradenwell [and] a common of pasture in Agden, now in his tenure, also a messuage, &c., and windmill called Akeden mills in Stoneley in tenure of Ralph Downes, messuages, &c., in Halleweston alias Hale Weston, Hunts, Stoughton Parva, Beds, and Stoughton Magna and Graffname, Hunts, and closes (specified) in Stoneley in tenure of John Fell and Thos. Pyngell,—Stoneley priory. The advowsons of the rectory of Stoughton Parva. Beds,—St. Johns of Jerusalem; and of the vicarage of Southoo, Hunts,—Huntingdon priory; and four groves of wood (3 ac.) in Kymbalton parish, Hunts —Stoneley priory. Also grant to the said Oliver, in fee, of the lands in Oxsted, Surr., in tenure of — Done, which belonged to the duke of Buckingham, attainted. Del. Okyng, 6 Sept. 36 Hen. VIII.— SB, (signed by Canterbury, Hertford, Westminster. Petre, North, Sir Robt. Southwell, Moyle, Bacon and Chydley., Pat. p. 19, m. 11. 9. William and Francis Sheldon. Grant, in fee to the said William, for 20l. 9s. 1d., of all lands in Worcester in tenure of the bailiffs and commonalty, which are parcel of Warwikes and Spencerslandes, except the watermill called Froggmyll, parcel of the manor or lordship of Perycourt. Also grant, for 480l. 5s. 3d., of rent and service from lands in Newenham in Aston Cantlowe, Warw.. of the Guild of Aston Cantlowe, and a messuage, &c., in Newenham in tenure of Ric. Gretewhich, —Studley priory; a messuage in Tonworth, Warw., in tenure of John Fulwood and one in Buttlers Marston, Warw., in tenure of Nic. Capper,—Pynley priory; and all possessions of Pynley in these places; lands in Preston Bagote, Warw., in tenure of John Oldenhall alias Oldenall,—Wroxhall priory; two messuages, &c., in Catten, Derb., in tenure of John Higg and Thos. Smyth,— Repyngdon priory; the fair called Parshore Feyer annually held at Parshore, Wore, —Parshore; the site, &c., of the late monastery of Parshore, pasture called Wynyarde (30 ac.) in Parshore in tenure of Conan Richardson, the manors of Olde Parshore and Newe Parshore, Worc., woods called Thorndon Coppice (2 ac.) and Chevington Wood, (18 ac.) in Parshore, Bucknelles (10 ac.) in Besford, Wore, Ramsden Wood (40 ac.) in Parshore, Abbottes Wood (50 ac.) in Wadbarowe, Worc., and Challing Coppice (8 ac.) in Parshore. all of which belonged to Parshore mon; and all possessions of that monastery in Olde and Newe Parshore, except the rectories and advowsons of St. Andrew and St. Cross in the town of Parshore; lands called Wythycombe and Westgrove in the parish of Hasler,Warw., —College of St. Mary in Warwick; lands called Denston Riddynges alias Denxston Riddinges in the parish of Somersall alias Churche Somersall, Derb., in tenure of John Forman,—Rocetour, Staffs., and all possessions of Roceytour there; a toft, &c., in Whetston, Leic., in tenure of Ric. Stretton,—College of St. Mary in Warwick. Del. Oking, 8 Sept. 36 Hen. VIII.-S.B. (signed by Canterbury, Westminster, Petre, Bakere, Sir Robt. Southwell. Moyle, Bacon and Duke). Pat p. 4, m. 21. Also woods called Stratfeld (10 ac). Water Pyttes (10 ac.) Myles Fryth (20 ac), Depe Merkeham (8ac. ), Stonythryfte (10 ac ), LongNakers (13 ac), and Whyte Alee, (13 ac. ), in Yanworth,—Winchelcombe; woods called Howgrove (4 ac. l ro. ), Ingrames Grove (1 ac. 1 ro. ), Pildowne (2 ac. ), Wilcockes Doune (1 ac.) and Duncis Coppice (2 ac.) in Bastilden,— Reding; and woods called Calmesden Grove alias Old Gorye (2 ac. ),—Quenyngton, and Whyttington Coppice (53 ac), parcel of Warwikeslandes and Spencerslandes. Except woods called Mythe Wood and Waltons Wood (90 ac.) near the demesne lands of Tewkysburye. Del. Okyng, 8 Sept. 36 Hen. VIII.—S.B. (signed by Canterbury, Westminster, Petre, Bakere, North, Sir Robt. Southwell, Moyle, Hendle and Bacon). Pat. p. 6, m. 14. 11. Chr. Campyon, of London, mercer, and John Rollesley. Grant in fee, for 996l. 12s., of the messuage, &c., formerly in tenure of John Brydges and now of John Rollesley in the parish of St. Botolph withoutBusshoppesGate.London, (abutting upon the highway east and west and upon the tenement of Wm. 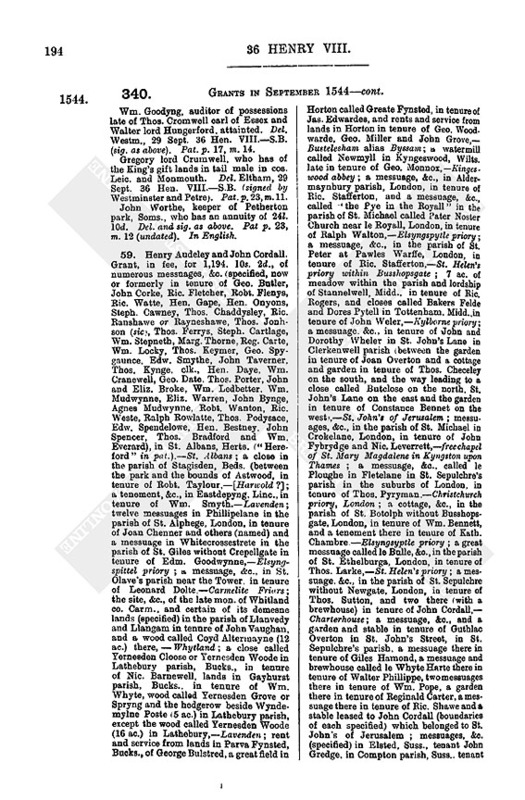 Hollys on the north and that of John Newton on the south), five messuages, &c., in tenure of Giles Motherbye in the same parish (between lands of St. Mary Spittle on the north and east, the tenement of lady Kath. Adams on the south, and the highway on the west), seven messuages. &c., (tenants not named) in the same parish (between tenements of Geo. Hollond on the north, of the Mercers Company on the south, the highway on the east and the tenement of Geo. Hollond on the west, extent given), four messuages in tenure of Ric. Buttyll and three others (named) in the parish of St. Alban in Woodstrete,—all which premises belonged to St. Mary's priory or hospital without Busshoppesgate; the messuages formerly in tenure of Robt. Howse and Philip Fraunces, and now of Wm. Shelton, in the parish of St. Mary att Axe, and all the messuages, &c., in tenure of Thos. Tomson and 9 others (named) in the parish of St. Andrew Undershafte,—St. Helen's priory; two messuages in tenure of Thos. Elyott, a messuage, formerly in tenure of Thos. Settyll and now of John Hole, lands in tenure of John Burton near the close called le Curteyn (between the stables of the earl of Rutland on the north and the great tenement at the end of le Curteyn on the south. 31 perches, and between le Curteyn on the west and the highway on the east 2½ perches) and the barn and stable in tenure of John Burton, all in the parish of St. Leonard in Shoredyche near London,—Hallywell, Midd. ; a messuage. gatehouse, &c., in tenure of Alice Maior, widow, in the parish of St. Botolph without Busshoppesgate (between the tenement of Gerard Churche on the north, the highway and said hospital on the east and west and the tenement of Wm. Bewlegh on the south),—St. Mary without Busshoppesgate; four messuages &c., in tenure of John and Joan Paynter, in the parish of St. Alban in Woodstrete, London (between the lane leading to the church of St. Mary Stanynges on the south and the tenements belonging to the priory called Saynt Marye Spytle on the north), and two messuages in Hosiar Lane in the parish of St. Mary de Arcubus, in tenure of Robert Bogas,—Dertford priory, Kent; a messuage in tenure of Wm. Morris, and another, formerly in tenure of Ric. Bradley, and now of Humph. Smythe, in the parish of St. Botolph without Algate, — Minories priory; a messuage in the parish of St. Ethelburga, in tenure of Ric. Tryge, and messuages in the parish of St. Michael in Cornehyll in tenure of Eliz. Petro and Wm. Crofton,—St. Helen's; a messuage in tenure of Thos. Settyll, and others formerly in his tenure and now in that of Thos. 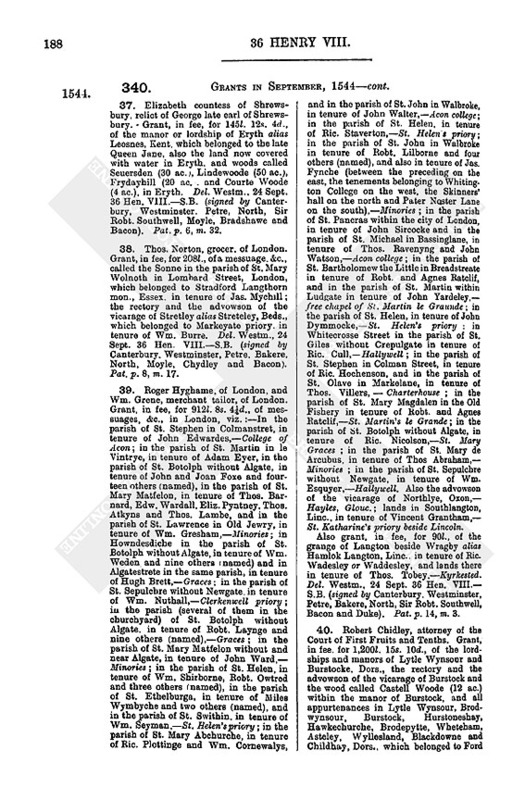 Selby and John Thomson, in the parish of St. Leonard in Shoredyche, and six messuages in the parish of All Hallows in London Wall, in Foxetayle Aley, in tenure of Thos. Pennyngton,—Hallywell; a messuage in the parish of St. Mary Magdalene in the Old Fishery in tenure of Wm. Storye,—Clerkernvell priory; messuages in the parish of St. Mary Woolchurche, in tenure of Ph. Gunter (in Cornehill) Chr. Vaughan. Wm Birdall. Wm. Sheperde and John Wetherell (formerly of Marg. Dyer),—London Charterhouse; a messuage, &c., in the parish of St. Mary de Arcubus, and another called le Maiden Hedde in the street near Thamys Streat in the parish of St. Martin Orgar, London, in tenure of John Johnson alias Jenkyns,—Dertford; messuages, &c., in the parish of St. Olave in Southwark in tenure of Lambert Dene, Wm. Throw. Thomas Boland, Dominic Herman, Robt. Bull and John Harward, a messuage called le Whyte Lyon in tenure of Hen. Mynce in the parish of St. Mary Magdalene in Southwark (between the new churchyard of St. Olave's on the east, the garden of Lewes mon, on the west, the highway on the north, and the sign of the Ball, which belonged to the late hospital of Thomas Beket, on the south), and a garden, &c., in tenure of Walter Carter in the parish of St. George in Southwark,—St. Mary Overie. Del. Westm., 8 Sept. 36 Hen. VIII.—S.B. (signed by Canterbury, Hertford, Westminster, Petre, Sir Robt. Southwell, North, Bakere and others whose signatures are lost). Pat. p. 13, m. 26. 12. Robert Lawerde alias Loorde. Grant in fee, for 102l., of the inn called le Bell, in tenure of John Thetforde in Mynchynlane, in the parish of St. Dunstan in le Est, London, and a stable and garden in tenure of John Wattes there,—St. John's mon., Colchester. Henry Whytereason, receiver of the earl of Northumberland's lands in Yorkshire and Cumberland. Del. Westm., 10 Sept. 36 Hen. VIII.—S.B. (signed by Westminster and Petre). Pat, p. 5, m. 4. Nicholas Cracher astronomer, who has of the King's gift houses in London to the yearly value of 8l. Del. Westm.. 10 Sept. 36 Hen. VIII.—S.B. (signed by Westminster and Petre . Pat. p. 23, m. 8 (dated 10 December). 14. Henry Bradschawe. Grant in fee. for 301l 2s. 2d., of the field called Courtfelde and many other fields and lands named within the lordship of Wendover Forrens and parish of Wendover, Bucks., viz., lands in tenure of Hen. Lechirigham, Sir Ralph Verney, Wm. Le, the said Hen. Bradechawe (formerly of the late prior of St. Mary de Overey), Thos. Bracy (at Welhedde), Benedict Bradschawe (position given with regard to lands in tenure of Ralph Assheton, John Carter, Sir Ralph Verney and the common way leading into Buryfelde) and Hen. Egleton, a meadow called Nepye beside Beerton and a load of firewood yearly out of the wood upon Backecombe. in tenure of Thos. Shefforde, the warren of coneys, hares, partridges and pheasants within the said lordship in tenure of Ric. Grenewey, arable land (position given with regard to lands lately in tenure of Sir Ralph Verney and John Chelsey) lately in tenure of John Hare and now of Thos. Carter, and other arable lands (position given with regard to lands lately in tenure of John Welhedde, John Chelsey. Thos. Frere. Robt. Lechingham and Win. Towersey) formerly in tenure of Ric Hare and afterwards in that of John Hare and now of Ric. Hare, with all appurtenances in Wendover parish and Broughton, Bucks. —the late Queen Jane. A messuage called Brunes beside Hameltun St. Leonard's in the parish of Aston Clynton. Bucks., with fields (named) which formerly belonged to one Ric. Brunes, and other demesne lands at Dunrygge there, called grange lands (named) on the north and south sides of the road leading from le Hale to Chessham, all which belong to Brunes; also a messuage called Brownes. formerly in tenure of Nic. Browne and previously called Yanelodes; both which messuages called Brunes and Brownes belonged to the mon. of Missenden Magna and were lately in tenure of Ralph Verney, alderman and mercer of London. Ric. Fowler, John Baldwyn and John Martyn.— Missenden Magna. A messuage. &c., in Noke or Nooke parish, Oxon, lately in tenure of Thos. Andrewys of Islippe,— Osney; a parcel of land in St. Saviour's parish. Southwark. containing the two tenements of Humph. Hadnett and Ric. Curtes (extent and situation given with regard to the lane beside the house of the late prior of St. Swithin's, Winchester, leading from the Thames to the late church of St. Margaret, and the tenements called le Thre Crownes, late of Hen. Saunder and now in tenure of Thos. Weste).—St. Mary Overey. A tenement, &c., (between that late of Ric. Bradley on the east, and that of Thos. Clerke on the west, the garden lately in tenure of John Studde on the north and the highway on the south), four cottages, &c., (between Chancellor Lane on the east and the garden late of John Studde on the west, the tenement of Walter Dogayn on the north and that of Ric. Bradley on the south) and a tenement. &c., (between Chancellor Lane on the east and the tenement late of John Studde on the west and north, and that of Ric. Bradley on the south) all in the parish of St. Dunstan in Fletestrete, London, and in tenure of Hen. Taylour. Also two tenements, &c., (between the tenement of Lancelot Stronge on the west, the highway on the north, the tenement of Hen. Johnson on the east and the garden wall of the Middle Temple on the south) in tenure of Thos. and Anne Richardes and Wm. and Kath. Carfaunt; a tenement (between those late of George Hairolde on the east and Wm. Rowley on the west, the garden formerly in tenure of Ric. Bridges on the north and the highway on the south) in tenure of Thos. and Joan Offer; two tenements (between those late of John Walke, stringer, on the east and John Lorkyn. Butcher, on the west, the garden late of Ric. Bridges on the north and the highway on the south) in tenure of John Purvy, and a tenement, &c., (between those of Jas. Duckett on the east and Patrick Michelson on the west, the highway on the north and the wall of the Middle Temple garden on the south) in tenure of the said Thos. and Anne Richardes; all in the parish of St. Clement Danes, Midd. ; —St. John's of Jerusalem. Del. Westm., 10 Sept. 36 Hen. VIII.—S.B. (signed by Canterbury, Westminster, Petre and others whose signatures are lost). Pat. p. 6 m. 6. 15. Thomas Persse. Gran t. in fee, for 138l. 6s. 8d., of the reversion of the lands specified in the following life grants:— (a) 8 Dec. 33 Hen. VIII. to Jerome and Francis Benall, of a tenement in the west end of the church of the late Grey Friars beside Newgate, London, (b) 20 Jan. 32 Hen. VIII, to Lady Anne of Cleves, of all the lands in Bustlesham Mountague and Cokeham, Berks, which belonged to Bisham mon., and c) 26 Feb. 30 Hen. VIII., to Ralph Bolney, of le Crowne and three little tenements adjoining it in the parish of St. Dionis Bakchurche, London, viz., the said tenement of Jerome and Francis Benall, a messuage in Bisham alias Bustlesham Mountague, Berks (beside Marlowe bridge), with a meadow of 3 ac. behind it and a " le wynche" and " le eight" in Thames, and the fishing in Thames pertaining to them, in tenure of John Brynkehurst, the mills called Temple Milles under one roof in Bisham, with the fishery and fishing of the waters of Thames from Temple locke to -le over ende de le Westmeade" in Bisham, and from the ende of le Severne and Westmeade to a place called le Stonehouse, in Bisham and Cokeham, and all lands in Bisham and Cokeham in tenure of John Brynkehurste and John Hale, the meadow called Severne and strip of land between it and Temple Mills in Bisham, and the messuage called le Crowne, &c., in the parish of St. Dionis Bakchurch, which belonged to St. Augustine's mon. beside Canterbury. Also grant of all the premises. Del. Westm., 11 Sept. 36 Hen. VIII.—S.B. (signed by Canterbury Westminster. Petre, Bakere, Sir Robt. Southwell, Moyle, Duke and Chydley;. Pat..p. 18, m. 21. 16. John Lute, of London. Lease of the site and demesnes of the manor of Chiverell Burnell, Wilts, which belonged to lord Hungerford, attainted; for 21 years. Del. Westm., 11 Sept. 36 Hen. VIII.—S.B. (signed by Daunce and Moyle). Pat. p. 17, m. 5. 17. Sir William Petre. one of the two Principal Secretaries, and John Keyme. Grant in fee, for 55l. 17s. 6d. paid to the General Surveyors and 136l. 23d. paid to the Augmentations, of the reversion of the manor of Blounteswalles, Essex, and also of the said manor of Blounteswalles, which belonged to Thobie priory and to Cardinal Wolsey attainted. (It is stated in the preamble, that Wolsey. being possessed of the site, &c., of the late priory of St. Leonard of Thobye, the manor called " the prior of Thobies manor" in Gyngmountney alias Mountenesing, and the manor of Blountes Walles, with their appurtenances in Thobie, Gyngmountney, Blunteswalles, Cupfeld Wyndall, Parva Wareley.Marsez, Nofelles alias Norttfelles, Rome, Maylond, Mowlond Wyndhall, Rumwell, Bobyngworth, Spryngfeld, Hereford Stoke, Paching, Shenfeld, Ingraff, Rawrethe, Colchester, Borham. Stondon, Wryttell, Shelow, Gingmargaret, Cubsaunt and Shenfeld, Essex, which belonged to the said priory, enfeoffed his college in Oxford therein, and they came by his attainder to the King, who granted them to Sir Ric. Page for life.) Also the manor of Baglake in Longbredye parish, Dors., which belonged to Cerne mon. Also woods called Haveringes Grove (3 ac.) in Blunteswalles, and the woods (2 ac.) growing in the hedgerows there, which belonged to Thobie mon. Del. Westm., 11 Sept., 36 Hen. VIII.—S.B. (signed by Canterbury, Westminster, Bakere, Sir Robt. Southwell, Moyle, Hendle and Staunford). Pat. p. 8, m. 27. George Wryght, surveyor and receiver of purchased and exchanged lands. Del. Westm., 11 Sept. 36 Hen. VIII.—S.B. (signed by Westminster and Petre). Pat. p. 8, m. 49. Sir Richard Bulkeley, who is (jointly with Sir Hen. Knevett) constable of Bewmarrys castle and captain of the town of Bewmarrys. Del. Westm., 11 Sept. 36 Hen. VIII.—S.B. (signed by Westminster and Petre). Pat. p. 3, m. 18. 19. John Perient and Wm. Tooke. Grant in survivorship of the office of one of the auditors of the Court of Wards. On surrender of pat. 24 Jan 35 Hen. VIII. granting the office to Perient alone. Del. Westm., 12 Sept. 36 Hen. VIII.— S.B. (countersigned by St. John). Pat. p. 2, m. 24. 20. Robert Maye. Grant, in fee, for 7841. 18s., of the manor or grange of Hydon, Soms., in tenure of Ralph Hopton (except tithes and the pastures called Estebyterox and Westebyterox, Witham and Frary), and a wood called Bytcombe Wood alias Hydon Wood (52 ac.) in Wytham Frarye, Blagden and Predye, which belonged to Wytham mon. Del. Westm., 12 Sept. 36 Hen. VIII.—S.B. (signed by Canterbury, Westminster, Petre. Sir Robt. Southwell, Moyle, Bacon and Duke). Pat. p. 8, m 26. 21. John Cokk and John Wrothe. Grant, in fee to the said Cokk, for 478l. 15s., of the lordship and manor of Madecrofte alias Maydencrofte. and a wood called Weyndon alias Wendon Wood 62½ ac.) in Madecrofte, Hychen and Pollettes. with appurtenances in Madecrofte, Hychen, Pollettes and Offeley, Herts,— late countess of Richmond. Also grant (in fee to the said Cokk), for 405l. 18d., of the demesne lands of the manor of Wyllarsey Bartram, Glouc, in tenure of Wm. Fowler alias Rollewryght, John Smyth, Wm. Wylkes, Ric. Gonne, Thos. Lee, John Wylkes and Wm. Rollewryght, lying among the lands of Sayntburye manor, Glouc., and pasture for six cows and a bull and 300 sheep in these lands, and in the common places in Sayntburye,—Evesham. The advowson of the rectory of Blake Notley, Essex. A messuage, &c., in tenure of Lancelot Stronge in the parish of St. Clement Danes, without the bars of the New Temple London (between tenements of Wm. Carfante on the east and Wm. Wastelynge on the west, the highway on the north and the garden of the Middle Temple on the south), and other tenements (position of each similarly given, between the highway on the north and the gardens of the Middle and New Temples on the south) in tenure of Lancelot Stronge. Matilda Crowe, James Duckett (two), Thos. and Anne Rychardes (three), and Hen. Johnson (four;, a messuage, &c., in tenure of Constantius Bennett in St John's Street in Clerkenwell parish (between the highway on the east and St. John's Lane on the west, the tenement of Thos. Checheley on the south and the path leading from St. John's Lane to the tenements of John Salmon and Ric. Clerk on the north), a garden in tenure of the said Bennett (between the garden of John Wheler, sen., on the east and the close called Butclose on the west, the garden of Olive Overton on the south and the path leading to the said close on the north), and a messuage, &c., in tenure of Ric. Broke in St. John's Street in the parish of St. Sepulchre without Newgate (between the tenement of Thos. 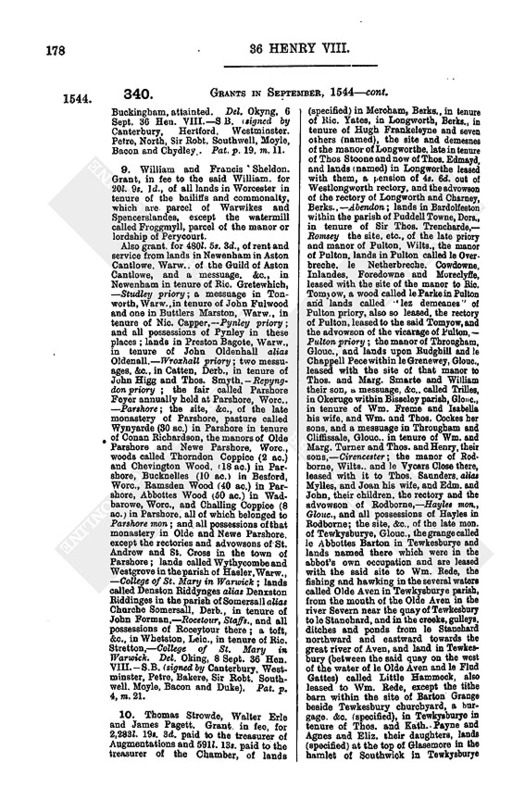 Checheley on the north and the stable of Olive Overton on the south, St. John's Lane on the west and the highway on the east), and a little messuage adjoining it, also in his tenure (formerly in that of Wm. Hamon), and a garden in tenure of Ric. Broke in St. John's Street within Clerkenwell parish (between the garden of Thos. Checheley on the east, Butclose and the way leading to it on the south and west, and a certain barn on the north),—St. John's of Jerusalem. A messuage, &c., formerly in tenure of Thos. Jakson and afterwards of Chr. Ryley in St. John's Street within St. Sepulchre's parish without Newgate (adjoining the bars of Westsmythfelde), —St. Bartholomew's. Del. Westm., 12 Sept. 36 Hen. VIII.—S.B. (signed by Canterbury, Westminster, Petre, Bakere, Sir Robt. Southwell, North, Moyle, Bacon and Duke). Pat. p. 8, m. 32. 22. John Eyer or Eyre, the King's servant. Grant in fee, for 665l. 8s. 10d., of the grange called Le Grange without the south gate of Bury St. Edmunds, in St. Mary's parish there, in tenure of Ambrose Jermyn, and numerous messuages, granges, gardens, crofts, etc. in various streets of Bury St. Edmunds in the parishes of St. Mary and St. James there, in tenure of Thos. Wryght, John Grene, Oliver .Hall, Robt. Davison, Rog. Dockelyng, Matth. Bolter, Thos. Mason, Jas. Lilley, Thos. Shepey, John Rowley, Eliz. Avys, Wm. Moretone, Leonard Watton, John Wysey alias Wasey, John Rowght, Thos. Regate, John Chapman, John Adames, Barth. Baynham, Thos. Williams alias Senyhall, John Bryden, John Howlett, John Regate, Thos. Reche, Ric. Sadde, Thos. Shepyn alias Shippey alias Sheppey, Hen. Tame, John Holte, Robt. Oliver, George Watton, John Bright, John Stephenson, Geo. Skelles, Robt. Gylberte, Joan Baptiste, Robt. Caneham. Marg. Yole, Thos. Highame, Nic. Wood, John Thorpe, Robt. Huntman, Ric. Byrde, and about 85 others named, and the rents called "Haddegovell rent" within the said parishes; also a messuage and croft (boundaries given) in Upwell. Camb.. in tenure of John Eyer, —Bury St. Edmunds. Lands in Mendhame, Suff., in tenure of John Godfrye.— Redlyngfeld; a messuage, &c., in Roxhame, Norf., in tenure of Wm. Carter,— Weste Dereham; a great close called Wadingstowe in Owtwell, Norf., in tenure of Thos. Calleye.—Walsinghavie priory; lands in Northcreke, Norf., in tenure of John Knapes and Ric. Maunser,— Flyxton priory, Suff. ; lands in Steple Bumpsted, Essex., in tenure of John Cutteras,— Bury St. Edmunds; the house, &c., of the late White Friars in Cambridge; two messuages, &c., in the parish of St. Martin Coslane, Norwich, in tenure of John Pakkoner and Wm. Woodes, worsted weaver,—Walsinghavie priory; a tenement, &c., in Estgatestrette in St. James's parish, Bury St. Edmunds, late in tenure of Joan Payne and now of John Rudlond, coverlet weaver,—Thetford nunnery, Norf. ; the manor of Fawcons and Stustons, Suff.,—Flixton priory; rent of 5s. and service due to Horsehame priory, Norf., from a house in Norwich, in tenure of Ric. Walker. Also grant in fee, for 72l., of the watermill called Seynt John's Milne in Horseadowne, Surr., late in tenure of Chr. Craven and now of Hugh Eglesfeld, with four loads of timber yearly out of Yngatestone Wood, Essex, for its repair,—St. John's of Jerusalem. Del. Westm., 12 Sept. 36 Hen. VIIL—S.B. (signed by Canterbury, Westminster, Petre, Bakere, North, Sir Robt. Southwell, Bacon and Duke). Pat. p. 18, m. 23. 23. Ric. Maunsell, of London, and Brian Barkar. Grant in fee, for 662l. 5s. 8d., of a tenement in the parish of St. Michael Quenehithe, London, in tenure of Hen. Nortrige, a messuage, &c., in the parish of St. Benet Gracechurch in tenure of Nic. Norton, four messuages, &c., in tenure of Sebastian Hillary, one in tenure of John Kycthynman (sic) and one in tenure of Ralph Boldon, in the parish of St. Mary Abchurche, five messuages in Barmondesey Strete in the borough of Southwark (between the highway on the east, the lands of Hen. Goodyere on the south and west and the tenement of Jas. Pakman on the north) leased to Robt. Bysshopp, cottages (tenants named) in the parish of St. Olave in Southwark, viz , eight in Watergate and thirteen in Pursez Alley, also five in Peper Allye in St. Saviour's parish there, two messuages, &c., within the churchyard of St. Saviour's church there in tenure of Hamo Coste, and eight other messuages within the same churchyard in tenure of Wm. Roo and others (named), messuages in the parish of Newington. Surr., in tenure of Laur. Fynche, in the parish of St. Saviour, Southwark. in tenure of Wm. Emerson and Giles Hubrde (sic), and (outsidePursez Alley) in the parish of St. Olave, in tenure of Walter Cartar, nine messuages in Newington parish in tenure of Thos. Dyxon, and ten in that of St. Saviour in tenure of Thos. Bullye and others (named), and a garden in Newington parish in tenure of John Innyns; also a house, &c., in tenure of Wm. and Margaret Thomas in the parish formerly called St. Mary Magdalen's and now St. Saviour's in Southwark (between Fowle Lane on the south and the way leading to the churchyard of St. Mary Magdalen's on the north, the tenement of St. Mary Overey priory on the east and the highway leading past the manor of le Clynke, from Southwark to the Thames on the west), and two tenements in St. Saviour's parish in tenure of John Byfeld and William Olyver, now curate of St.Saviour's. All which premises belonged to the priory of St. Mary Overey. Del. Westm., 13 Sept. 36 Hen. VIII.— S.B. (signed by Canterbury, Westminster, Petre, Bakere, North, Moyle, Bradshawe and Bacon). Pat. p. 6, m. 9. 24. John Knyghte, of Newbury, Berks., and Ric. Pykeryng. Grant, in fee to the said John, for 201l. 10s., of a tenement in le Weststrete of Newbury, beside the bridge there, in tenure of John Millett, a piece of void ground at the west end of New Lane and another at the east end of Northe Crofte Lane in Newbury, in tenure of Edw. Collyns, a parcel of ground in Oxenwoode in Shalborne parish, Berks., called Gascrofte and Haverynges,in tenure of Edw. Fetyplace, two messuages in Northe Broke Strete in Newbury, and lands called Oxehame in Thacham parish and Nyttes Mede in Newbury, in tenure of Walter Collyns, pasture called Tydhams and lands called Westfeld in Newbury parish in tenure of Nic. Cosyn, two closes called Horscroftes in Newbury in tenure of John Wynchecombe, a garden called Rackhays in Northebroke Street, in tenure of John Saunderson, and another beside lez Weste Mylles in Newbury, late in tenure of Robt. Myller and now of Wm. Coke, and lands called Jordans Lands in Newbury parish in tenure of Hen. Burges;— Charles duke of Suffolk. And three fulling mills called West Mylne alias the Upper, Middle and Nether Mills in Newbury, in tenure of Roger Benett and John Dallman, and certain lands (specified) in Newbury, in tenure of Ric. Hynde, Thos. Hynde, Matth. Childe, and John Saunderson,__ the late Queen Jane. Del. Westm., 13 Sept. 36 Hen. VIIL —S.B. (signed by Canterbury, Hertford, Westminster, Petre, Bakere, Moyle, North, Sir Robt. Southwell, Whorwood and Sewester), Pat. p. 8, to. 34. 25. Penthelao and Simon Spynola, merchants of Gennes. Passport to return into their own country by way of Flanders and Germany, with two servants, two horses, bags, baggages, and necessaries. Oking, 14 Sept. 36 Hen. VIII.—S.B. (signed by the Queen, countersigned by Canterbury, Wriothesley, Westminster and Petre). French roll 37 Hen. VIII., m. 2. In English. 26. William Ramsden. Grant, in fee, for 1,303l 5s., of the house, &c., of the late White Friars in Northampton, in tenure of Fras. Sam well, with its close called Shyide Close at the east side of the dormitory, in tenure of Ric. Johnson; and the house, &c, of the late Black Friars in Northampton in tenure of Hen. Henley; except buildings, lead, iron, glass, &c., of the churches, chapels, steeples, dormitories, cloisters and chapterhouses. A messuage, &c., called Spyttel Falle in Saxton, Yorks, in tenure of Wm. Hungate —St. Leonard's hospital in York; tithes in Wharmeley, Yorks, parcel of Huddersfelde rectory, in tenure of -----(blank) Stapleton,—St. Osioald's, Yorks. ; the grange called Carrehouse in Gressebroke in Rotheram parish, Yorks., in tenure of John Wirrall,—Monkebretton; a messuage in tenure of John Sharpe in Horton, Yorks., with a close called Burnettfelde in the town of Bollinge, Yorks., and all lands leased with the said messuage,— Kirkstall; lands called Kighley Landes, in tenure of Ric. Walker, in Welborne, beside the fields of Kyrkeby Moresyde, Yorks., with other lands specified in Welborne in tenure of Ric. and Ralph Walker, Wm. Hyke, John Walker, Wm. Syndelewe, Robt. Paycok, Wm. Colson. and many others (named). — Ryvalles; the grange called Loscoo Grange, Yorks.. in tenure of Joan and Normavile Redman, with a close called Monkeynge in Ayketon, and all other lands leased with the said grange, rent and service from lands of Roger Mallet in Loscoo, and a messuage, &c., in Pudsey. in tenure of Thos. Smyth and rent and service out of them formerly paid to ----(blank) Calverley,—Kirkestall; a cottage. &c., in Hartshed in tenure of Ric. Fletcher and three in Huddersfelde in tenure of John Armitage and rent and service from them paid to James Brotherid and also rent of 5s. from them lately paid to Agnes Hanson for her dowry, — Kirkeleys; lands specified in Welborne, Yorks., in tenure of John Clerk and Ric. 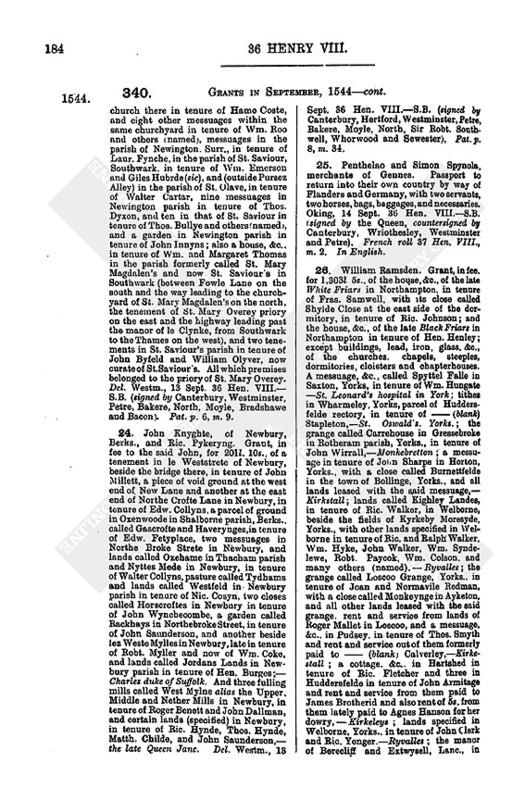 Yonger.—Ryvalles; the manor of Berecliff and Extwysell, Lanc, in tenure of John Towneley —Newboo; messuages, &c., in Dodworth, Yorks., in tenure of Robt. Attersley. Laur. Cutler, Wm. Senyor and John Nycolles —Pontefract; lands called Hampall Royde Holebrome. Shuldebrode and Hampall Flattes. in tenure of John Gawebert, in Hollandswayne. Yorks., Hampall priory; and a messuage, &c., called Brokehouse in Thorleston alias Thurleston, Yorks., in tenure of Thos. Attersley.—Monkebretton. Del. Okyng, 14 Sept. 36 Hen. VIII.—S.B. (signed with the stamp, countersigned by Norfolk. Suffolk, Wriothesley. St. John, Ryche, Sir Ric. Southwell, Bacon and Duke). Pat. p. 6, m. 29. 27. Robt. Chechestre, who has has of the King's gift lands in Suffolk to the yearly value of 20l. Exemption from attending the King in the war. Del. Oking, 17 Sept. 36 Hen. VIIL —S.B. signed by Westminster and Petre . Pat. p. 18, m. 13. In English. 28. Wm. Skrymshire, steward of the manors of Whetherby, Hunsyngore, and other possessions of the late commandry of St. John of Rybston, Yorks. Exemption from attending the King in the war. Del. Westm., 19 Sept. 36 Hen. VIII.— S.B. (signed by Hertford, Westminster and Petre). Pat. p. 24, m. 24. In English. To Sir Robert Tyrwhyt and Elizabeth his wife, in fee to the said Sir Robert, the house, &c., of the late priory of Irforde alias Urforthe, Linc.. and lands there and in Swynopp. Bynbroke, Croxby, Merket Stanton, Kyrmond (including the manor of Kyrmond in le Myre), Wykenby, Ludford and Thorpe in le Myres. Linc.which were granted to them by pat. 9 Dec. 31 Hen. VIII. in tail male to the said Sir Robert (see Vol. XIV. Pt. ii., No. 780 (12);, —Irford; lands called Swynethorpe, in tenure of Robt., Thos., and Ric. Shawe, in the parish of Olde Eagle, Luic, and Basyngharn Park (71 ac; there —Eagle preceptory and St. John's of Jerusalem. To Sir Robert Tyrwhyt and Thos. Kyddall, in fee to the said ,sir Robert, the lordship and manor of Templehylles, in Shernebroke parish. Beds., and certain closes, &c. (names and extents given) — Melcheborne preceptory and St. John's of Jerusalem; the lordship and manor of Hensyngton, Oxon., the chapel of St. John and the garden in the parishes of Bladon and Shypton upon Charwell, Oxon., in tenure of John Glasse, and messuages, etc. (specified) in these two parishes in tenure of John Byteham, John Waren, John Whytynge, Ric. Gybbes, John Barne, Joan Norres, widow, and Thos. Phyppes,—Sampforde preceptory and St. John's of Jerusalem; a messuage, &c., formerly in tenure of Wm. Norton and now of Edm. Maryat in Pateshull, Ntht..—St. James's beside Northampton; the lordship and manor of Westwilloughbye, and the lands in tenure of Thos. Pelle in Westwilloughbye and Ancaster, Linc, —Sir John lord Hussey attainted. Del. Okyng, 20 Sept. 36 Hen. VIII.—S.B. (signed by Canterbury. Westminster, Petre, Bakere, Sir Robert Southwell. Moyle, Hendle and Duke). Pat. p. 1. m. 16. 30. Robert Merburye, Serjeant at arms and feodary of the Duchy of Exetour in co. Devon. Exemption from attending the King in the war. Del. Westm., 20 Sept. 36 Hen. VIII.—S.B. (signed by Westminster and Petre). Pat. p. 3,m. 37. 31. John Fyssher and Katharine his wife. Grant, in fee to the said John, for 626l. 2ld.. of the lordship, town and manor of Pakington alias Packington Prior, Warw., the tithes there pertaining to the parish church, the advowson of the vicarage of Pakington, woods called New Hewe Wood (20 ac. ), Great Closse Wood (70 ac). New Percke Wood (36 ac), and Olde Percke Wood (20 ac.) and 13 ac. of wood on Pakington Common, all within the lordship of Packington; which premises belonged to Kenelworth mon. Del, Okyng. 20 Sept. 36 Hen. VIIL—S.B. (signed by Westminster, Petre. Bakere, North, Sir Robt. Southwell. Moyle, St. John, Ryche, Sir Ric. Southwell, Hendle and Staunford). Pat. p. 6, m. 26. 32. Wm. Rammesden and Ric. Charlesworth. Lease of two watermills in Holmefryth within the lordship of Wakefelde, late in tenure of Ric. Beamonde, and one in Soureby, called Warley Mill, within the same lordship, late in tenure of John Haldeworth; for 21 years. Del. Oking, 20 Sept. 36 Hen. VIII.—S.B. (signedby Daunce and Moyle). Pat. p. 18. m. 12. 33. Hen. Webbe. Grant in fee, for 136l.,of the messuage, chambers, gardens, &c. (positions described), in his tenure and that of John Foster and Ric. Manours within the precinct of Halywell nunnery, Midd., with other of the convent buildings and gardens there. With certain reservations, including the south aisle of the church, leading from the earl of Rutland's lodging to the chapel called ' Sur Thomas Lovelies chapel,' and the house in tenure of Kath. Carleton. Del. Westm., 23 Sept. 36 Hen. VIII—S.B. (signed by Canter bury, Westminster. Petre, Bakere, North, Moyle, Sir Robt. Southwell. Hendle and Chydley). Pat. p. 1, m. 4. 34. Thos. Bochier, of London. Grant in fee, for 112l. 16d., of messuages, &c. (specified:—in London, viz. in the parish of St. Botolph without Algate, tenants Wm. Smyth, clk., and Percival Cowden, Geoff. Dewtye alias George Harrison, James Former, Jas. Harbberd (in Estesmythefeld), Hugh Everett (in Estesmythefeld), and John Lawrence; in the parish of All Hallows at Dowgate, tenant Wm. Aunderson; in the parish of St. Martin in the Vintry, tenant John Feld; in the parish of St. Andrew in Holborne, tenant Wm. 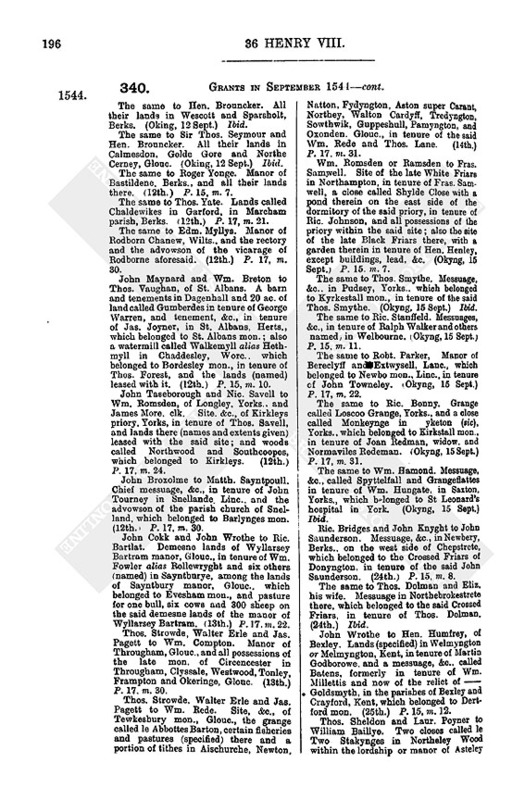 Gymblett; in the parish of Michael ad Bladum, tenant Adam Beeston (including the tenement called le Crowne); in the parish of All Hallows at Dowgate, tenants John Derbye, Thos. Coockes, John Ryen. Wm. Mynton, Adam Beeston, and Ric. Salmond.—Graces beside the Tower. Also a messuage, &c., in the parish of All Hallows in Temestret. tenant Chr. Bolton,—Minories nunnery; two messuages, &c., within the site of the late Friars Preachers in London, tenant Anne Curson and—blank) Marye; a messuage. &c., within the site of the late Carmelite Friars in London tenant John Drayne; a garden within the site of the late Friars Minors in London, tenant John Baynton, a messuage there in tenure of Eliz. 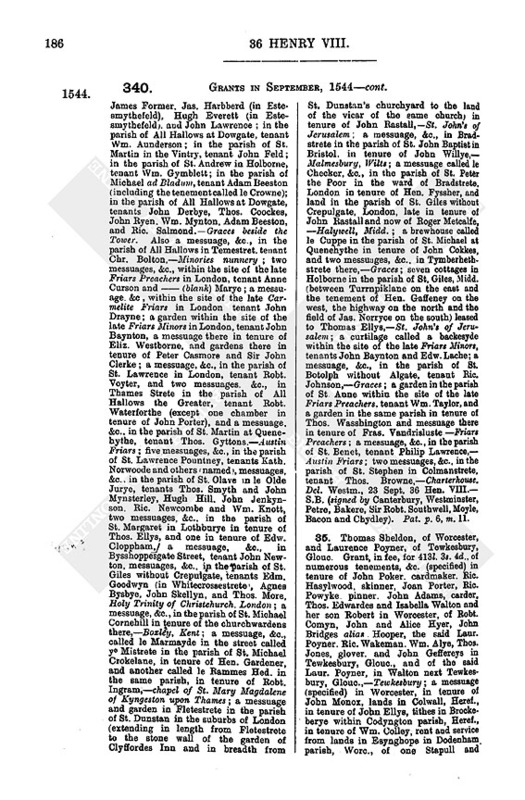 Westborne, and gardens there in tenure of Peter Casmore and Sir John Clerke; a messuage, &c., in the parish of St. Lawrence in London, tenant Robt. Voyter, and two messuages. &c., in Thames Strete in the parish of All Hallows the Greater, tenant Robt. Waterforthe (except one chamber in tenure of John Porter), and a messuage, &c., in the parish of St. Martin at Quenehythe, tenant Thos. Gyttons.—Austin Friars; five messuages, &c., in the parish of St. Lawrence Pountney, tenants Kath. Norwoode and others (named), messuages, &c., in the parish of St. Olave in le Olde Jurye, tenants Thos. Smyth and John Mynsterley, Hugh Hill. John Jenkynson. Ric. Newcombe and Wm. Knott, two messuages, &c., in the parish of St. Margaret in Lothburye in tenure of Thos. Ellys, and one in tenure of Edw. Cloppharn, a messuage, &c., in Bysshoppesgate Street, tenant John Newton, messuages, &c., in the parish of St. Giles without Crepuigate, tenants Edm. Goodwyn (in Whitecrossestrete), Agnes Bysbye. John Skellyn, and Thos. More, Holy Trinity of Christchurch. London; a messuage, &c., in the parish of St. Michael Cornehill in tenure of the churchwardens there,—Boxley, Kent; a messuage, &c., called le Marmayde in the street called ye Mistrete in the parish of St. Michael Crokelane, in tenure of Hen. Gardener, and another called le Rammes Hed. in the same parish, in tenure of Robt. Ingram,—chapel of St. Mary Magdalene of Kyngeston upon Thames; a messuage and garden in Fletestrete in the parish of St. Dunstan in the suburbs of London (extending in length from Fletestrete to the stone wall of the garden of Clyffordes Inn and in breadth from St. Dunstan's churchyard to the land of the vicar of the same church) in tenure of John Rastall,— St. John's of Jerusalem; a messuage, &c., in Bradstrete in the parish of St. John Baptist in Bristol, in tenure of John Willye,— Malmesbury, Wilts; a messuage called le Checker, &c., in the parish of St. Peter the Poor in the ward of Bradstrete, London in tenure of Hen. Fyssher, and land in the parish of St. Giles without Crepulgate, London, late in tenure of John Rastall and now of Roger Metcalfe, —Halywell, Midd. ; a brewhouse called le Cuppe in the parish of St. Michael at Quenehythe in tenure of John Cokkes, and two messuages, &c., in Tymberhethstrete there,—Graces; seven cottages in Holborne in the parish of St. Giles, Midd. (between Turrnpiklane on the east and the tenement of Hen. Gaffeney on the west, the highway on the north and the field of Jas. Norryce on the south) leased to Thomas Ellys,—St. John's of Jerusalem; a curtilage called a backesyde within the site of the late Friars Minors, tenants John Baynton and Edw. Lache; a messuage, &c., in the parish of St. Botolph without Algate, tenant Ric. Johnson,—Graces; a garden in the parish of St. Anne within the site of the late Friars Preachers, tenant Wm. Taylor, and a garden in the same parish in tenure of Thos. Wasshington and messuage there in tenure of Fras. Vandrisluste—Friars Preachers; a messuage, &c., in the parish of St. Benet, tenant Philip Lawrence,— Austin Friars; two messuages, &c., in the parish of St. Stephen in Colmanstrete, tenant Thos. Browne,—Charterhouse. Del. Westm., 23 Sept. 36 Hen. VIII.— S.B. (signed by Canterbury, Westminster, Petre, Bakere, Sir Robt. Southwell, Moyle, Bacon and Cbydley). Pat. p. 6, m. 11. 35. Thomas Sheldon, of Worcester, and Laurence Poyner, of Tewkesbury, Glouc. Grant, in fee, for 413l. 3s. 4d., of numerous tenements, &c. (specified) in tenure of John Poker, cardmaker. Ric. Hasylwood, skinner, Joan Porter, Ric. Powyke pinner. John Adams, carder, Thos. Edwardes and Isabella Walton and her son Robert in Worcester, of Robt. Comyn, John and Alice Hyer, John Bridges alias. Hooper, the said Laur. Poyner. Ric. Wakeman. Wm. Alye, Thos. Jones, glover, and John Geffereys in Tewkesbury, Glouc, and of the said Laur. Poyner, in Walton next Tewkesbury, Glouc,—Tewkesbury; a messuage (specified) in Worcester, in tenure of John Monox, lands in Colwall, Heref., in tenure of John Ellys, tithes in Brockeberye within Codyngton parish, Heref., in tenure of Wm. Colley, rent and service from lands in Esynghope in Dodenham. Parish, Worc, of one Stapull and Ric. Tellam,—Greater Malverne priory; messuages (specified) formerly in tenure of John and Agnes Broke, and now of Walter Tomkyns alias Wever and his family (named) in Worcester,—Lesser Malverne priory; a messuage, &c., in Toterhyll, Salop, in tenure of Ric. Mynde, —St. John's of Jerusalem and Dynmore preceptory; numerous lands (specified) in Asteley and Dunvo. Salop, within the manor of Asteley Brugge alias Asteley Abbatis. and in Northeley alias Nordeley, Salop, in tenure of John Bayllye, Rose Chese, widow, and her son Wm. Chese and Joan his wife, Edw. and Alice Harley, Ric. 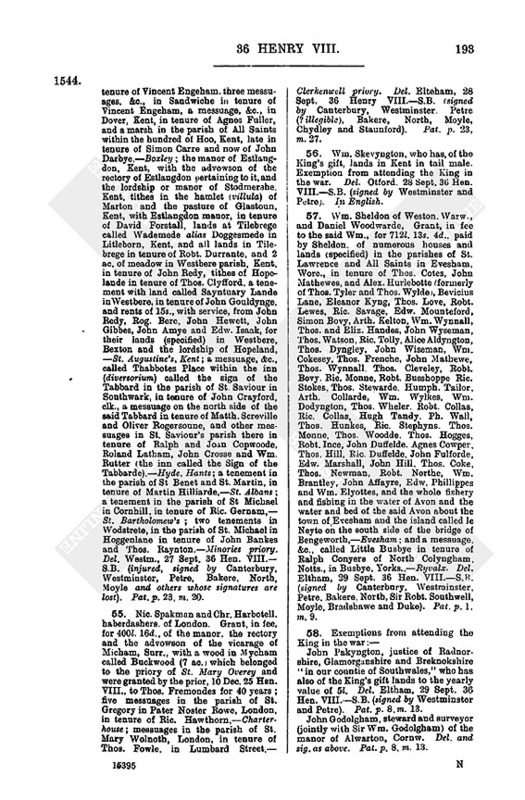 Chese, Hugh Webbe alias Walker, and John Webbe alias Walker and his family (named,—mon. of St. Peter and Paul in Shrewsbury; and lands (specified and tenants named) in Huntyngdon and Parva Wenlocke, Salop, in tenure of Thos. Chorleton, Wm. Yorke and his family (named). Thos. son of Wm. Chorleton, Wm. Carter and Hen. Carter, —Wenlocke. Except woods called Waltons Woode in Walton beside Tewkesbury and le Wrekyn Woode, Culmerwoode, and Tymberwoode in Huntyngdon and Parva Wenlocke, and Nordeley Woode within the manor of Aste ey Brugge. Del. Westm., 24 Sept. 36 Hen. VIII.—S.B. (signed by Canterbury, Hertford, Westminster. Petre, Bakere, Sir Robt. Southwell, Moyle, Whorwood and Sewester). Pat. p. 6, m. 18. 36. John Wrothe. Grant, in fee, for 37l. 18s. 8d., of lands called Holeham and Myddeldyche, in tenure of Sir Ant. Kyngeston, within the manor of Tewkesbury, Glouc, and a messuage. &c., called le Rodehouse, formerly in tenure of Hugh Mullock and now of Daniel Perte, within the borough of Tewkesbury, parcel of Northey manor, Glouc, which premises are parcel of the lands called Warwykes Landes. Also grant, in fee, for 6182. 8s. 4d., of the reversion of messuages, &c., in the parish of St. Mary Matfelon, London, which were granted to Nic. Sympson for life, by pat. 16 Sept. 31 Hen. VIII., viz. Those in tenure of Thos. Gage (formerly of Ric. Patenson), Hen. Chetam (formerly of Thos. Gage), Ric. Martin, Ric. Nele("le Hertes Home"), Thos. Barons or Barnes, and Thos. Wardall,—Minories; the advowson of the rectory of Chylton, Berks..—Abendon; the house, &c., of the late Grey Friars in Salisbury, Wilts; a messuage and melting house in tenure of John Bere, founder, and Agnes his wife, in the parish of St. Olave in Old Jewry, a messuage in tenure of Etheldreda Bodfelde, widow, in the parish of St. Leonard in Estchepe, a messuage there in tenure of Ric. Mundes (between Edw. Tracy's tenement called le Angell on the south and the messuage of St. Dunstan's church in the West in tenure of Thos. Stevyns. grocer, on the north, the tenement of Thos. Owtred. Butcher, which formerly belonged to Christchurch mon. in Canterbury on the west and the highway on the east), two messuages called le Crosse Keyes in the parish of St. Andrew in Estchepe in tenure of John Chylderley, turner, a messuage, &c., in tenure of Thos. Twynne alias Twyne in the parish of St. Martin Owtwiche in Bysshopsgate Street (between the tenement of the Mercers' Company late in tenure of Thos. Brandon, "jugler," on the south, and the tenement of St. Helen's priory in tenure of Robt. Collyn, draper, on the north), a messuage formerly called le Crystofer and now called le Crowne on the Hoope, in tenure of Simon Goldsmyth, blacksmith, in the parish of St. Sepulchre without Newgate (near the bars of the Olde Baily) and a shop there formerly in tenure of Marg. Downe and now of the said Simon. —St. Bartholomew's in West Smithjield; a messuage, &c., in tenure of Wm. Apryce in St. John's Street, parish of St. Sepulchre aforesaid (between the tenement of Wm. Arowsmyth on the east and that of Nic. Russheton on the west, that of Wm. Rigges on the north and the highway on the south), a messuage, &c., formerly in tenure of John Taverner and now of John Cordall, two others formerly in tenure of Thomas Blakewell and John Dothwate and now of John Cordall, another in tenure of John and Agnes Bowlande, and fourteen others in tenure of Joan Crome, widow, all in the parish of St. Sepulchre without Newgate,—St. John's of Jerusalem; a messuage in tenure of Ant. Crofton, an inn called the Castell formerly in tenure of John Jolselthe and now of Roger Rowsey, and a messuage in tenure of Robt. 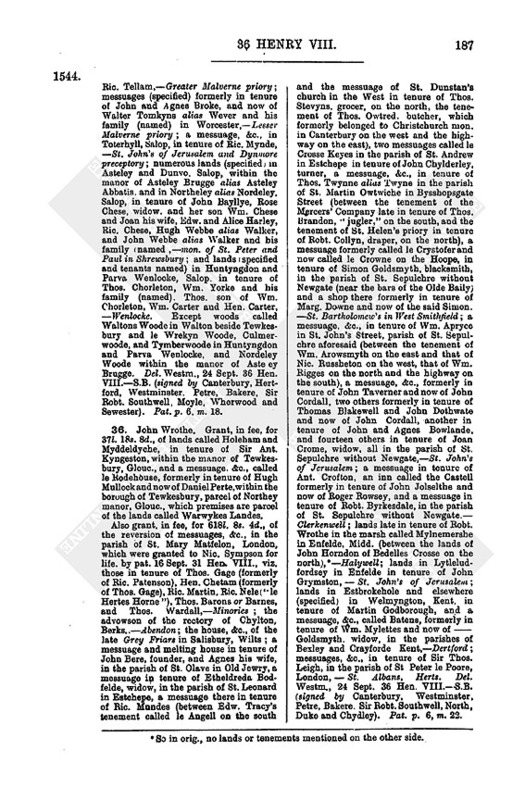 Byrkesdale, in the parish of St. Sepulchre without Newgate.— Clerkenwell; lands late in tenure of Robt. Wrothe in the marsh called Mylnemershe in Enfelde, Midd. (between the lands of John Horndon of Bedelles Crosse on the north), (fn. n12) —Halywell; lands in Lytleludfordsey in Enfelde in tenure of John Grymston,—St. 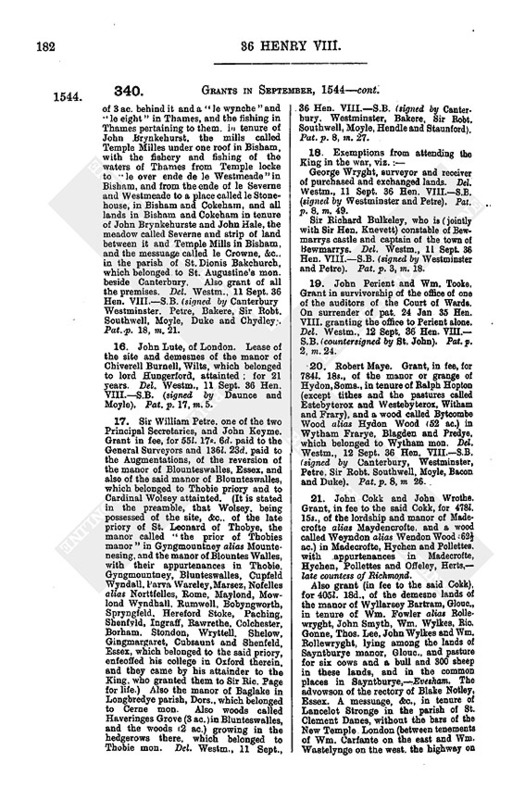 John's of Jerusalem; lands in Estbrokehole and elsewhere (specified) in Welmyngton, Kent, in tenure of Martin Godborough, and a messuage, &c., called Batens, formerly in tenure of Wm. Mylettes and now of-––– Goldsmyth. widow, in the parishes of Bexley and Crayforde Kent,—Dertford; messuages, &c., in tenure of Sir Thos. Leigh, in the parish of St Peter le Poore, London,—St. Albans, Herts. Del. Westm., 24 Sept. 36 Hen. VIII.—S.B. (signed by Canterbury, Westminster, Petre, Bakere. Sir Robt. Southwell, North, Duke and Chydley). Pat. p. 6, m. 22. 37. Elizabeth countess of Shrewsbury, relict of George late earl of Shrewsbury. Grant, in fee, for 145l. 12s. 4d., of the manor or lordship of Eryth alias Leosnes, Kent, which belonged to the late Queen Jane, also the land now covered with water in Eryth. and woods called Seuersden (30 ac. ), Lindewoode (50 ac. ), Frydayhill (20 ac. . and Courte Woode (4 ac), in Eryth. Del. Westm., 24 Sept. 36 Hen. VIII.—S.B. (signed by Canterbury, Westminster. Petre, North, Sir Robt. Southwell, Moyle, Bradshawe and Bacon). Pat. p. 6, m. 32. 38. Thos. Norton, grocer, of London. Grant, in fee, for 208l., of a messuage. &c., called the Sonne in the parish of St. Mary Wolnoth in Lombard Street, London, which belonged to Stradford Langthorn mon., Essex, in tenure of Jas. Mychill; the rectory and the advowson of the vicarage of Stretley alias Streteley, Beds., which belonged to Markeyate priory, in tenure of Wm. Burre. Del. Westm., 24 Sept. 36 Hen. VIII—S.B. (signed by Canterbury, Westminster, Petre, Bakere, North, Moyle, Chydley and Bacon). Pat. p. 8, m. 17. 39. Roger Hyghame, of London, and Wm. Grene, merchant tailor, of London. Grant, in fee, for 912l. 8s. 4¼d., of messuages, &c., in London, viz. :—In the parish of St. Stephen in Colmanstret, in tenure of John Edwardes,—College of Acon; in the parish of St. Martin in le Vintrye, in tenure of Adam Eyer, in the parish of St. Botolph without Algate, in tenure of John and Joan Foxe and fourteen others (named), in the parish of St. Mary Matfelon, in tenure of Thos. Barnard, Edw. Wardall, Eliz. Pyntney, Thos. Atkyns and Thos. Lambe, and in the parish of St. Lawrence in Old Jewry, in tenure of Wm. Gresham,—Minories; in Howndesdiche in the parish of St. Botolph without Algate, in tenure of Wm. 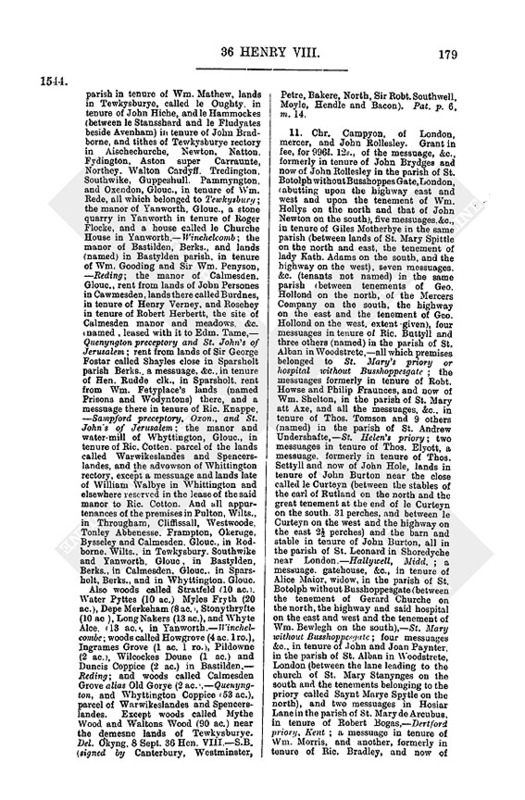 Weden and nine others (named) and in Algatestrete in the same parish, in tenure of Hugh Brett,—Graces; in the parish of St. Sepulchre without Newgate, in tenure of Wm. Nuthall,—Clerkenwell priory; in the parish (several of them in the churchyard) of St. Botolph without Algate, in tenure of Robt. Laynge and nine others (named),—Graces; in the parish of St. Mary Matfelon without and near Algate, in tenure of John Ward,— Minories; in the parish of St. Helen, in tenure of Wm. Shirborne, Robt. Owtred and three others (named), in the parish of St. Ethelburga, in tenure of Miles Wymbyche and two others (named), and in the parish of St. Swithin, in tenure of Wm. Seyman,—St. Helen's priory; in the parish of St. Mary Abchurche, in tenure of Ric. Plottinge and Wm. Cornewalys, and in the parish of St. John in Walbroke, in tenure of John Walter,—Acon college; in the parish of St. Helen, in tenure of Ric. Staverton,—St. Helen s priory; in the parish of St. John in Walbroke in tenure of Robt. Lilborne and four others (named), and also in tenure of Jas. Fynche (between the preceding on the east, the tenements belonging to Whitington College on the west, the Skinners' hall on the north and Pater Noster Lane on the south),—Minories; in the parish of St. Pancras within the city of London, in tenure of John Sircocke and in the parish of St. Michael in Bassinglane, in tenure of Thos. Ravenyng and John Watson,—Acon college; in the parish of St. Bartholomew the Little in Breadstreate in tenure of Robt. and Agnes Ratclif, and in the parish of St. Martin within Ludgate in tenure of John Yardeley,— free chapel of St. Martin le Graunde; in the parish of St. Helen, in tenure of John Dymmocke,—St. Helen's priory: in Whitecrosse Street in the parish of St. Giles without Crepulgate in tenure of Ric. Cull,—Hallywell; in the parish of St. Stephen in Colman Street, in tenure of Ric. Hochenson, and in the parish of St. Olave in Markelane, in tenure of Thos. Villers, — Charterhouse; in the parish of St. Mary Magdalen in the Old Fishery in tenure of Robt. and Agnes Ratclif,—St. Martin's le Grande; in the parish of iSt. Botolph without Algate, in tenure of Ric. Nicolson,—St. Mary Graces; in the parish of St. Mary de Arcubus, in tenure of Thos Abraham,— Minories; in the parish of St. Sepulchre without Newgate, in tenure of Wm. Esquyer,—Hallywell. Also the advowson of the vicarage of Northlye, Oxon,— Hayles, Glouc. ; lands in Southlangton, Line, in tenure of Vincent Grantham,— St. Katharine's priory beside Lincoln. Also grant, in fee, for 90l., of the grange of Langton beside Wragby alias Hamlok Langton, Line.. in tenure of Ric Wadesley or Waddesley, and lands there in tenure of Thos. Tobey,'—Kyrkested. Del. Westm., 24 Sept. 36 Hen. VIII— S.B. (signed by Canterbury. Westminster, Petre, Bakere, North, Sir Robt. Southwell, Bacon and Duke). Pat. p. 14, m. 3. 40. Robert Chidley, attorney of the Court of First Fruits and Tenths. Grant, in fee. for 1.200l. 15s. 10d., of the lordships and manors of Lytle Wynsour and Burstocke, Dors., the rectory and the advowson of the vicarage of Burstock and the wood called Castell Woode (12 ac.) within the manor of Burstock, and all appurtenances in Lytle Wynsour, Brodwynsour, Burstock, Hurstoneshay, Hawkechurche, Brodepytte, Wheteham, Asteley, Wyllesland, Blackdowne and Childhay, Dors., which belonged to Ford mon., with all possessions of Ford in these places. Del. Westm., 25 Sept. 36 Hen. VIII.—S.B. (signed by Canterbury, Westminster, Petre, Bakere, North, Moyle, Sir Robt. Southwell, Hendle, Staunford and Bradshawe Pat. p. 1, m. 3. 41. Henry Clyderowe, of London, merchant tailor, and John Doggett. Grant, in fee to the said Henry, for 343l. 16d., of tenements in the parish of St. Giles without Crepulgate, London, in tenure of Jasper Smalpage, Nic. Jackeson, Hen. Wallys. Joan Palmer, Anne Chamber, Thos. Vale and Nic. Edwyn,— Hallywell mon., Midd. ; a tenement in the parish of St. Christopher, London, in tenure of Thos. Dadye,—Austin Friars; a tenement called le Cocke in the parish of St. Olave near the Tower, in tenure of Thos. Percyvall,—Crutched Friars: two tenements, &c., in the parish of St. Dunstan in the East, in tenure of Ant. Naples, seven in the parish of St. Botolph without Algate, in tenure of Nic. Moger and Hie. Marten, and four in the parish of All Hallows Staining, in tenure of Ric. Ambrose, — Graces beside the Tower; a tenement without Lndgate called Skynnersshoppe, another in tenure of the master of London Bridge, another in tenure of the master of St. Bartholemew's hospital beside Westsmythefelde, and another in tenure of Ralph Symondes, in the parish of St. Mary Magdalene Moysez, London, — Horseham priory, Norf. ; a tenement, &c., in the parish St. Anne within the site of the late Friars Preachers, London, in tenure of Doctor Herynges and lately leased to John de Gravia; a tenement called the Rose in the parish of St. Benet and ward of Baynerscastell, in tenure of Griffin Lewes, — St. Albans, Herts. ; a tenement, &c., in the parish of St. Olave in Silverstrete in tenure of Wm. Norterethe,—Charterhouse; a tenement, &c., in the parish of St. Botolph without Algate in tenure of Wm. Stephens,— Graces; a tenement in the parish of St. Giles without Crepulgate, in tenure of Marg. Roo, widow,—Hallywell; two tenements in the parish of St. Sepulchre without Newgate, in tenure of Hen. Garnesey, and others in tenure of Thos. Bysshoppe, Geoff. Hudson and Ant. Turneboll,—Charterhouse; the site, &c., of the late Carmelite Friars in Doncaster, Yorks., in tenure of Hugh Wirrall; an inn, &c., called le Lyon in the street called Hall Gate in Doncaster, in tenure of Alan and Marg. Malster, and a messuage, &c., in the street called Sepulchre Gate there, in tenure of Emmota Personson,— Carmelites. Doncaster; lands in Slepehill, Yorks., in tenure of Geoff. Holme, and in Brokhookes, Yorks., in tenure of Robt. Banaster, — Hampall nunnery. Del. Westm., 25 Sept. 36 Hen. VIII.—S.B. (signed by Canterbury, Westminster, Petre, North, Moyle, Hendle and Staunford). Pat. p. 1, m. 13. 42. Edward Gobtwyck, auditor of the Augmentations in South Wales and North Wales. Exemption from attending the King in the war. Del. Westm., 25 Sept. 36 Hen. VIII.—S.B. (signed by Westminster and Petre). Pat. p. 3, m. 25. In English. 43. John and George Mille. Grant, in fee, for 379l. 12s., of the manor of Quarre in the Isle of Wight, Hants., which belonged to Quarre mon. ; the site, &c., of the said mon. of Quarre, Hants. ; the grange of Newenham in the Isle of Wight and 269 ac. of land in Quarre and Newenham, formerly in tenure of the abbot of Quarre and now of the said John Mille; a messuage, &c., called Kemphyll in Newchurche parish, in the Isle of Wight, in tenure of Ric. and Joan Skynner; meadows called Pryston Meade and Monken Meade in St. Helen's parish, I. of Wight, in tenure of Wm. Layley; a messuage called le Fysshehouse, and pastures called le Olde Parke, Marmeade and Millefeld, the fishery and pasture for 20 sheep in Quarre parish, in tenure of John Olyver, Joan his daughter and Steph. Lesee; the grange and manor of Roughborough with its members (named) in the parishes of Caresbroke and Shorewell, I. of Wight, and the tithes of the same in tenure of Simon Payne; all which premises belonged to Quarre mon. Also a portion of tithes in Bartramesley alias Bartramsley, in the parish of Bolder, Hants., which belonged to the mon. of Crischurche Twyneham; a messuage called Luce Hays, a toft called Scottes Place and a cottage which Nic. Dewnale lately held in Soppeley, Hants., in tenure of Edw. and Matilda Pope and Maurice their son, which belonged to Bremmer priory, and rent of 4s. 11d. from a messuage called Pyttehouse in the parish of Crischurche Twyneham, pertaining to the said messuage of Luce Hayes. And all appurtenances of the premises in Quarre, Newchurche, Bradynge. Seint Ellyns, Newneham, Roughborough. Roughbridge Bryanesheth, Shorterige, Randon, Slanglonde alias Saltelonde Bartramsley, Luce Hayes, Scottes Place, Soppeley and Pittehouse, Hants. Also woods called East Wood (25 ac). Newnam Copp 3 ac.) within the manor of Quarre. which belonged to Quarre mon. Except advowsons,lead, &c., and pasture in the wood called Shafletewoode, which belonged to Quarre and is granted to lord Chancellor Wriothesley. Del. Westm., 25 Sept. 36 Hen. VIII.—S.B. (signed by Canterbury, Westminster, Petre, North, Moyle, Hendle and Staunford). Pat. p. 6, m. 25. 44. Joan Sydenham, widow. Grant, in fee, for 173l. 18s. 4d., of the lordship or manor of Whestawe or Whestowe in the parish of Lawrens Lyddeard, Soms., and the wood called Middyfford Woode (2½ ac.) pertaining to it,—Tauntonpriory; and a messuage, &c., in Godmanston alias Godmyston, in the parish of –––– (blank), Dors., in tenure of Robt. Robyns alias Robertes,—Cerne. Except the advowson of the rectory of Lawrens Lyddeard, which belonged to Taunton. Del. Westm. 25 Sept. 36 Hen. VIII.— S.B. (signed by Canterbury, Westminster, Peire, Bakere, North, Sir Robt. Southwell, Moyle, Chydley and Bacon). Pat. p. 6, m. 28. 45. John Pope and Ant. Foster, of London. Grant, in fee to the said Pope, for 996l. 14s. 4d. paid by Pope to the treasurer of Augmentations and 1l. 10s. to the treasurer of the Chamber, of 19 messuages, &c., in the parish of St. Bartholomew the Little, London, in tenure of Hen. Atkyn and others (named).— Hallywell, Midd. ; a messuage, &c., in the same parish, in tenure of John Heron, and two in tenure of John Exe,—Acon college; a messuage. &c., in Woodmancote beside Rancombe, Glouc. in tenure of Sir Edm. Tame,—Tewkysbury; a piece of void ground 13 ft. long and 13 ft. broad beside Soperlane in the parish of St. Pancras, London, in tenure of Hen. Showier,—St. Helen's priory; lands in the parish of –––– (blank), co. Montgomery, North Wales, in tenure of Ragnald ap William, —Strata Mercella; the manor of Yapton Shuldbrede. Suss., and rents and lands (specified) in Yapton aforesaid, in tenure of Wm. Staken, Thos. Hartley, Hen. Myll. Thos. Aleyne. David Michell, John Letveter and Thos. Dampner,—Sheldbrede priory; six messuages, &c., in the parishes of All Saints and St. Peter in the borough of Dorchester, in tenure of John Hatmaker, John Aden alias Barvett, John Wynter, John Bonde and John Corvyn. —Byndon; all messuages, &c., in Dorchester which belonged to Cerne mon. and Abbotisburie mon. ; a burgage. &c., in the borough of Birporte, Dors., and another there in the eastern part of Sooth Street, both in tenure of Robt. and Joan Merricke and their son William,—Abbotisbury; a burgage, &c., in Lyme, Dors., in tenure of John Abbot,—Dorchester; a messuage, &c., in the parish of St. Kirian in Oxford, late in tenure of Ph. 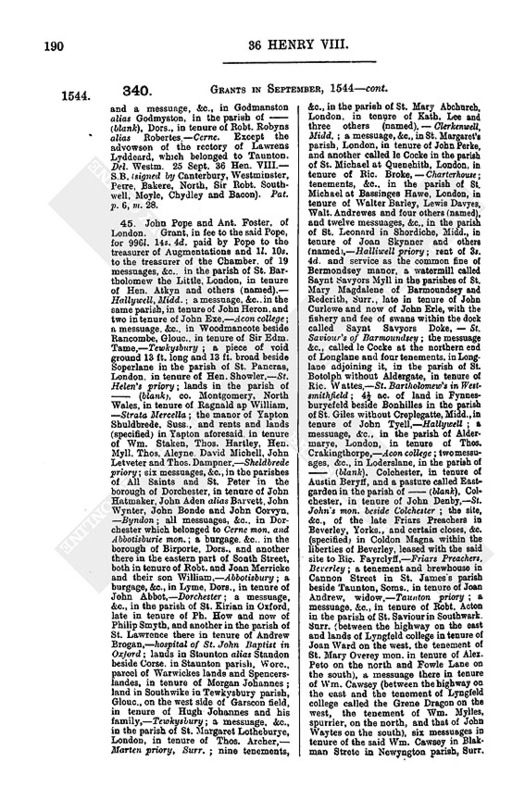 How and now of Philip Smyth, and another in the parish of St. Lawrence there in tenure of Andrew Brogan,—hospital of St. John Baptist in Oxford; lands in Staunton alias Standon beside Corse, in Staunton parish, Wore, parcel of Warwickes lands and Spencerslandes, in tenure of Morgan Johannes; land in Southwike in Tewkysbury parish, Glouc, on the west side of Garscon field, in tenure of Hugh Johannes and his family,—Tewkysbury; a messuage, &c., in the parish of St. Margaret Lotheburye, London, in tenure of Thos. Archer,— Marten priory, Surr. ; nine tenements, &c., in the parish of St. Mary Abchurch, London, in tenure of Kath. Lee and three others (named), — Clerkenwell, Midd. 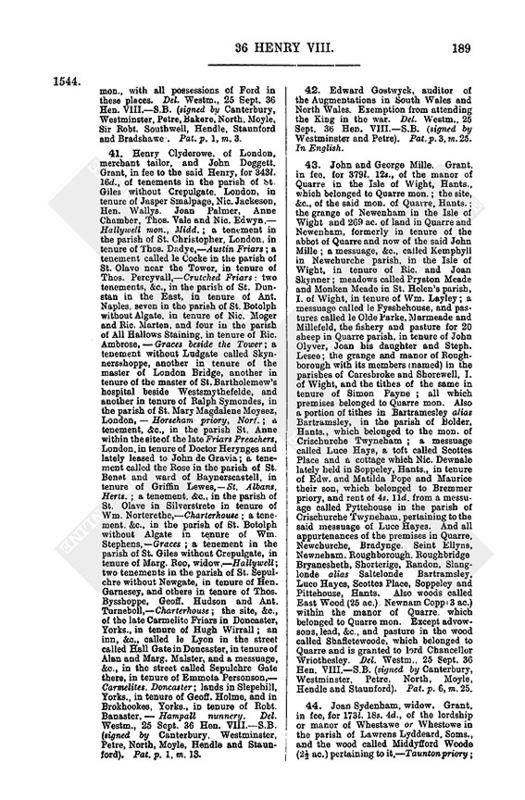 ; a messuage, &c., in St. Margaret's parish, London, in tenure of John Perke, and another called le Cocke in the parish of St. Michael at Quenehith, London, in tenure of Ric. Broke, — Charterhouse; tenements, &c., in the parish of St. Michael at Bassinges Hawe, London, in tenure of Walter Barley, Lewis Davyes, Walt. Andrewes and four others (named), and twelve messuages, &c., in the parish of St. Leonard in Shordiche, Midd., in tenure of Joan Skynner and others (named),—Halliwell priory; rent of 3s. 4d. and service as the common fine of Bermondsey manor, a watermill called Saynt Savyors Myll in the parishes of St. Mary Magdalene of Barmoundsey and Rederith, Surr., late in tenure of John Curlewe and now of John Erle, with the fishery and fee of swans within the dock called Saynt Savyors Doke, — St. Saviour's of Barmoundsey; the messuage &c., called le Cocke at the northern end of Longlane and four tenements, in Longlane adjoining it, in the parish of St. Botolph without Aldergate, in tenure of Ric. Wattes,—St. Bartholomew's in Westsmithfield; 4½ ac. of land in Fynnesburyefeld beside Bonhilles in the parish of St. Giles without Creplegatte, Midd., in tenure of John Tyell,—Hallywell; a messuage, &c., in the parish of Aldermarye, London, in tenure of Thos. Crakingthorpe,—Acon college; twomessuages, &c., in Loderslane, in the parish of –––– (blank), Colchester, in tenure of Austin Beryff, and a pasture called Eastgarden in the parish of-–––(blank), Colchester, in tenure of John Denby,—St. John's mon. beside Colchester; the site, &c., of the late Friars Preachers in Beverley, Yorks., and certain closes, &c. (specified; in Coldon Magna within the liberties of Beverley, leased with the said site to Ric. Fayrclyff,—Friars Preachers, Beverley; a tenement and brewhouse in Cannon Street in St. James's parish beside Taunton, Soms., in tenure of Joan Andrew, widow,—Taunton priory; a messuage, &c., in tenure of Robt. Acton in the parish of St. Saviour in Southwark. Surr. (between the highway on the east and lands of Lyngfeld college in tenure of Joan Ward on the west, the tenement of St. Mary Overey mon. in tenure of Alex. Peto on the north and Fowle Lane on the south), a messuage there in tenure of Wm. Cawsey (between the highway on the east and the tenement of Lyngfeld college called the Grene Dragon on the west, the tenement of Wm. Mylles, spurrier, on the north, and that of John Waytes on the south), six messuages in tenure of the said Wm. Cawsey in Blakman Strete in Newyngton parish, Surr, (between Horsemonger Lane on the east and Blakman Strete on the west, the land pertaining to the literary school at Gilforde on the north and that of the late hospital of St. Thomas the Apostle in Southwerke on the south), a messuage in tenure of Alex. Peyto in St. Saviour's parish, Southwark (between those in tenure of Thos. Farneshed, upholster, on the south and Wm. Cawsey, sadler, on the north, the highway of Southwark on the east and the Grene Dragon inn, in tenure of Joan Warde on the west),—St. Mary Overey. Del. Westm., 26 Sept. 36 Hen. VIII.—S.B. (signed by Canterbury, Westminster, Petre, Sir Robt. Southwell, North, Moyle, Bacon and Duke). Pat. p. 1, m. 5. 46. John Fynche, of Myddelton, Kent. Grant, in fee, for 487l. 17s. 11d., of the rectory of St. James in the Isle of Grene, Kent, now in his tenure, with the advowson of the vicarage,—St. Sexburga in the Isle of Shepey; a messuage in the parish of St. Michael in Cornehill, London, in tenure of Ric Ferraunde,— St. Mary Overey, Surr. ; a messuage called le Bell in the parish of St. Peter of Poverty, London, in tenure of Ric. Waddington,—St. Albans, Herts; a wharf called Presshewharf, and two messuages beside it iu the parish of St. Botolph beside Billingesgate, in tenure of Thos. Berthelet, and messuages at the same wharf in tenure of Robt. Lynes, Wm. Garrarde, John Bartram, Geo. Parkins and Robt. Wennes,—St. Mary Graces. Del. Westm., 26 Sept. 36 Hen. VIII.— S.B. (signed hy Canterbury, Westminster, Petre, Bakere, North, Sir Robt. Southwell, Moyle, Bacon and Duke). Pat. p. 1. m. 15. Thos. Barthelette, who has of the King's gift an annuity of 4l. a year. Del. Westm., 26 Sept. 36 Hen. VIII—S.B. (signed by Westmister and Petre). Pat. p. 2. m. 32. Robt. Derehawgh, one of the customers in the port of Ippeswich, Suff. Del. Okinge, 26 Sept. 36 Hen. VIII.—S.B. (signed by Westminster and Petre). Pat. p. 3, m. 12. Thos. Spilman, receiver of cos. Kent, Midd. and London, in the Court of Augmentations. Del. Okinge, 26 Sept. 36 Hen. VIII.—S.B. (signed by Westminster and Petre). Pat p. 3, m. 12. John Valentine, one of the customers in the port of Ippeswich, Suff. Del. Okinge, 26 Sept. 36 Hen. VIII.— S.B. (signed by Westminster and Petre). Pat.p. 3, m. 12. Reynold Dygby, who has, to him and the heirs male of his body, lands to the yearly value of 811. 6s. 8d. in cos. Suff., Yorks and Warw. Del. Okinge, 26 Sept. 36 Hen. VIII—S.B. (signed by Westminster and Petre). Pat. p. 3, m. 12. In English. Morgan Wolf, who has of the King's gift, to him and his heirs male, houses in London to the net yearly value of 18l., and is also the King's goldsmith. Del. Westm., 26 Sept. 36 Hen. VIII—S.B. (signed by Westminster and Petre). Pat. p. 18. m. 30. John Waterhouse, auditor of the earldom of JMarche and of the late lord Beamondes lands. Del. Westm., 26 Sept. 36 Hen. VIII—S.B. (signed by Westminster and Petre). Pat. p. 22, m. 11. Wm. Wygston, receiver of the honour of Tutbury, Staff., and deputy receiver (to James Chapleyn alias Cruse) of the lord Beamondes lands. Del. Westm.. 26 Sept. 36 Hen. VIII—S.B. (signed by Westminster and Petre Pat. p. 22, m. 23. John Higford, keeper of Chellesmore park, Warw., pertaining to the Duchy of Cornwall. Del. Westm.. 26 Sept. 36 Hen. VIII—S.B. (signed by Westminster and Petre). Pat. p. 22, m. 23. 48. Wm. Wylford, sen., John Bennet, George Brykes, Ric. Polyn, Wm. Barlowe. Walt. Yonge, Emanuel Lucar, Wm. James, Wm. Ridgeley, Nic. Wolberde, Wm. Sadooke, Thos. Richardes, Thos. Walker, Thos. King, Reginald Conygrave, John Whitpayne, Ric. Tonge, John Armyn, Fras. Pope, Hen. Clyderowe, Robt. Brooke, John Dokett, John Hoskyns, Robt. Holson, John Mirfyn, Simon Lowe. George Eton, Wm. Campion, Edw. Lee, John Wythers, Thos. Emerye, Thos. Crosbye, John Traves, Steph. Mason, David Gyttons, Ric. Eddes, John Hethe, jun.. Thos. Love, Alex. Kerbyne and John Strellaye, merchant tailors, of London. Grant, in fee, for 466l. 13s. 4d, of the manors of Offame. Snodbeame and Pypyngstrawe Kent, with appurtenances in Offame, Ryasha, Yalden and Brancheley. Kent, late parcel of the lands of John Leighe, in tenure of George Clerke; and the manor or messuage called Caldehame, Kent, with appurtenances in Emistone, Capell and Fulkeston, Kent, late parcel of the lands of Sir Ant. Browne, in tenure of Thos. Joll. This grant to be void if the purchase money is repaid within a year. Del. Westm., 26 Sept. 36 Hen. VIII—S.B. (signed by Hertford, Petre, North, Hendle and Caryll). Pat. p. 5, m. 11. 49. Wm. Haynes. Lease of the demense lands of Moulton manor, Ntht., and the warren of coneys there parcel of Warwikeslandes; for 21 years. This on surrender of lease 10 Feb. 20 Hen. VIII to Thos. Rouse, whose interest therein the said Wm. 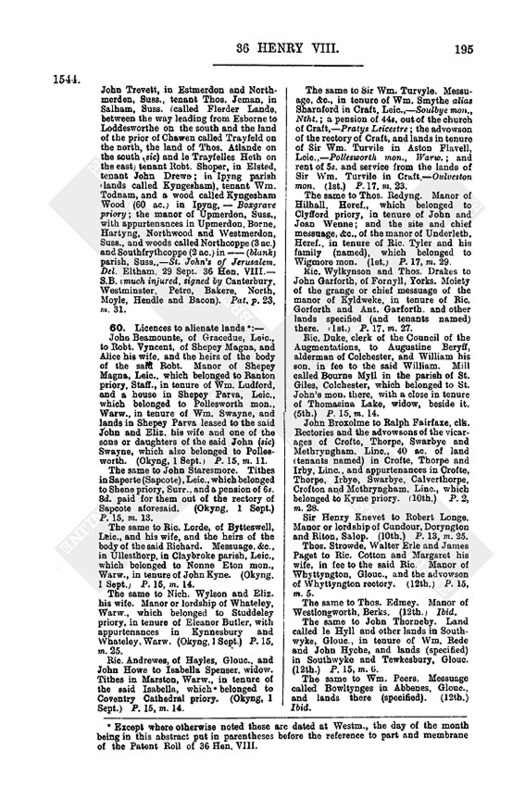 purchased by indenture of 3 April 22 Hen. VIII—S.B. (signed by Daunce and Moyle). Pat. p. 17. m. 17. 50. Thos. Knot. Lease of a pasture called lez Ilond and Greneword and meadow in Portmanmore, and other lands (names and extents given) late in tenure of John Wastel, parcel of the lordship of Roth, co. Glamorgan, and of the possessions of Jasper duke of Bedford; for 21 years. Del. Westm., 26 Sept. 36 Hen. VIII.— S.B. (signed by Westminster and Petre). Pat. p. 18, m. 12. 51. Thos. Godwyne. Grant, in fee, for 1,122l. 2s. 6d. of messuages, &c., in the parish of St. Giles without Crepulgate, London, in tenure of Thos. Pollett, Thos. Watson, Hen. Cheyne, John Mytye, Robt. Madyas, Jas. Carden,Ric. Howlett, Wm. Myte and Thos. Augustine,—Hallywell priory; the manor of Tale and Pahembury. in the parishes of Pahembury, Plymtre and Colempton, Devon,—Ford; the manor of Sheagh in Sheagh parish, Devon,—Plympton priory; the messuage, etc., called Abbottes in the parish of Molland alias Batters Moland, Devon, in tenure of Ant. Deye. and a messuage, &c., in Moore alias Moore Town, in Bedyford parish, Devon, in tenure of Ric Penhorewod,—Hartland priory; numerous messuages, &c., (specified and tenants named) in the borough of Taunton. Soms.,—Taunton priory; two messuages in tenure of Wm. and John Cardiff in the parishes of St. Peter and Holy Trinity in the borough of Dorchester, Dors.,—Abbottesbury; the advowson of the vicarage of Leygysby, Line,—Sixhyll; lands called Lyme Abbottes alias Shyrborn Holme in the parish of Lyme Regis, Dors.,—Sherborn; lands called Grascrofte in tenure of John Carvannell and others (named) and four messuages in Canonstrete in tenure of Robt. Meryck and others (named) in the parish of St. Jamesbesides Taunton,—Taunton priory; messuages, &c., in Rempston in the parish of Corff Castell, Dors., in tenure of Roger Clavell, John Myller and John Trewe, and in Wych and Fytwurth and Salterne. in the said parish, in tenure of Roger Clavell. Nic. Fyssher and Nic. Talbott, and lands in tenure of John Myller in Myddelbear and Salter in the parish of Holy Trinity of Wareham, Dors.,—Cerne; messuages, &c., in tenure of Walt. Burges and three others (named) in Owre and Foxland, in the parish of Corff Castell, and lands or islands called Saynt Elyns Fursey, Dors.,—Mylton; a messuage,&c., in the parish of St. Clement Danes without the bars of the New Temple, London, (between those of Thos. Richardes on the east and Abraham Metcalff on the west, the highway on the north and the Middle Temple garden on the south) in tenure of John Lawbery, and another in tenure of Abraham Metcalff between it and the inn of the bp. of Exeter,—St. John's of Jerusalem; the advowson of the rectory of Canffeld, Suss.,—Thomas Cromwell, earl of Essex, attainted; messuages, &c., in St. Helen's parish, within the close of the late priory of St. Helen, London, in tenure of John Ryan, Laur. Cockes, Jas. Megryme, Petronilla Williamson and ––––– Capell,—St. Helen's priory; a messuage called the Ancres Lodgyng in the parish of St. Anne within the site of the late Friars Preachers in London, in tenure of the chancellor of Rochester; a messuage, &c., in the parish of St. Peter of Poverty, in tenure of George Asshe,— Austin Friars; the site, &c., of the late Austin Friars in the town of Rye, Suss., with a close there in tenure of Wm. Oxenbrygge.—Austin Friars, Rye; divers messuages in Feyterlane in the parish of St. Andrew in Holborn in the suburbs of London, in tenure of Humph. Wellys. now granted to Sir Wm. Pounder and Margaret his wife for life,—St. Mary Overey priory; a messuage, &c., called the Garland in the parish of St. Alban in Woodstrete. London,—St. Albans, Herts; a wood called Remston Woode (20 ac. )in the parish of Corff Castell. Dors., and woods in Myddelbear and Salter in the parish of Holy Trinity of Warbam, Dors., in tenure of John Myller, and in Wych, Fytwurth and Salter in the parish of Corff Castell in tenure of Rog. Clavell, Nic. Fyssher and Nic. Talbott,—Cerne. Del. Westm., 26 Sept. 36 Hen.VIII.—S.B. (slightly injured, signed by Canterbury, Westminster. Petre, Bakere. North, Sir Robt. Southwell, Moyle, Chydley and Staunford). Pat. p. 23, m. 38. 52. Edward Bowland, of London. Grant, in fee. for 30l. 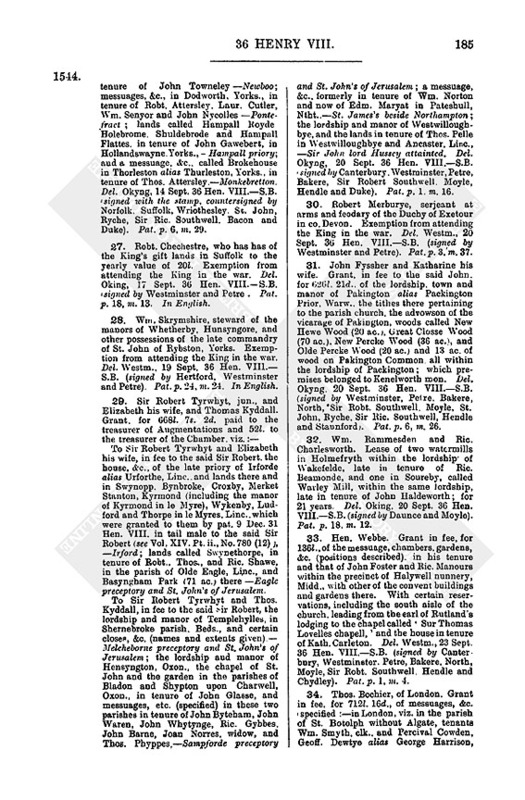 13s., of the reversion of messuages, &c., in Churche Alley in the parish of St. Nicholas at the Shambles in Westsmythfeld in the parish of St. Sepulchre and in the parish of St. Andrew in Holborn, London, granted 27 May 14 Hen. VII. to Thos. Grenewaye for life, and afterwards confirmed, by pat. 16 Feb. 5 Hen. VIII. to the said Thomas and the heirs male of bis body. Also grant, in fee, for 113l. 6s. 8d., of two messuages in tenure of Wm. Abbott and Pb. Yorke in the parish of St. Pancras London, which belonged to Merton mon., Surr. Del. Westm., 27 Sept. 36 Hen. VIII.—S.B. (signed by Canterbury. Westminster, Petre, Bakere, North, Moyle, Bacon and Duke). Pat. p. 1, m. 25. 53. Andrew Wadham, keeper of Sherpham park, Soms. Exemption from attending the King in the war. Del. Westm., 27 Sept. 36 Hen. VIII.—S.B. (signed by Hertford and Westminster). Pat. p. 17, m. 4. In English. 54. John Master, of Sandwiche, Kent, merchant, and Thomas Master. Grant, in fee, for 1.138l. 10d., of lands called Boxley Lees and le Harpe in the parish of Woodnesburgh alias Wynsburgh, Kent, in. tenure of Vincent Engeham, three messuages, &c., in Sandwiche in tenure of Vincent Engeham, a messuage, &c., in Dover, Kent, in tenure of Agnes Fuller, and a marsh in the parish of All Saints within the hundred of Hoo, Kent, late in tenure of Simon Carre and now of John Darbye,—Boxley; the manor of Estlangdon, Kent, with the advowson of the rectory of Estlangdon pertaining to it, and the lordship or manor of Stodmershe. Kent, tithes in the hamlet (villula) of Marton and the pasture of Glastoun, Kent, with Estlangdon manor, in tenure of David Forstall, lands at Tilebrege called Wademede alias Doggesmede in Litleborn, Kent, and all lands in Tilebrege in tenure of Robt. Durrante, and 2 ac. of meadow in Westbere parish, Kent, in tenure of John Redy, tithes of Hopelande in tenure of Thos. Clyfford. a tenement with land called Sayntuary Lande inWestbere, in tenure of John Gouldynge, and rents of 15s., with service, from John Redy, Rog. Bere, John Hewett, John Gibbes, John Amye and Edw. Isaak, for their lands (specified) in Westbere, Bexton and the lordship of Hopeland, —St. Augustine's, Kent; a messuage, &c., called Thabbotes Place within the inn (diversorium) called the sign of the Tabbard in the parish of St. Saviour in Southwark, in tenure of John Crayford, clk., a messuage on the north side of the said Tabbard in tenure of Matth. Screville and Oliver Rogersoune, and other messuages in St. Saviour's parish there in tenure of Ralph and Joan Copwoode, Roland Latham, John Crosse and Wm. Rutter (the inn called the Sign of the Tabbarde),—Hyde, Hants; a tenement in the parish of St Benet and St. Martin, in tenure of Martin Hilliarde,—St. Albans; a tenement in the parish of St Michael in Cornhill, in tenure of Ric. Gernam,— St. Bartholomew's; two tenements in Wodstrete, in the parish of St. Michael in Hoggenlane in tenure of John Bankes and Thos. Raynton,—Minories priory. Del. Westm., 27 Sept. 36 Hen. VIII.— S.B. (injured, signed by Canterbury, Westminster, Petre, Bakere, North, Moyle and others whose signatures are lost). Pat. p. 23, m. 20. 55. Nic. Spakman and Chr. Harbotell, haberdashers, of London. Grant, in fee, for 400l. 16d., of the manor, the rectory and the advowson of the vicarage of Micham, Surr., with a wood in Mycham called Buckwood (7 ac.) which belonged to the priory of St. Mary Overey and were granted by the prior, 10 Dec. 25 Hen. VIII., to Thos. 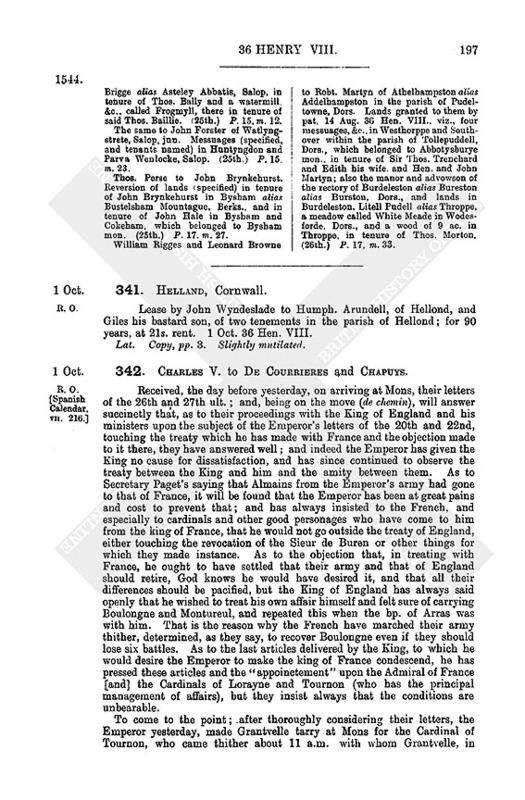 Fremondes for 40 years; five messuages in the parish of St. Gregory in Pater Noster Rowe, London, in tenure of Ric. Hawthorn,—Charterhouse; messuages in the parish of St. Mary Wolnoth, London, in tenure of Thos. Fowle, in Lumbard Street,— Clerkenwell priory. Del. 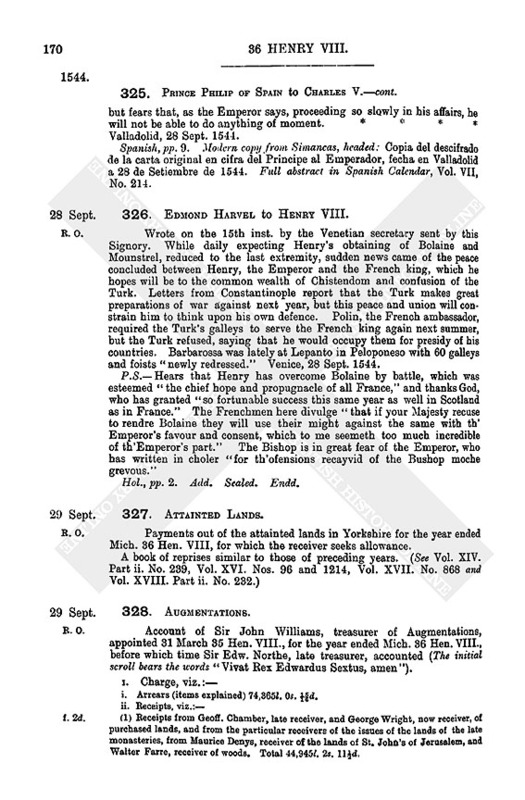 Elteham, 28 Sept. 36 Henry VIII.—S.B. (signed by Canterbury, Westminster. Petre (? illegible), Bakere, North, Moyle, Chydley and Staunford). Pat. p. 23, m. 27. 56. Wm. Skevyngton, who has, of the King's gift, lands in Kent in tail male. Exemption from attending the King in the war. Del. Otford. 28 Sept. 36 Hen. VIII.—S.B. (signed by Westminster and Petre). In English. 57. Wm. Sheldon of Weston. 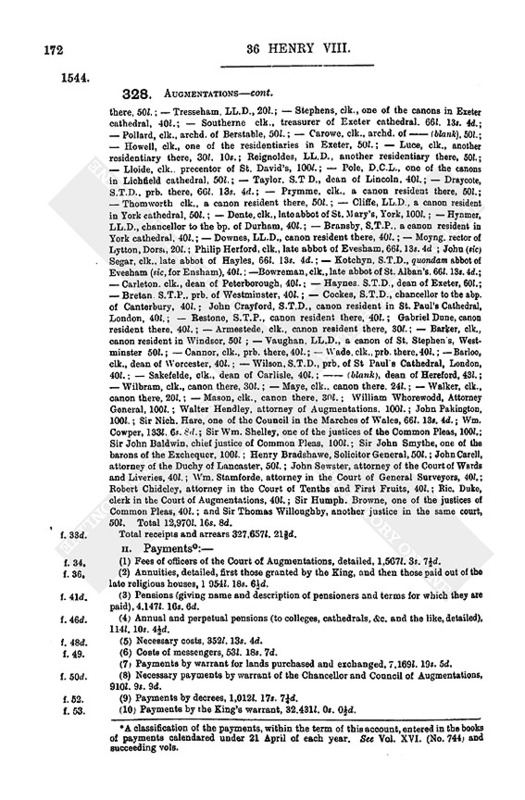 Warw., and Daniel Woodwarde, Grant, in fee to the said Wm., for 712l. 13s. 4d., paid by Sheldon, of numerous houses and lands (specified) in the parishes of St. Lawrence and All Saints in Evesham, Wore, in tenure of Thos. Cotes, John Mathewes, and Alex. Hurlebotte (formerly of Thoa. Tyler and Thos. Wylde), Bevicius Lane, Eleanor Kyng, Thos. Love, Robt. Lewes, Ric. Savage, Edw. Mounteford, Simon Bovy, Arth. Kelton, Wm. Wynnall, Thos. and Eliz. Handes, John Wyseman, Thos. Watson, Ric. Tolly, Alice Aldyngton, Thos. Dyngley, John Wiseman, Wm. Cokesey, Thos. Frenche, John Mathewe, Thos. Wynnall. Thos. Cleveley, Robt. Bovy. Ric. Monne, Robt. Busshoppe Ric. Stokes, Thos. Stewarde, Humph. Tailor, Arth. Collarde, Wm. Wylkes, Wm. Dodyngton, Thos. Wheler. Robt. Collas, Ric. Collas, Hugh Tandy. Ph. Wall, Thos. Hunkes, Ric. Stephyns. Thos. Monne, Thos. Woodde, Thos. Hogges, Robt. Ince, John Duffelde, Agnes Cowper, Thos. Hill, Ric. Duffelde, John Fulforde, Edw. Marshall, John Hill, Thos. Coke, Thos. Newman, Robt. Northe, Wm. Brantley, John Affayre, Edw. Phillippes and Wm. Elyottes, and the whole fishery and fishing in the water of Avon and the water and bed of the said Avon about the town of, Evesham and the island called le Neyte on the south side of the bridge of Bengeworth,—Evesham; and a messuage. &c., called Little Busbye in tenure of Ralph Conyers of North Colyngham, Notts., in Busbye, Yorks.,—Ryvalx. Del. Eltham, 29 Sept. 36 Hen. VIII.—S.B. (signed by Canterbury, Westminster, Petre, Bakere. North, Sir Robt. Southwell, Moyle, Bradshawe and Duke). Pat. p. 1. m. 9. John Pakyngton, justice of Radnorshire, Glamorganshire and Breknokshire "in our countie of Southwales," who has also of the King's gift lands to the yearly value of 5l. Del. Eltham, 29 Sept. 36 Hen. VIII.—S.B. (signed by Westminster and Petre). Pat. p. 8,m. 13. John Godolgham, steward and surveyor (jointly with Sir Wm. Godolgham) of the manor of Alwarton, Cornw. Del. and sig. as above. Pat. p. 8, m. 13. Wm. Goodyng, auditor of possessions late of Thos. Cromwell earl of Essex and Walter lord Hungerford, attainted. Del. Westm., 29 Sept. 36 Hen. VIII.—S.B. (sig. as above). Pat. p. 17, m. 14. Gregory lord Crumwell, who has of the King's gift lands in tail male in cos. Leic. and Monmouth. Del. Eltham, 29 Sept. 36 Hen. VIII.—S.B. (signed by Westminster and Petre). Pat. p. 23, m. 11. John Worthe, keeper of Petherton park, Soms., who has an annuity of 24l. l0d. Del. and sig. as above. Pat p. 23, m. 12 (undated). In English. 59. Henry Audeley and John Cordall. Grant, in fee, for 1,194. 10s. 2d., of numerous messuages, &c. (specified, now or formerly in tenure of Geo. Butler, John Corke, Ric. Fletcher, Robt. Flenys, Ric. Watte, Hen. Gape, Hen. Onyons, Steph. Cawney, Thos. Chaddysley, Ric. Ranshawe or Rayneshawe, Thos. Jonhson (sic), Thos. Ferrys, Steph. Cartlage, Wm. Stepneth, Marg. Thorne.Reg. Carte, Wm. Locky, Thos. Keymer, Geo. Spygaunce, Edw. Smythe, John Taverner, Thos. Kynge, clk., Hen. Daye, Wm. Cranewell, Geo. Date. Thos. Porter, John and Eliz. Broke, Wm. Ledbetter. Wm. Mudwynne, Eliz. Warren, John Bynge, Agnes Mudwynne, Robt. Wanton, Ric. Weste, Ralph Rowlatte, Thos. Podysace, Edw. Spendelowe, Hen. Bestney, John Spencer, Thos. Bradford and Wm. Everard), in St. Albans, Herts. ("Hereford" in pat.).—St. Albans; a close in the parish of Stagisden, Beds, (between the park and the bounds of Astwood, in tenure of Robt. Taylour,—[Harwold? ]; a tenement, &c., in Eastdepyng, Line, in tenure of Wm. 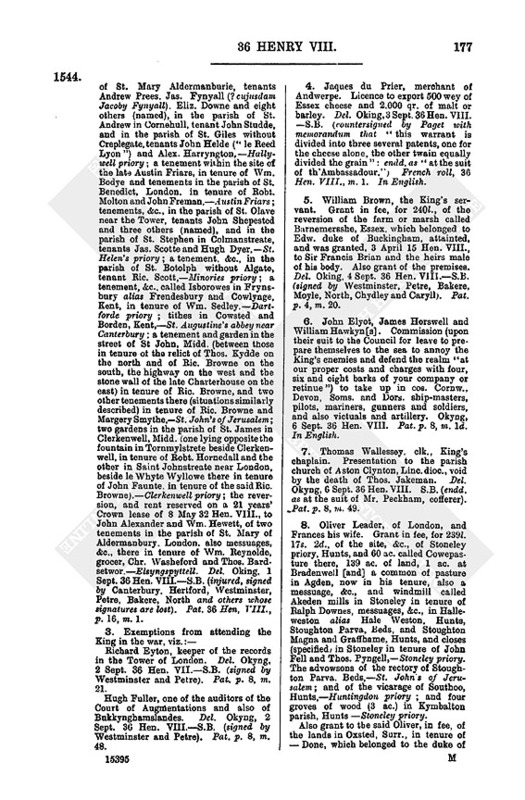 Smyth.—Lavenden; twelve messuages in Phillipelane in the parish of St. Alphege, London, in tenure of Joan Chenner and others (named) and a messuage in Whitecrossestrete in the parish of St. Giles without Crepellgate in tenure of Edm. Goodwynne,—Elsyngspittel priory; a, messuage, &c., in St. Olave's parish near the Tower, in tenure of Leonard Dolte,—Carmelite Friars; the site, &c., of the late mon. of Whitland co. Carm., and certain of its demesne lands (specified) in the parish of Llanvedy and Llangam in tenure of John Vaughan, and a wood called Coyd Alterinayne (12 ac.) there,—Whytland; a close called Yernesden Cloose or Yernesden Woode in Lathebury parish, Bucks., in tenure of Nic. Barnewell, lands in Gayhurst parish, Bucks., in tenure of Wm. Whyte, wood called Yernesden Grove or Spryng and the hedgerow beside Wyndemylne Poste (5 ac.) in Lathebury parish, except the wood called Yernesden Woode (16 ac.) in Lathebury,—Lavenden; rent and service from lands in Parva Fynsted, Bucks., of George Bulstred, a great field in Horton called Greate Fynsted, in tenure of Jas. Edwardes, and rents and service from lands in Horton in tenure of Geo. Woodwarde, Geo. Miller and John Grove,— Bustelesham alias Byssam; a watermill called Newmyll in Kyngeswood, Wilts, late in tenure of Geo. 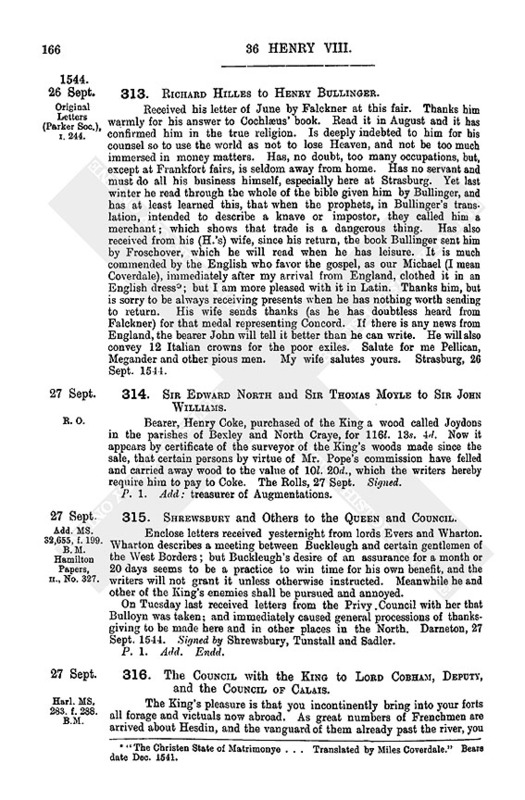 Monnox, —Kinges wood abbey; a messuage, &c., in Aldermaynbury parish, London, in tenure of Ric. Stafferton, and a messuage, &c., called "the Pye in the Royall" in the parish of St. Michael called Pater Noster Church near le Royall, London, in tenure of Ralph Walton,—Elsyngspytle priory; a messuage, &c., in the parish of St. Peter at Pawles Warffe, London, in tenure of Ric. Stafferton,—St. Helen's priory within Busshopsgate; 7 ac. of meadow within the parish and lordship of Stannelwell, Midd., in tenure of Ric. Rogers, and closes called Bakers Felde and Dores Pytell in Tottenham, Midd.,in tenure of John Weler,—Kylborne priory, a messuage. &c., in tenure of John and Dorothy Wheler in St. John's Lane in Clerkenwell parish (between the garden in tenure of Joan Overton and a cottage and garden in tenure of Thos. Checeley on the south, and the way leading to a close called Butclose on the north, St. John's Lane on the east and the garden in tenure of Constance Bennet on the west),—St. John's of Jerusalem; messuages, &c., in the parish of St. Michael in Crokelane, London, in tenure of John Fybrydge and Nic. Leverrett,—freechapel of St. Mary Magdalene in Kyngston upon Thames; a messuage, &c., called le Ploughe in Fletelane in St. Sepulchre's parish in the suburbs of London, in tenure of Thos. Pyryman.—Christchurch priory, London; a cottage, &c., in the parish of St. Botolph without Busshopsgate, London, in tenure of Wm. Bennett, and a tenement there in tenure of Kath. Chambre—Elsyngsyptle priory; a great messuage called le Bulle, &c., in the parish of St. Ethelburga, London, in tenure of Thos. Larke,—St. Helen's priory; a messuage. 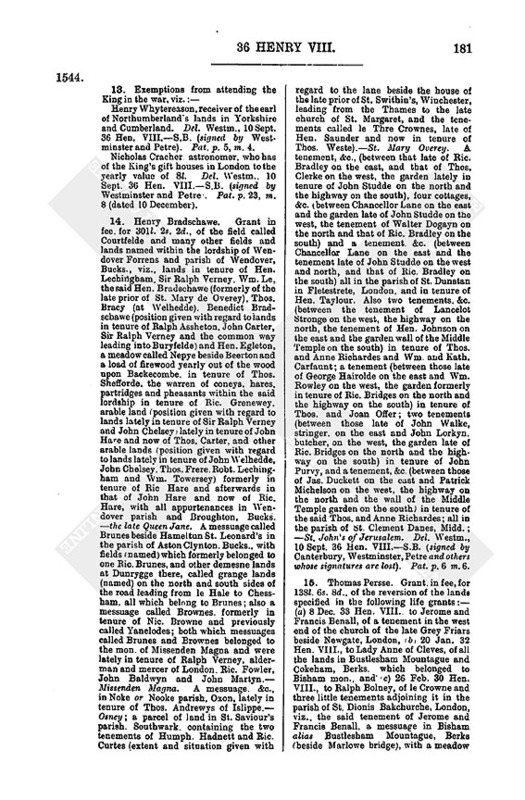 &c., in the parish of St. Sepulchre without Newgate, London, in tenure of Thos. Sutton, and two there (with a brewhouse) in tenure of John Cordall,— Charterhouse; a messuage, &c., and a garden and stable in tenure of Guthlac Overton in St. John's Street, in St. Sepulchre's parish, a messuage there in tenure of Giles Hamond, a messuage and brewhouse called le Whyte Harte there in tenure of Walter Phillippe, two messuages there in tenure of Wm. Pope, a garden there in tenure of Reginald Carter, a messuage there in tenure of Ric. Shawe and a stable leased to John Cordall (boundaries of each specified) which belonged to St. John's of Jerusalem; messuages, &c. (specified) in Elsted, Suss., tenant John Gredge, in Compton parish, Suss., tenant John Trevett, in Estmerdon and Northmerden, Suss., tenant Thos. Jeman, in Salham, Suss, (called Flerder Lande, between the way leading from Esborne to Loddesworthe on the south and the land of the prior of Chawen called Trayfeld on the north, the land of Thos. Atlande on the south (sic) and le Trayfelles Heth on the east) tenant Robt. Shoper, in Elsted, tenant John Drewe; in Ipyng parish lands called Kyngesham), tenant Wm. Todnam, and a wood called Kyngesham Wood (60 ac.) in Ipyng, — Boxgrave priory; the manor of Upmerdon, Suss., with appurtenances in Upmerdon, Borne, Hartyng, Northwood and Westmerdon, Suss., and woods called Northcoppe (3 ac.) and Southfrythcoppe (2 ac.) in-–––(blank) parish, Suss.,—St. John's of Jerusalem. Del. Eltham, 29 Sept. 36 Hen. VIII.— S.B. (much injured, signed by Canterbury, Westminster, Petre, Bakere, North, Moyle, Hendle and Bacon). Pat. p. 23, m. 31. John Beamounte, of Gracedue, Leic, to Robt. Vyncent, of Shepey Magna, and Alice his wife, and the heirs of the body of the said Robt. Manor of Shepey Magna, Leic, which belonged to Ranton priory, Staff., in tenure of Wm. Ludford, and a house in Shepey Parva, Leic, which belonged to Pollesworth mon., Warw., in tenure of Wm. Swayne, and lands in Shepey Parva leased to the said John and Eliz. his wife and one of the sons or daughters of the said John (sic) Swayne, which also belonged to Pollesworth. (Okyng, 1 Sept.) P. 15, m. 11. The same to John Staresmore. Tithes in Saperte (Sapcote), Leic., which belonged to Shene priory, Surr.. and a penaion of 6s. 8d. paid for them out of the rectory of Sapcote aforesaid. (Okyng, 1 Sept.) P. 15, m. 13. The same to Ric. Lorde, of Bytteswell, Leic, and his wife, and the heirs of the body of the said Richard. Messuage, &c., in Ullesthorp, in Claybroke parish, Leic, which belonged to Nonne Eton mon., Warw., in tenure of John Kyne. (Okyng, 1 Sept.) P. 15, m. 14. The same to Nich. Wylson and Eliz. his wife. Manor or lordship of Whateley, Warw., which belonged to Studdeley priory, in tenure of Eleanor Butler, with appurtenances in Kynnesbury and Whateley, Warw. (Okyng, 1 Sept.) P. 15, m. 25. Ric Andrewes, of Hayles, Glouc, and John Howe to Isabella Spenser, widow. Tithes in Mars ton, Warw., in tenure of the said Isabella, which * belonged to Coventry Cathedral priory. (Okyng, 1 Sept.) P. 15, m. 14. The same to Sir Wm. Turvyle. Messuage, &c., in tenure of Wm. Smythe alias Sharnford in Craft, Leic,—Soulbye mon., Ntht. ; a pension of 44s. out of the church of Craft,—Pratys Leicestre; the advowson of the rectory of Craft, and lands in tenure of Sir Wm. Turvile in Aston Flavell, Leic,—Pollesworth mon., Warw. ; and rent of 5s. and service from the lands of Sir Wm. Turvile in Craft,—Oulveston mon. (1st.) P. 17, m. 23. The same to Thos. Redyng. Manor of Hilhall. Heref., which belonged to Clyfford priory, in tenure of John and Joan Wenne; and the site and chief messuage, &c., of the manor of Underleth, Heref., in tenure of Ric. Tyler and his family (named), which belonged to Wigmore mon. (1st.) P. 17, m. 29. Ric. Wylkynson and Thos. Drakes to John Garforth, of Fornyll, Yorks. Moiety of the grange or chief messuage of the manor of Kyldweke, in tenure of Ric. Gorforth and Ant. Garforth. And other lands specified (and tenants named) there. (1st.) P. 17, m. 27. Ric. Duke, clerk of the Council of the Augmentations, to Augustine Beryff, alderman of Colchester, and William his son, in fee to the said William. Mill called Bourne Myll in the parish of St. Giles, Colchester, which belonged to St. John's mon. there, with a close in tenure of Thomasina Lake, widow, beside it. (5th.) P. 15, m. 14. John Broxolme to Ralph Fairfaxe, clk. Rectories and the advowsons of the vicarages of Crofte, Thorpe, Swarbye and Methryngham. Line, 40 ac. of land (tenants named) in Crofte, Thorpe and Irby, Linc., and appurtenances in Crofte, Thorpe, Irbye, Swarbye, Calverthorpe, Crofton and Methryngham, Line, which belonged to Kyme priory. (10th.) P. 2, m. 28. Sir Henry Knevet to Robert Longe. Manor or lordship of Cundour, Doryngton and Riton, Salop. (10th.) P. 13, m. 25. Thos. Strowde, Walter Erle and James Paget to Ric. Cotton and Margaret his wife, in fee to the said Ric. Manor of Whyttyngton, Glouc, and the advowson of Whyttyngton rectory. (12th.) P. 15, m. 5. The same to Thos. Edmey. Manor of Westlongworth, Berks. (12th.) Ibid. The same to John Thorneby. Land called le Hyll and other lands in Southwyke, Glouc, in tenure of Wm. Rede and John Hyche, and lands (specified) in Southwyke and Tewkesbury, Glouc. (12th.) P. 15, m. 6. The same to Wm. Peers. Messuage called Bowltynges in Abbenes, Glouc, and lands there (specified). (12th.) Ibid. The same to Hen. Brouncker. All their lands in Wescott and Sparsholt, Berks. (Oking, 12 Sept.) Ibid. The same to Sir Thos. Seymour and Hen. Brouncker. All their lands in Calmesdon, Golde Gore and Northe Cerney, Glouc. (Oking, 12 Sept.) Ibid. The same to Roger Yonge. Manor of Bastildene, Berks., and all their lands there. (12th.) P. 15, m. 7. The same to Thos. Yate. Lands called Chaldewikes in Garford, in Marcham parish, Berks. (12th.) P. 17, m. 21. The same to Edm. Myllys. Manor of Rodborn Chanew, Wilts., and the rectory and the advowson of the vicarage of Rodborne aforesaid. (12th.) P. 17, m. 30. John Maynard and Wm. Breton to Thos. Vaughan, of St. Albans. A barn and tenements in Dagenhall and 20 ac. of land called Gumberdes in tenure of George Warren, and tenement, &c., in tenure of Jas. Joyner, in St. Albans, Herts., which belonged to St. Albans mon. ; also a watermill called Walkemyll alias Hethmyll in Chaddesley, Wore.. which belonged to Bordesley mon., in tenure of Thos. Forest, and the lands (named) leased with it. (12th.) P. 15, m. 10. John Taseborough and Nic. Savell to Wm. Romsden, of Longley, Yorks., and James More, clk. Site. &c., of Kirkleys priory, Yorks, in tenure of Thos. Savell, and lands there (names and extents given) leased with the said site; and woods called Northwood and Southcoopes, which belonged to Kirkleys. (12th.) P. 17, m. 24. John Broxolme to Matth. Sayntpoull. 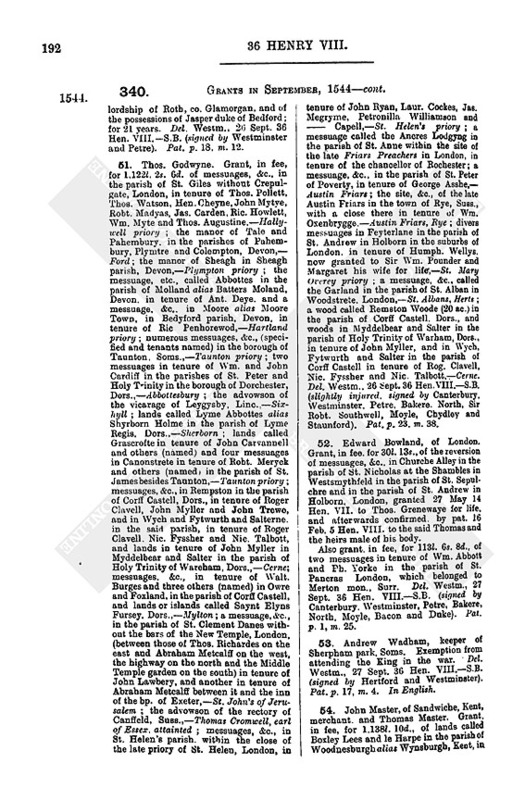 Chief messuage, &c., in tenure of John Tourney in Snellande, Line, and the advowson of the parish church of Snelland, which belonged to Barlynges mon. (12th.) P. 17. m. 30. John Cokk and John Wrothe to Ric. Bartlat. Demesne lands of Wyllarsey Bartram manor, Glouc, in tenure of Wm. Fowler alias Rollewryght and six others (named) in Sayntburye, among the lands of Sayntbury manor, Glouc, which belonged to Eveshammon., and pasture for one bull, six cows and 300 sheep on the said demesne lands of the manor of Wyllarsey Bartram. (13th.) P. 17. m. 22. Thos. Strowde, Walter Erie and Jas. Pagett to Wm. Compton. Manor of Througham, Glouc, and all possessions of the late mon. 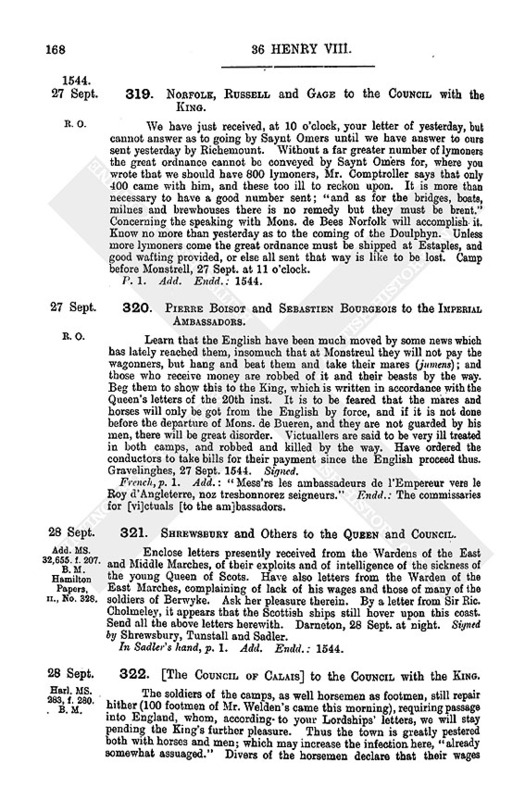 of Circencester in Througham, Clyssale, Westwood, Tonley, Frampton and Okeringe Glouc (13th ) P. 17. m. 30. Thos. Strowde, Walter Erie and Jas. Pagett to Wm. Rede. Site, &c., of Tewkesbury mon., Glouc, the grange called le Abbottes Barton, certain fisheries and pastures (specified) there and a portion of tithes in Aischurche, Newton, Natton, Fydyngton, Aston super Carant, Northey, Walton Cardyff, Tredyngton, Sowthwik, Guppeshull, Pamyngton, and Oxonden. Glouc, in tenure of the said Wm. Rede and Thos. Lane. (14th) P. 17. m. 31. Wm. Romsden or Ramsden to Fras. Samwell. Site of the late White Friars in Northampton, in tenure of Fras. Samwell, a close called Shylde Close with a pond therein on the east side of the dormitory of the said priory, in tenure of Ric. Johnson, and all possessions of the priory within the said site; also the site of the late Black Friars there, with a garden therein in tenure of Hen. Henley, except buildings, lead, &c. (Okyng, 15 Sept.) P. 15. m. 7. The same to Thos. Smythe. Messuage, &c., in Pudsey, Yorks.. which belonged to Kyrkestall mon., in tenure of the said Thos. Smythe. (Okyng, 15 Sept.) Ibid. The same to Ric. Stanffeld. Messuages, &c., in tenure of Ralph Walker and others named; in Welbourne, (Okyng, 15 Sept.) P. 15, m. 11. The same to Robt. Parker, Manor of Bereclyff and Extwysell, Lane, which belonged to Newbo mon., Line, in tenure of John Towneley, (Okyng, 15 Sept.) P. 17, m. 22. The same to Ric. Bonny. Grange called Loscoo Grange, Yorks., and a close called Monkeynge in yketon (sic), Yorks., which belonged to Kirkstall mon., in tenure of Joan Redman, widow, and Normaviles Redeman. (Okyng, 15 Sept.) P. 17, m. 31. The same to Wm. Hamond. Messuage, &c., called Spyttelfall and Grangeflattes in tenure of Wm. Hungate, in Saxton, Yorks., which belonged to St Leonard's hospital in York. (Okyng, 15 Sept.) Ibid. Ric. Bridges and John Knyght to John Saunderson. Messuage, &c., inNewbery, Berks., on the west side of Chepstrete, which belonged to the Crossed Friars of Donyngton. in tenure of the said John Saunderson. (24th.) P. 15, m. 8. The same to Thos. Dolman and Eliz. His wife. Messuage in Northebrokestrete there, which belonged to the said Crossed Friars, in tenure of Thos. Dolman. (24th.) Ibid. John Wrothe to Hen. Humfrey, of Bexley. 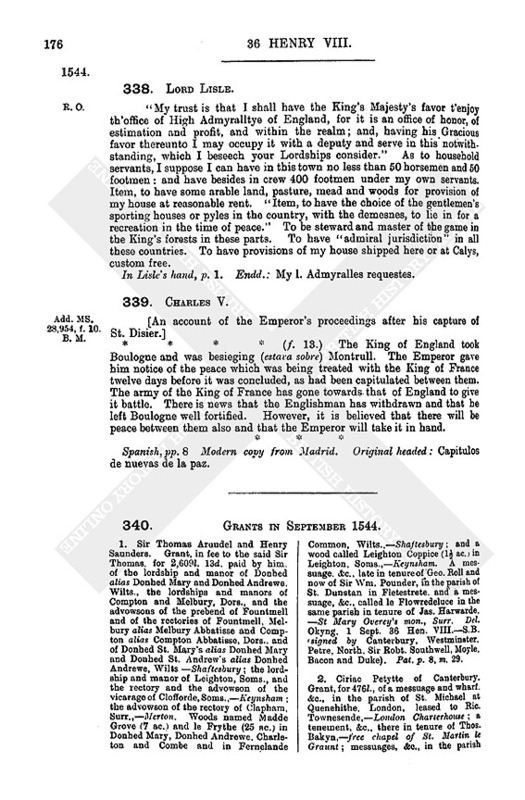 Lands (specified) in Welmyngton or Melmyngton, Kent, in tenure of Martin Godborowe. and a messuage, &c., called Batens, formerly in tenure of Wm. Millettis and now of the relict of-–––Goldsmyth, in the parishes of Bexley and Crayford, Kent, which belonged to Dertford mon. (25th.) P. 15, m. 12. Thos. Sheldon and Laur. Poyner to William Baillye. Two closes called le Two Stakynges in Northeley Wood within the lordship or manor of Asteley Brigge alias Asteley Abbatis, Salop, in tenure of Thos. Bally and a watermill, &c., called Frogmyll, there in tenure of said Thos. Baillie. (25th.) P. 15, m. 12. The same to John Forster of Watlyngstrete, Salop, jun. Messuages (specified, and tenants named) in Huntyngdon and Parva Wenlocke, Salop. (25th.) P. 15. m. 23. Thos. Perse to John Brynkehurst. Reversion of lands (specified) in tenure of John Brynkehurst in Bysham alias Bustelsham Mountague, Berks., and in tenure of John Hale in Bysham and Cokeham, which belonged to Bysham mon. (25th.) P. 17. m. 27. William Rigges and Leonard Browne to Robt. Martyn of Athelhampston alias Addelhampston in the parish of Pudeltowne, Dors. Lands granted to them by pat. 14 Aug. 36 Hen. VIII.. viz., four messuages, &c., in Westhorppe and Southover within the parish of Tollepuddell, Dors., which belonged to Abbotysburye mon., in tenure of Sir Thos. Trenchard and Edith his wife, and Hen. and John Martyn; also the manor and advowson of the rectory of Burdeleston alias Bureston alias Burston, Dors., and lands in Burdeleston, Litell Pudell alias Throppe, a meadow called White Meade in Wodesforde, Dors., and a wood of 9 ac. in Throppe, in tenure of Thos. Morton. (26th.) P. 17; m. 33.
n1. The Earl of Lennox. n7. "The Christen State of Matrimonyedate . . . Translated by Miles Coverdale." Bears date Dec. 1541.
n8. These exemptions are enrolled on the Patent Roll and may be found among the Grants from July onwards. n9. A classification of the payments, within the term of this account, entered in the books of payments calendared under 21 April of each year. See Vol. XVI. (No. 744) and succeeding vols. n12. So in orig., no lands or tenements mentioned on the other side. n13. Except where otherwise noted these are dated at Westm., the day of the month being in this abstract put in parentheses before the reference to part and membrane of the Patent Roll of 36 Hen. VIII.